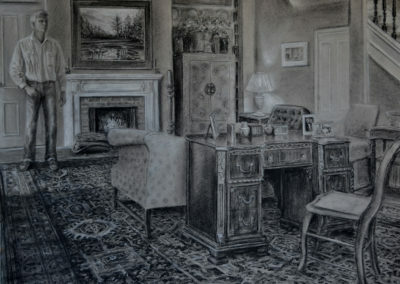 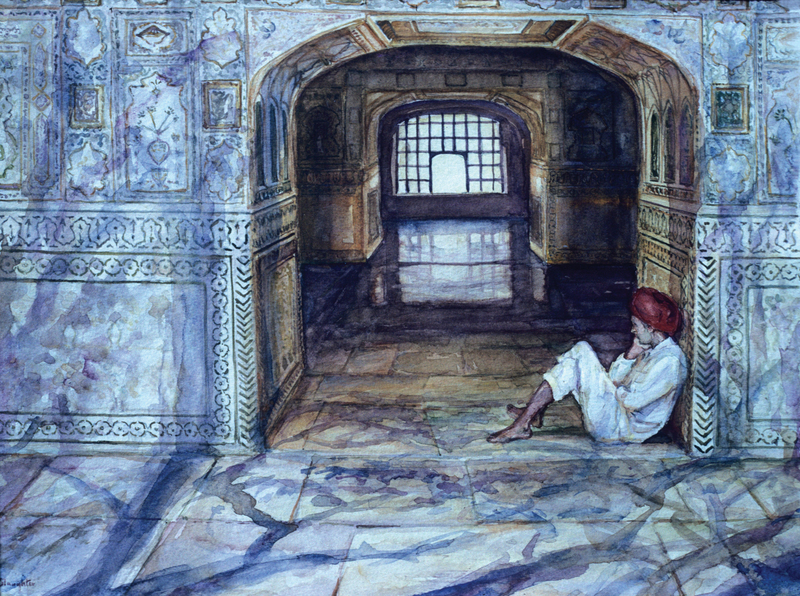 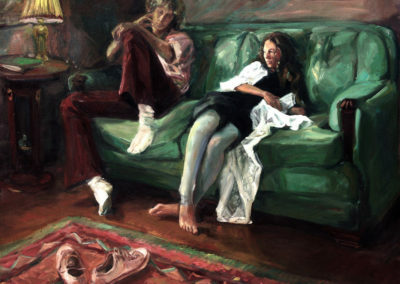 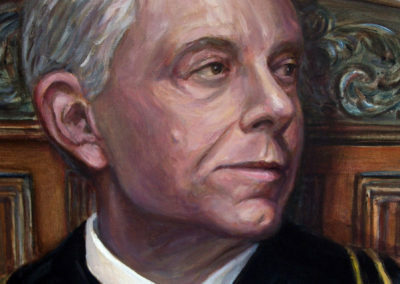 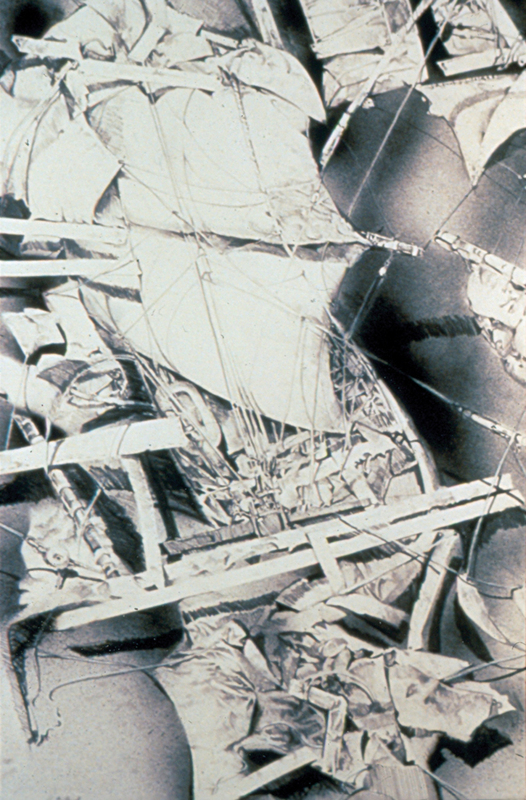 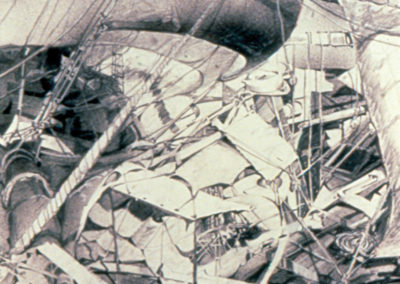 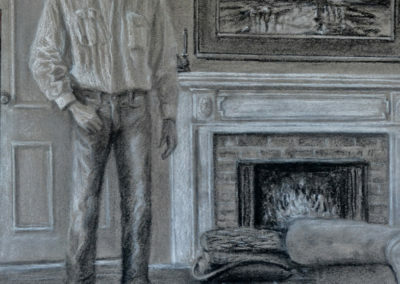 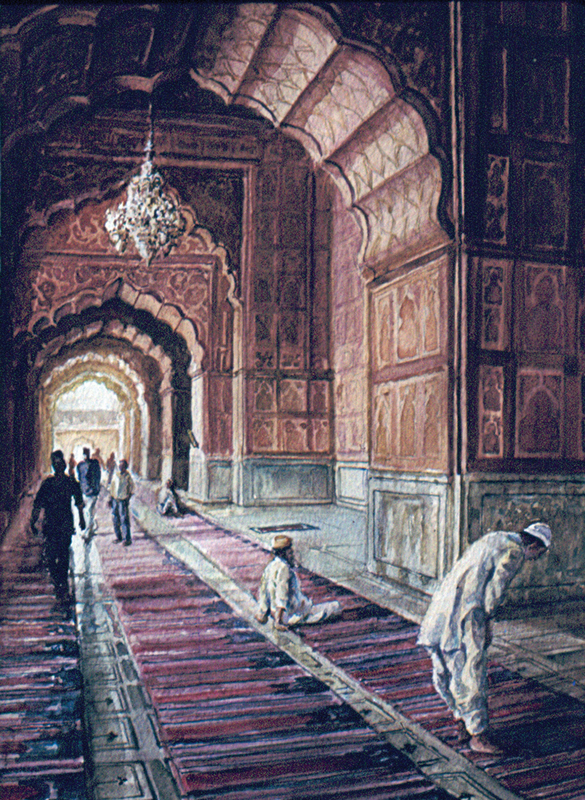 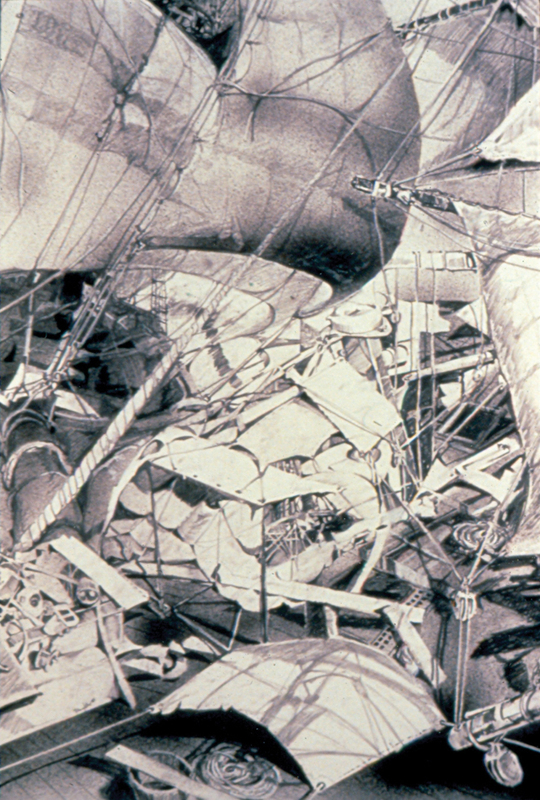 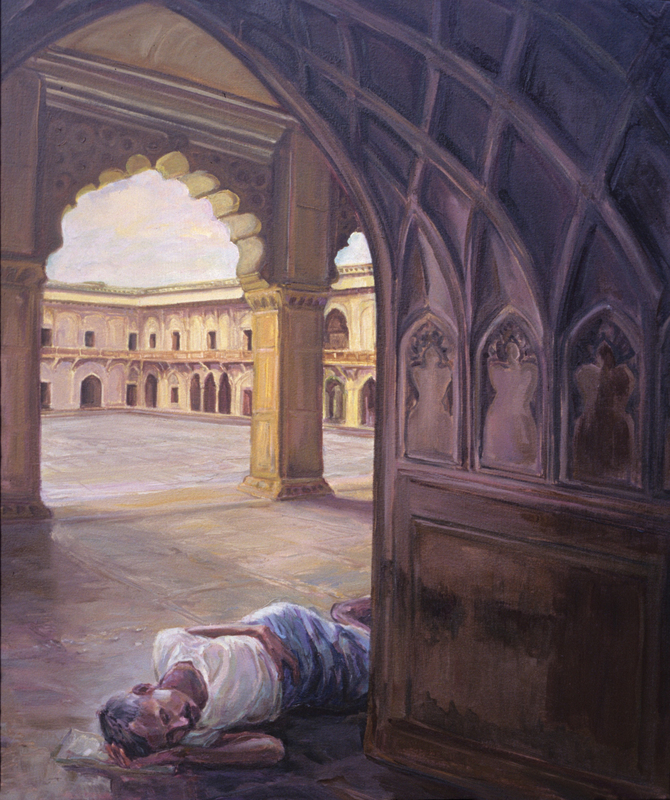 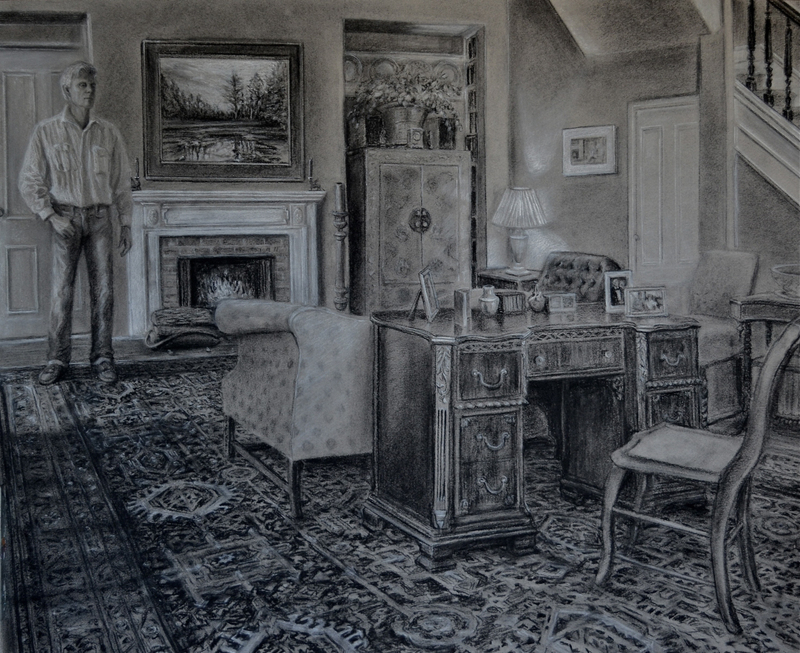 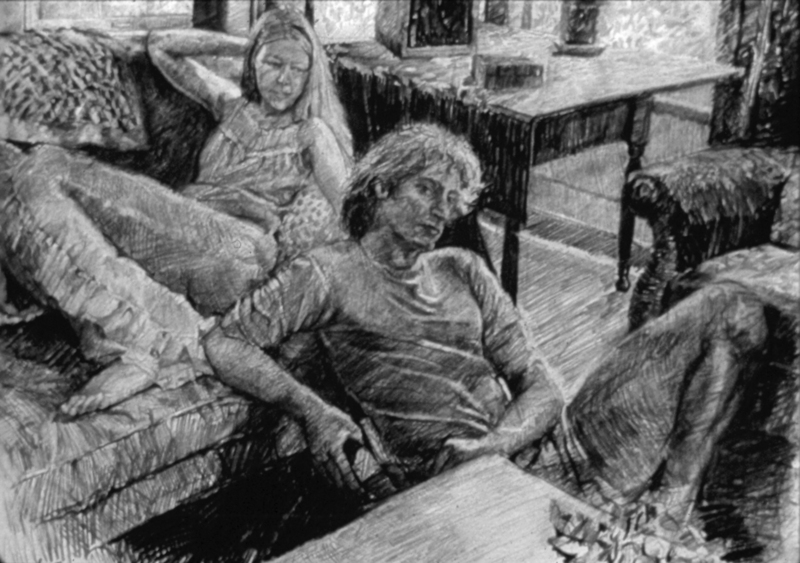 The drawings and paintings comprising this series were based on a Fulbright Fellowship in 1992. 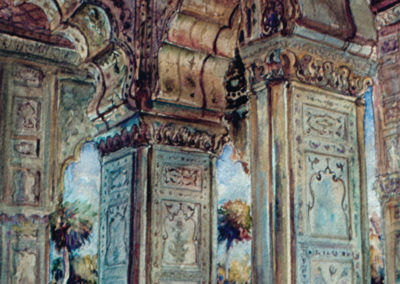 My extensive journey throughout India was without exaggeration an intense, life-changing experience. 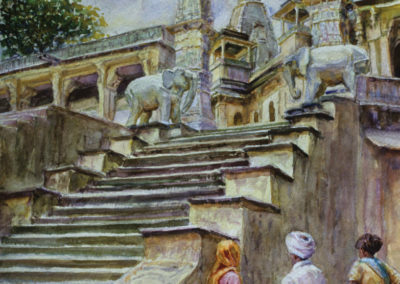 Similar to Africa, but even more so, India is a study in contrasts, and one’s senses are assaulted at every turn. 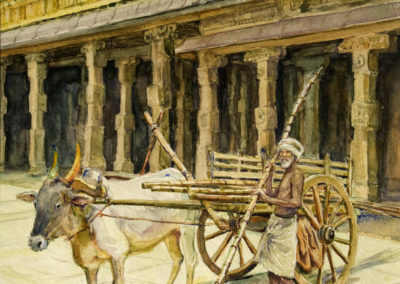 Although the extreme poverty can be overwhelming, I encountered a spiritual quality in the Indian people that I found refreshing and enlightening. 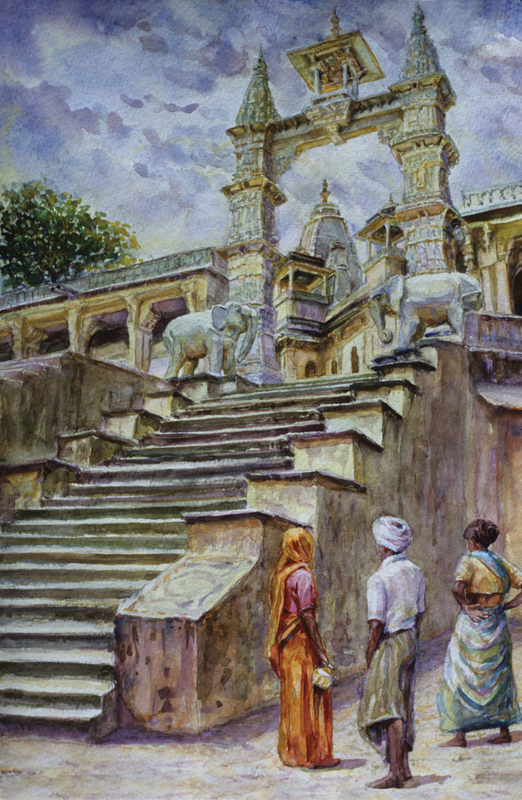 While exploring and sketching magnificent and diverse architectural monuments, I felt that I was witnessing the last vestiges of a truly historically significant civilization, which stood in stark contrast to the shanty towns and poverty that have grown up about the bases of these now crumbling edifices. 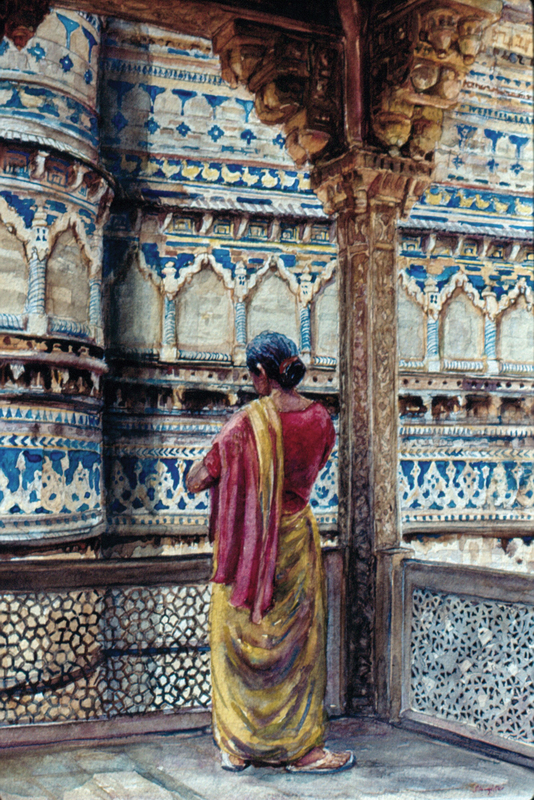 Although traveling in India or Africa is both physically and mentally demanding, India is the most visually stimulating place I have ever visited. 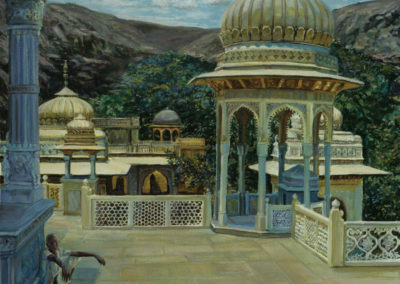 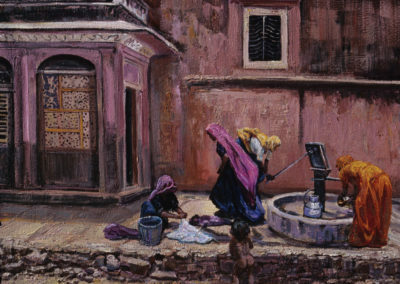 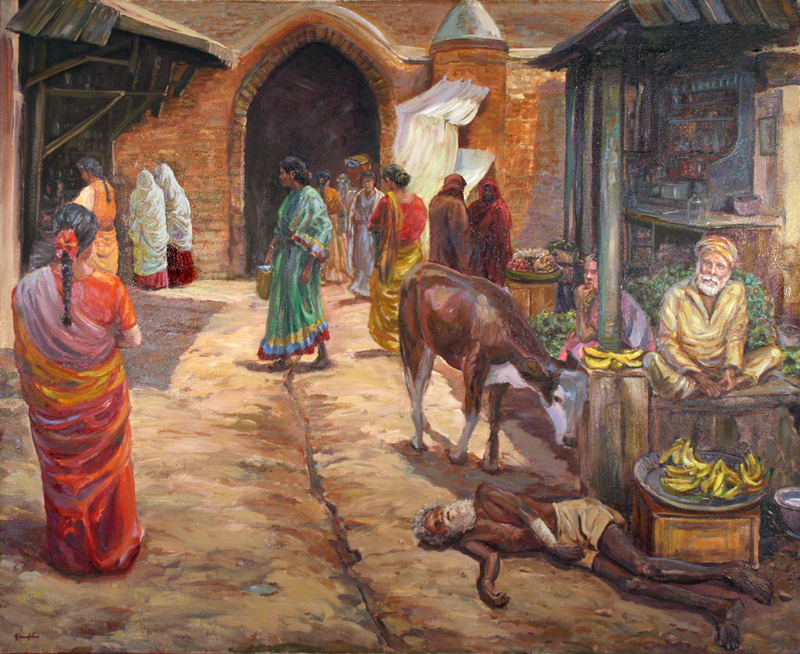 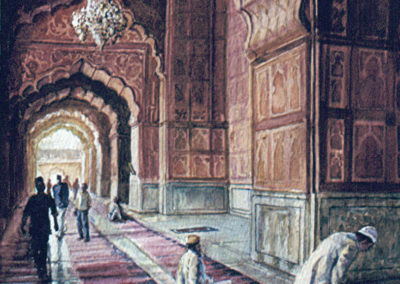 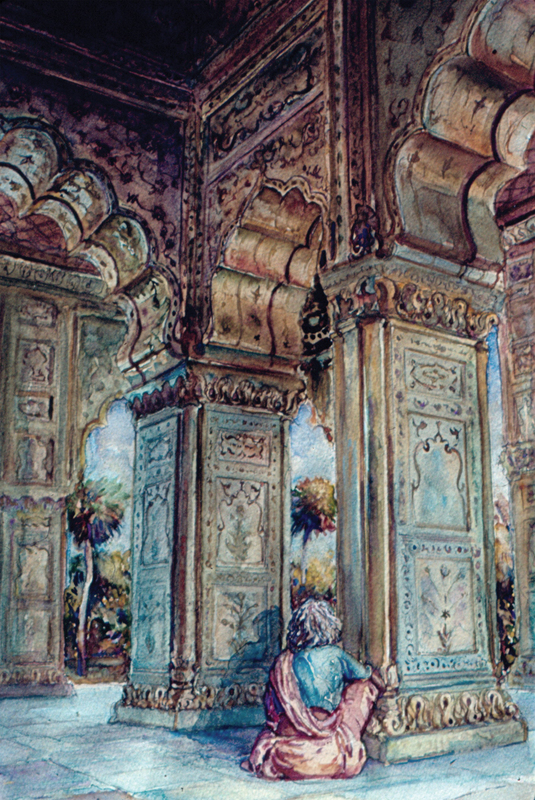 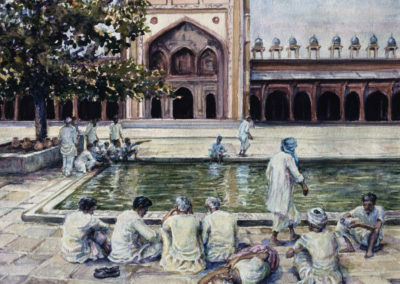 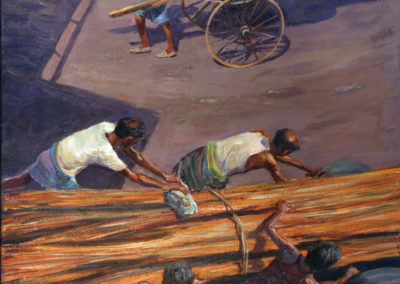 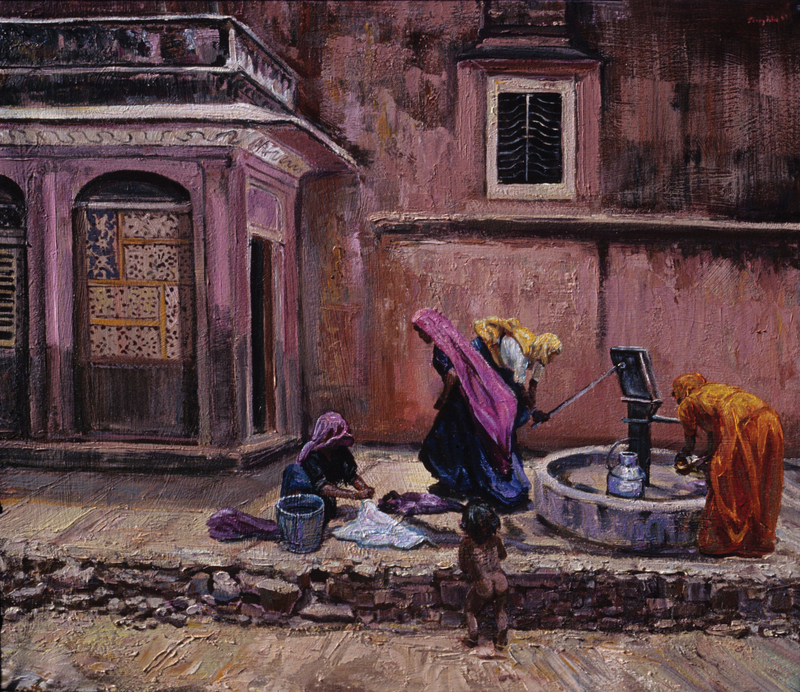 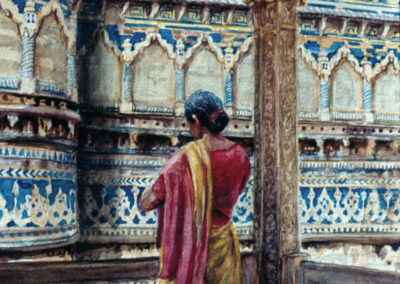 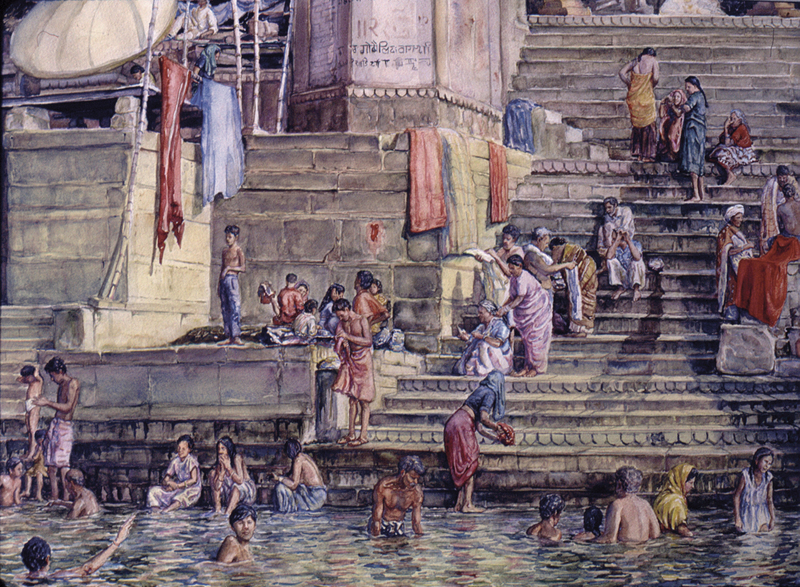 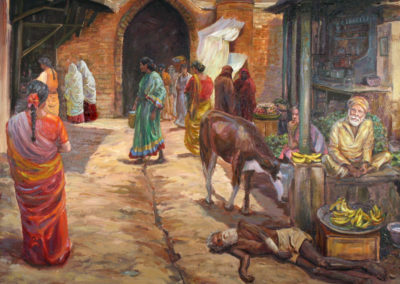 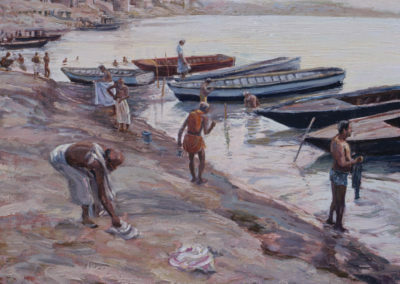 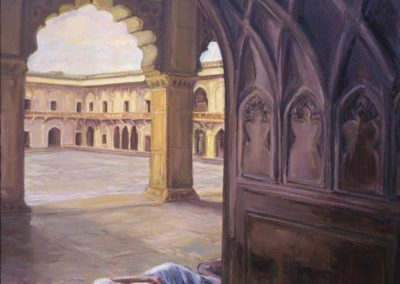 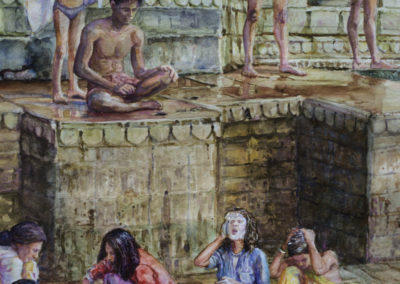 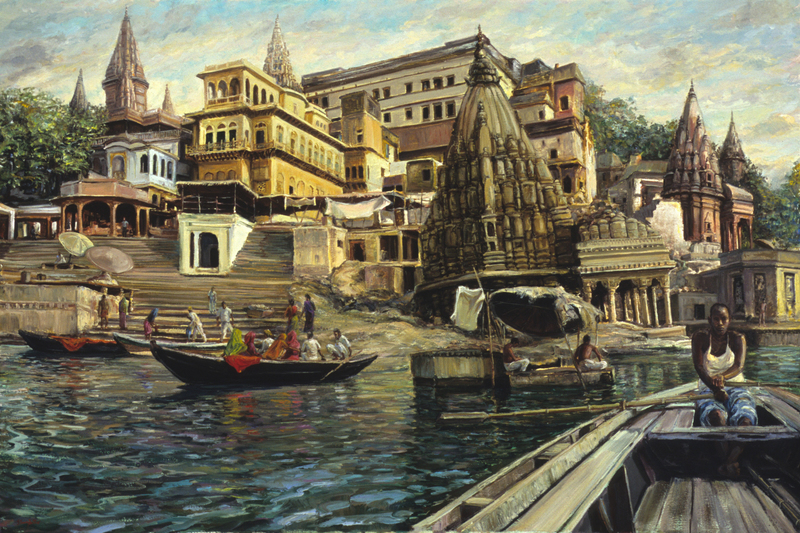 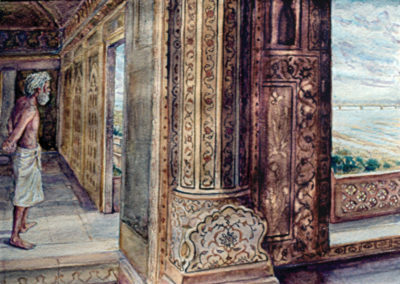 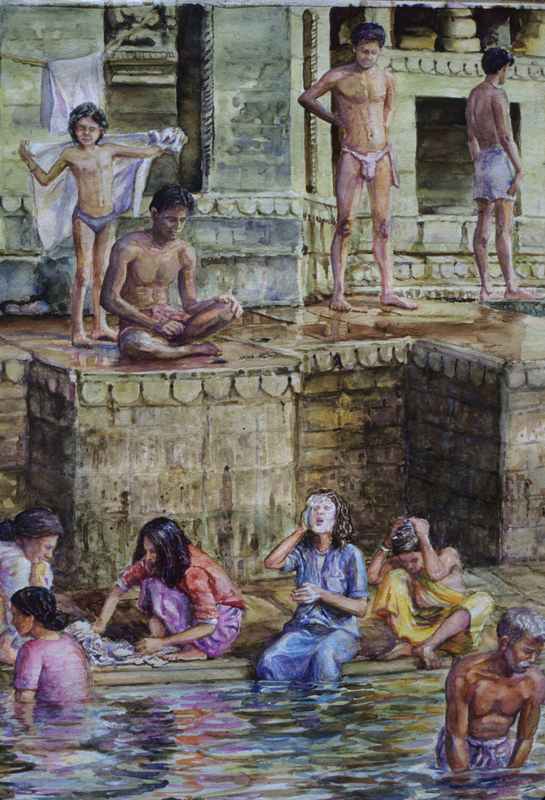 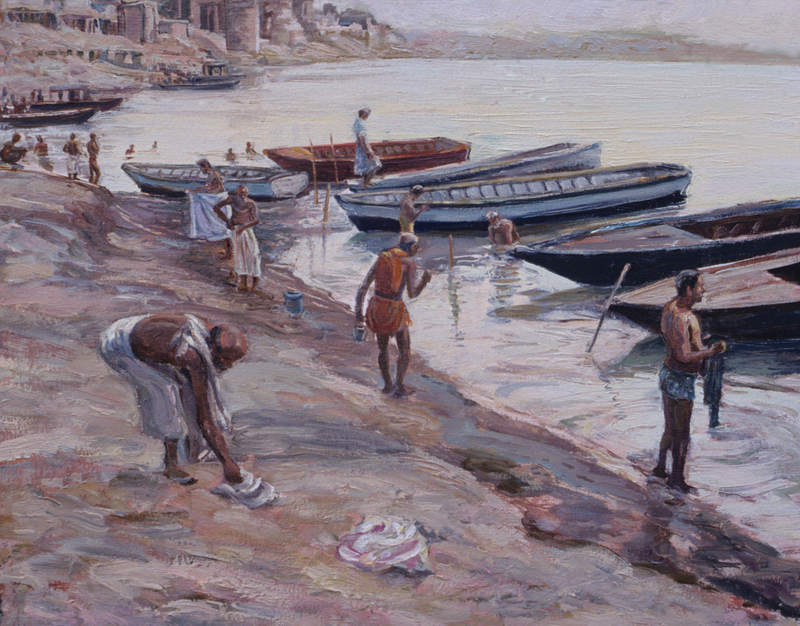 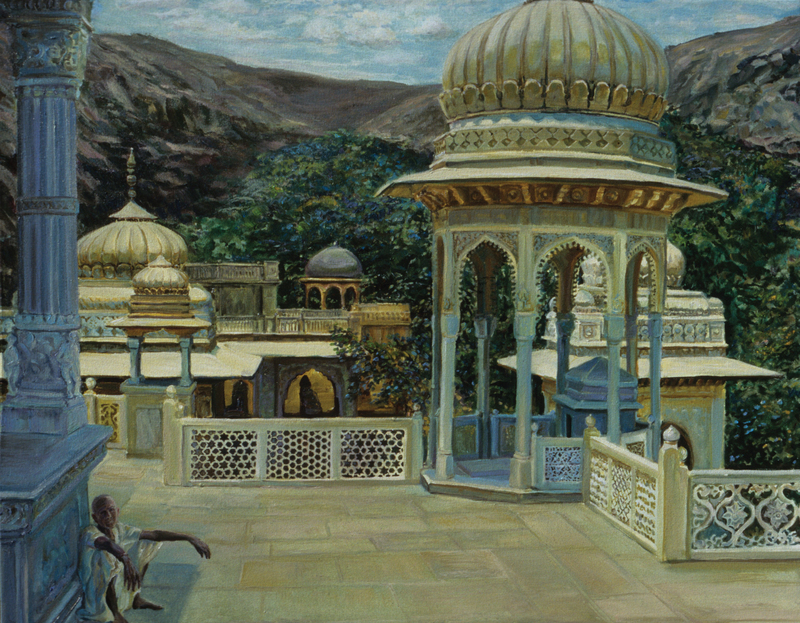 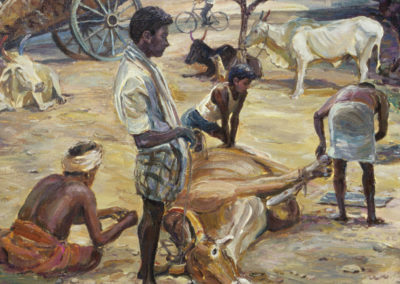 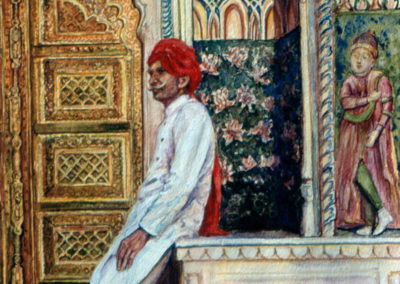 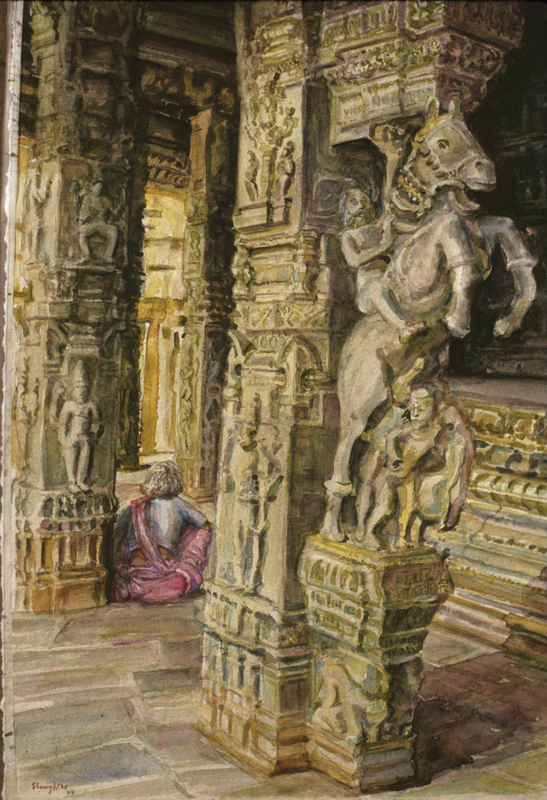 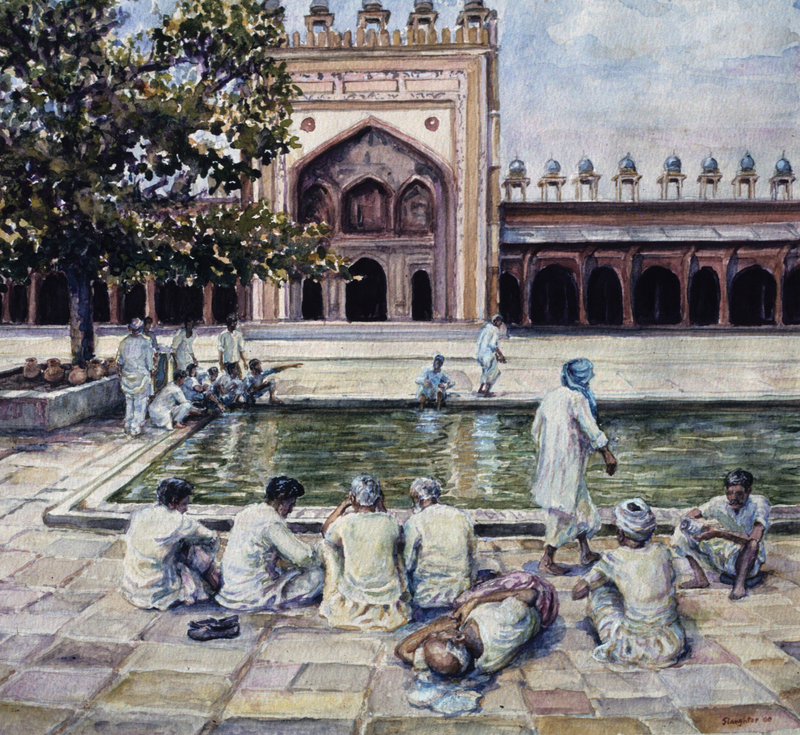 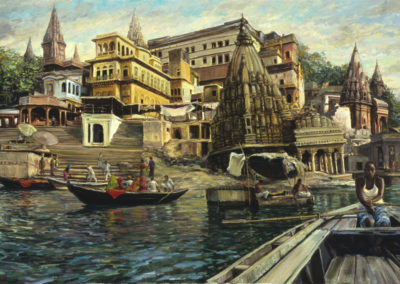 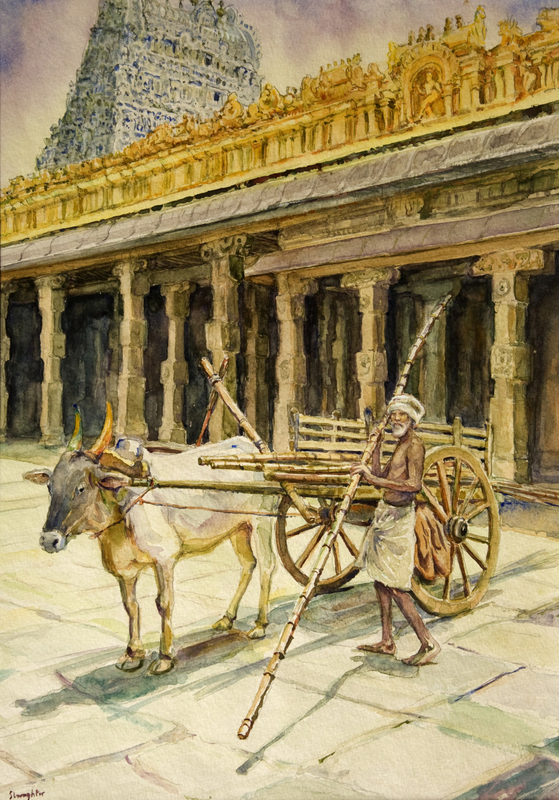 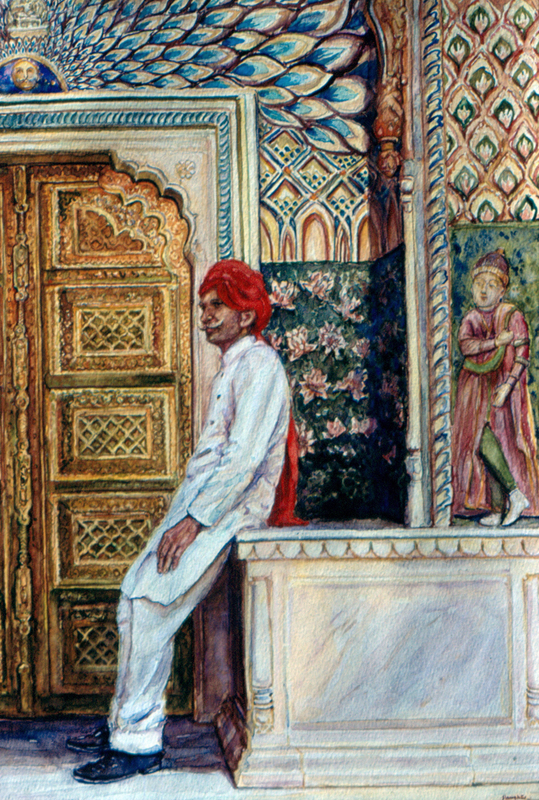 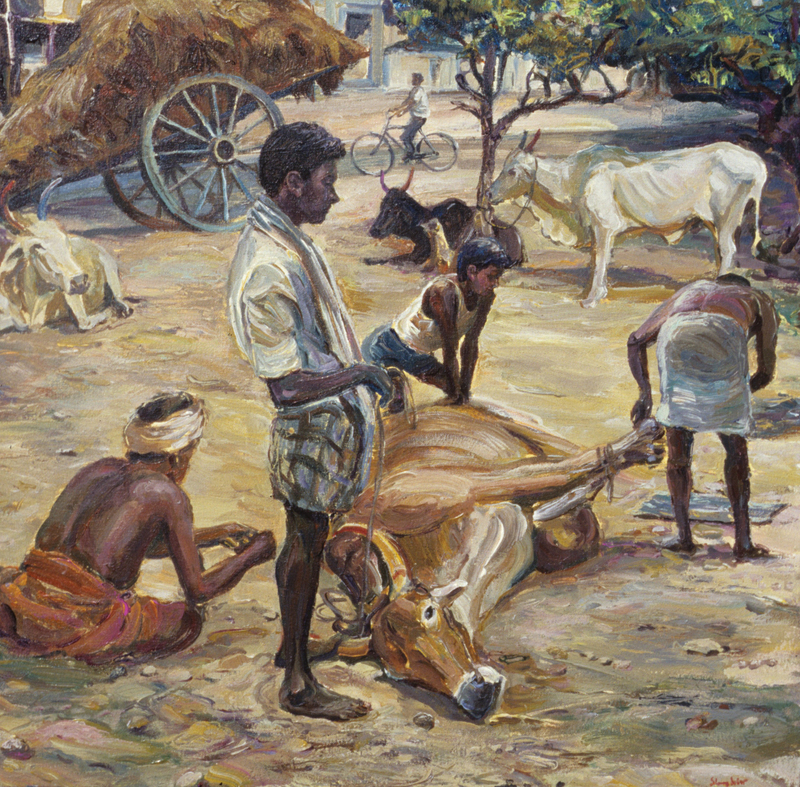 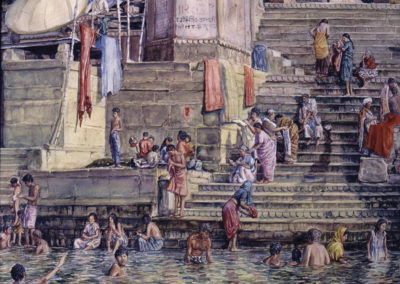 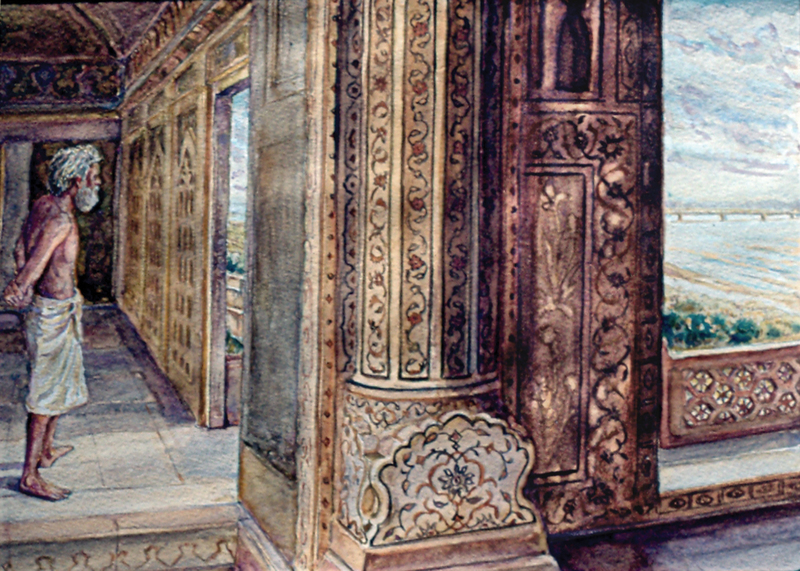 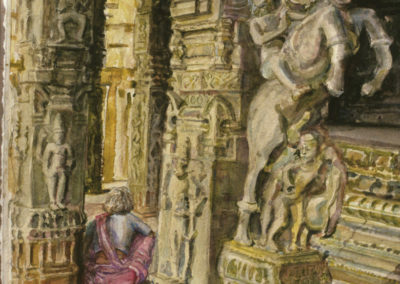 It is a “painter’s paradise.” To explore India is to discover one’s relationship with not only the natural, physically challenging environment, but also an amazingly diverse and vastly different culture that is so exotic compared to middle-class America. 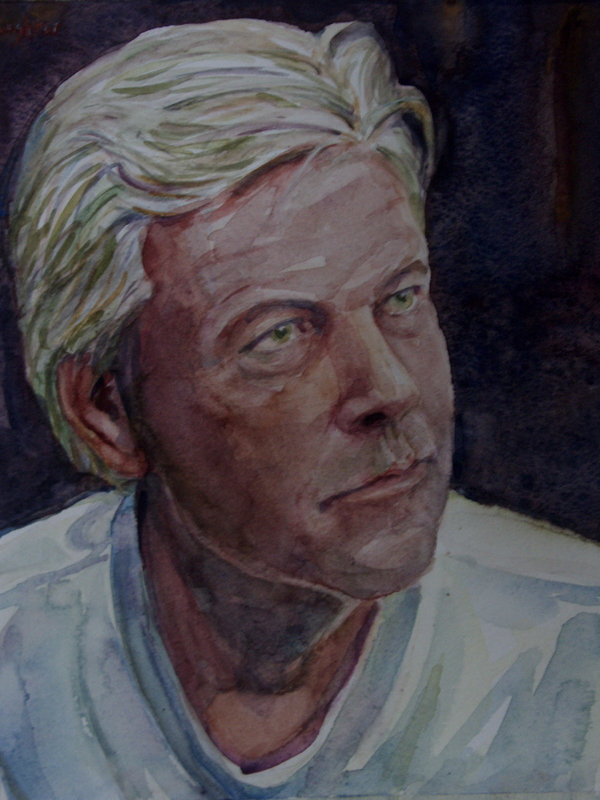 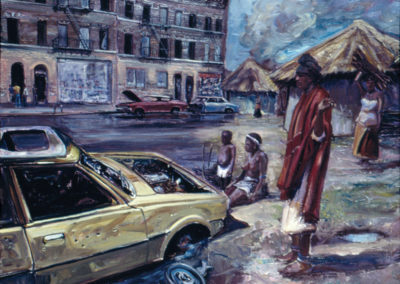 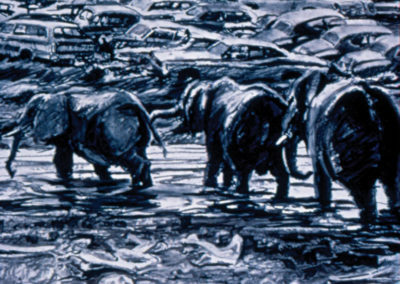 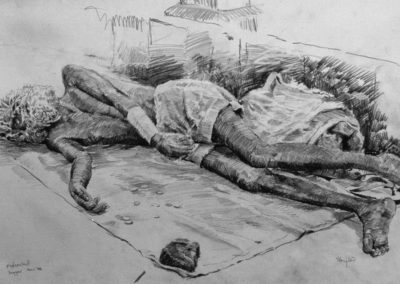 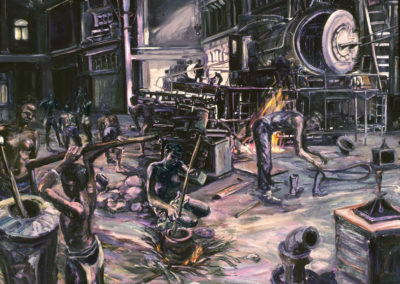 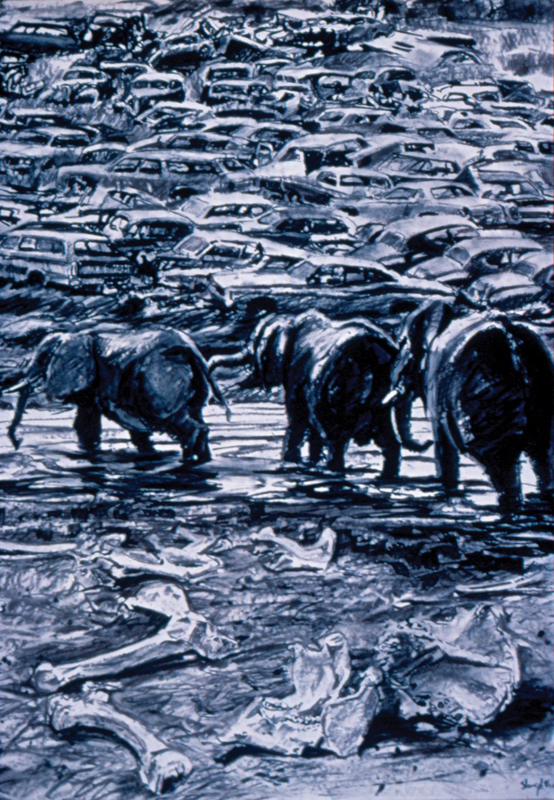 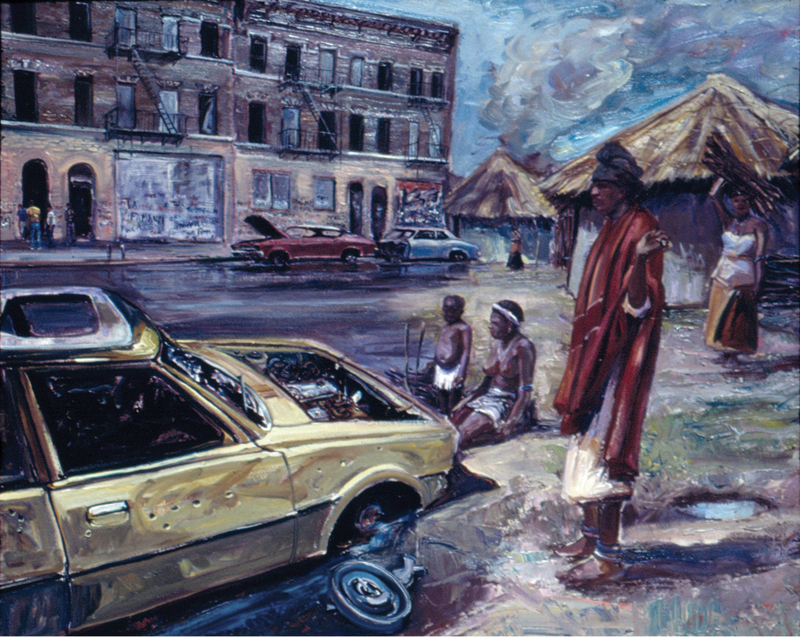 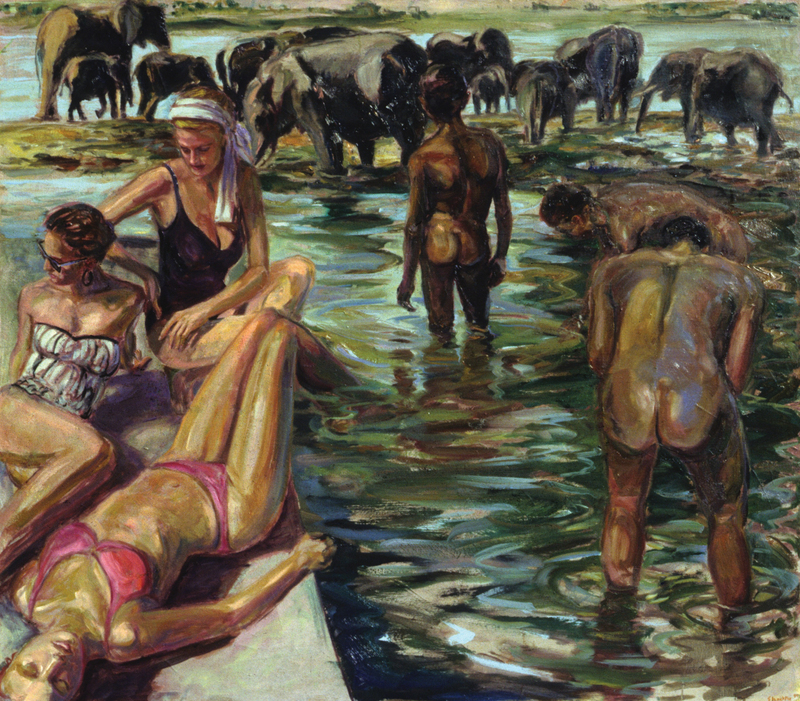 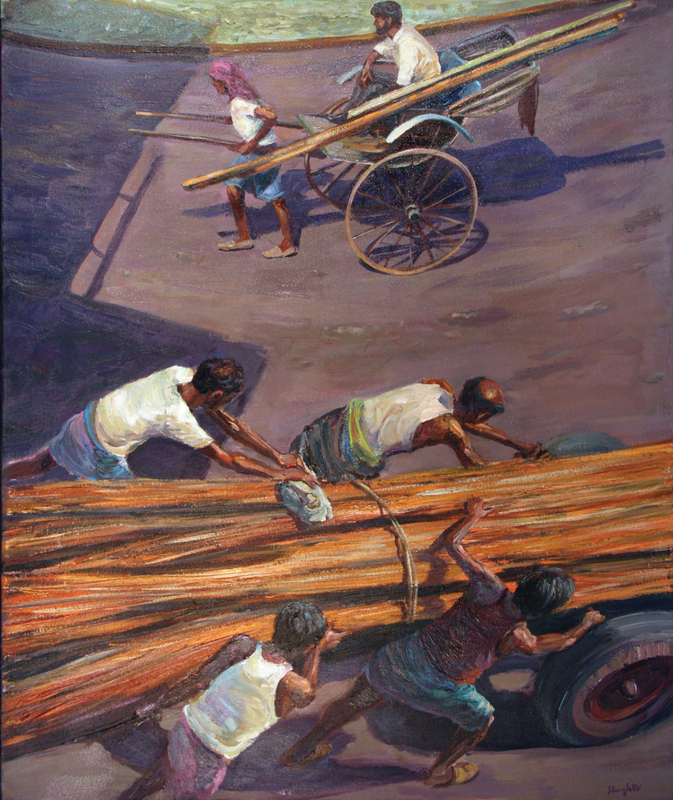 Following a trip to southern Africa in 1985, Loyola Marymount University awarded me a research grant to travel back to Africa in 1988 to gather source material, which would eventually comprise the Africa America Amalgamation series of drawings and paintings, united by a social commentary theme. 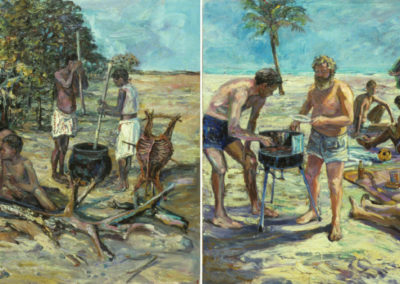 In this series, I attempt to upset the stereotypical notion that whatever is equated with the term “civilized” is thought to be better or more progressive than that labeled “uncivilized.” The earliest paintings were diptychs where a rural African scene is juxtaposed with an urban American counterpart. 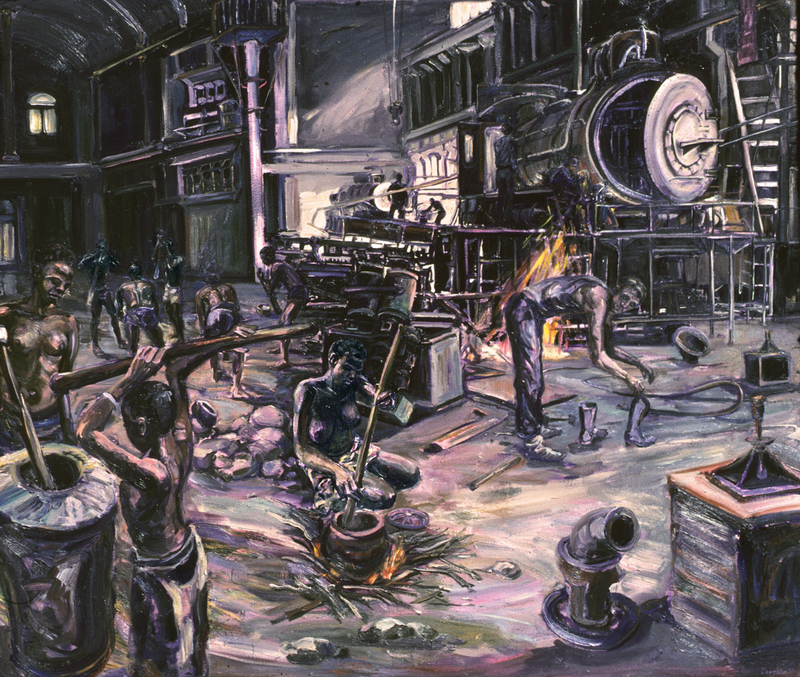 The social commentary arises as one compares and contrasts the disparate scenes. 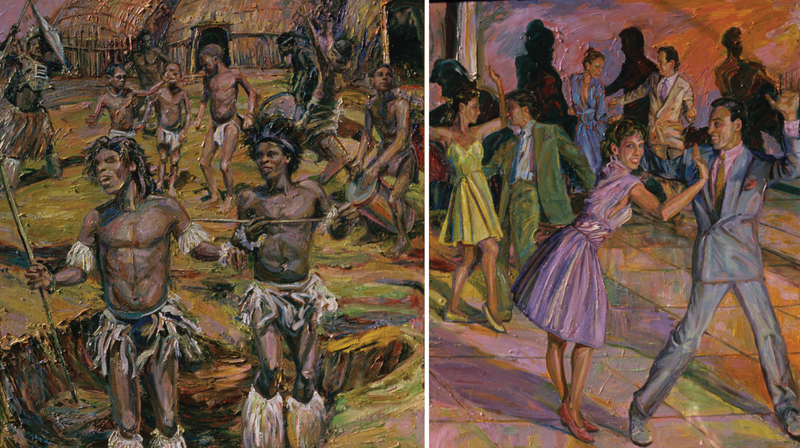 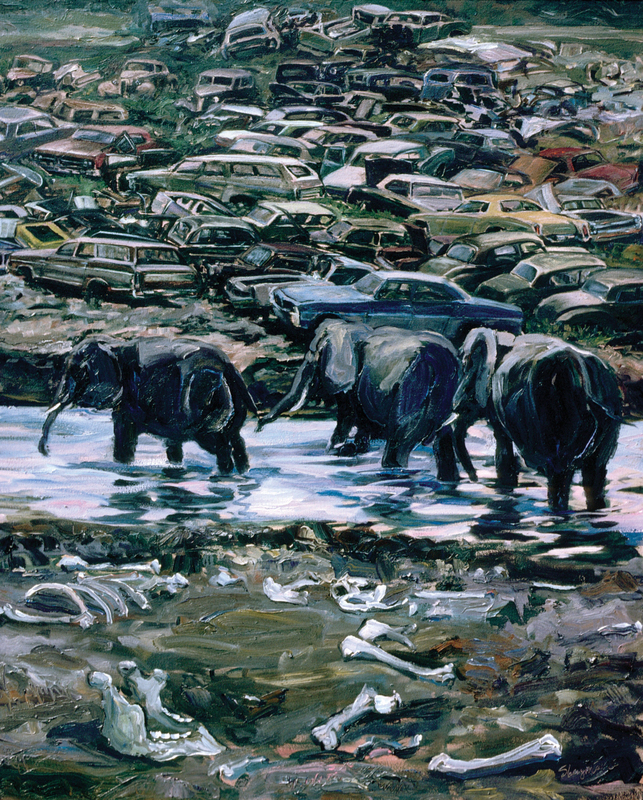 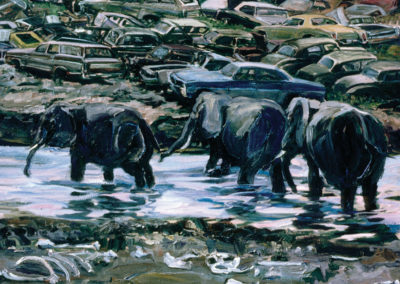 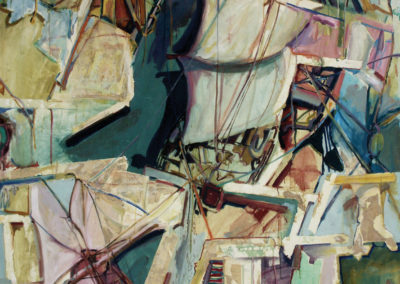 The later paintings are more surrealistic as the images of Africa and America merge together on one campus, thereby amalgamating the images and social commentary. 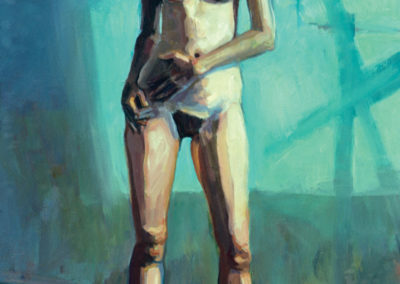 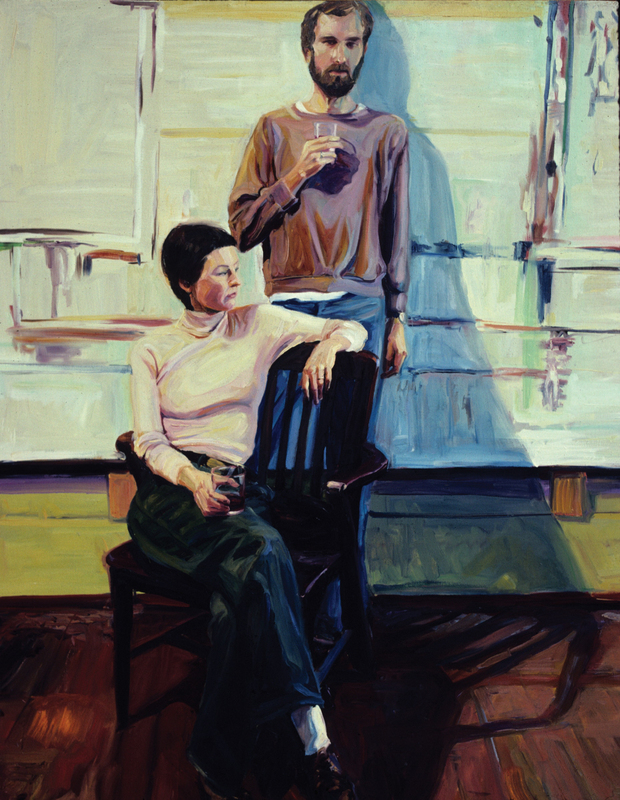 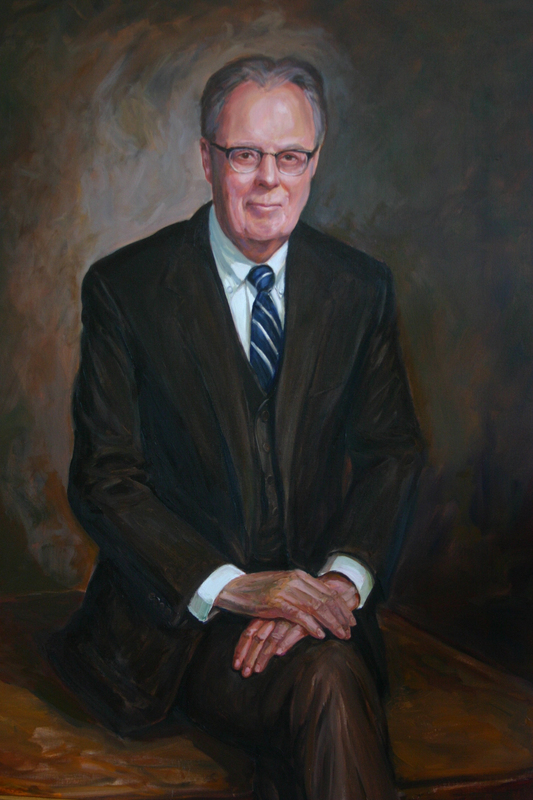 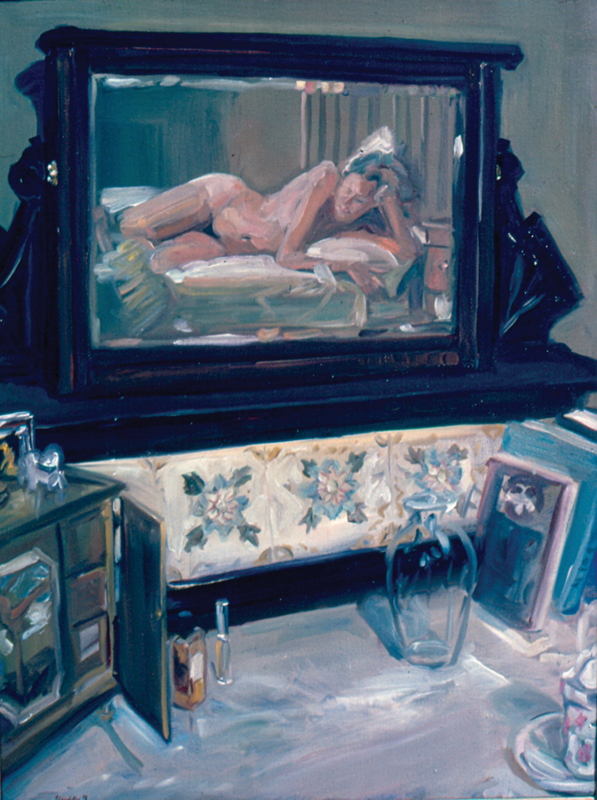 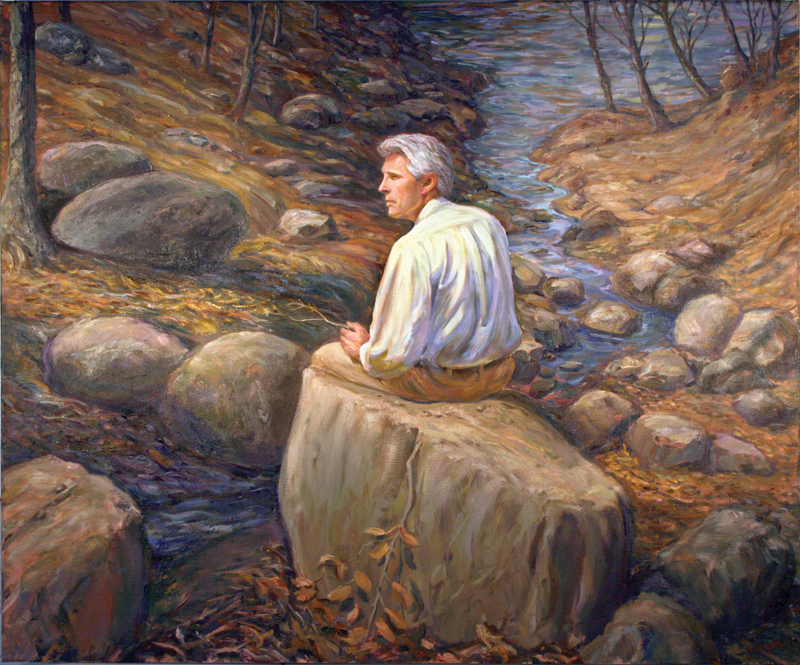 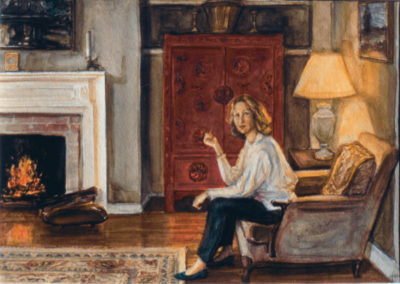 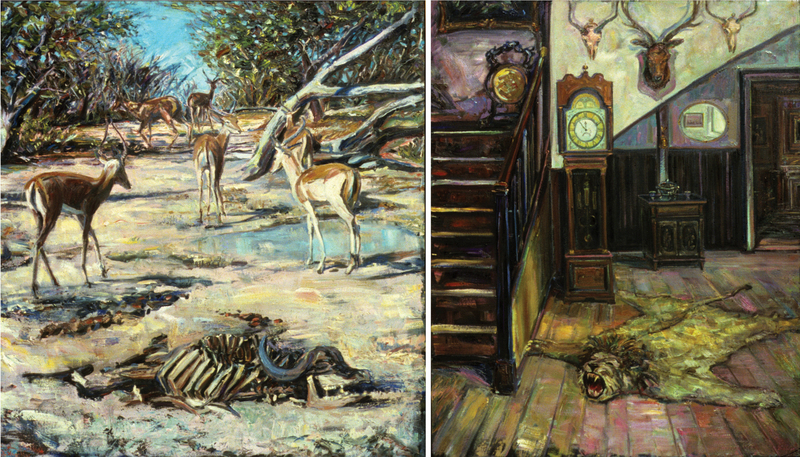 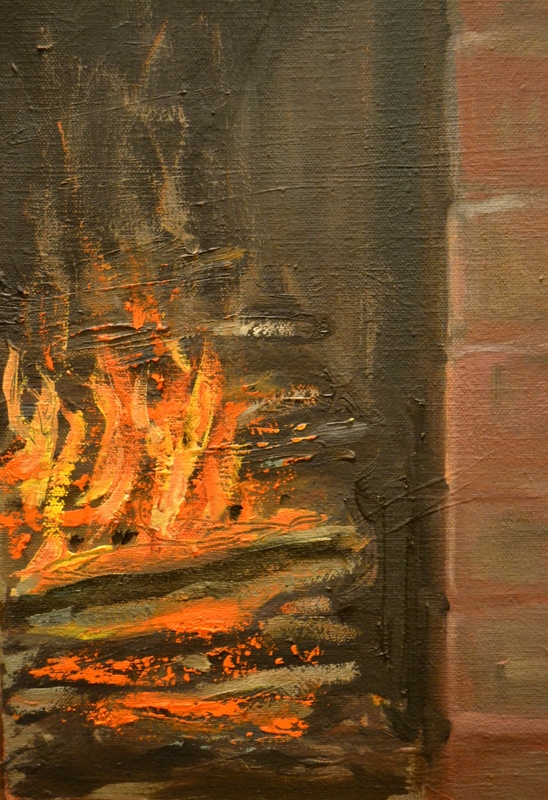 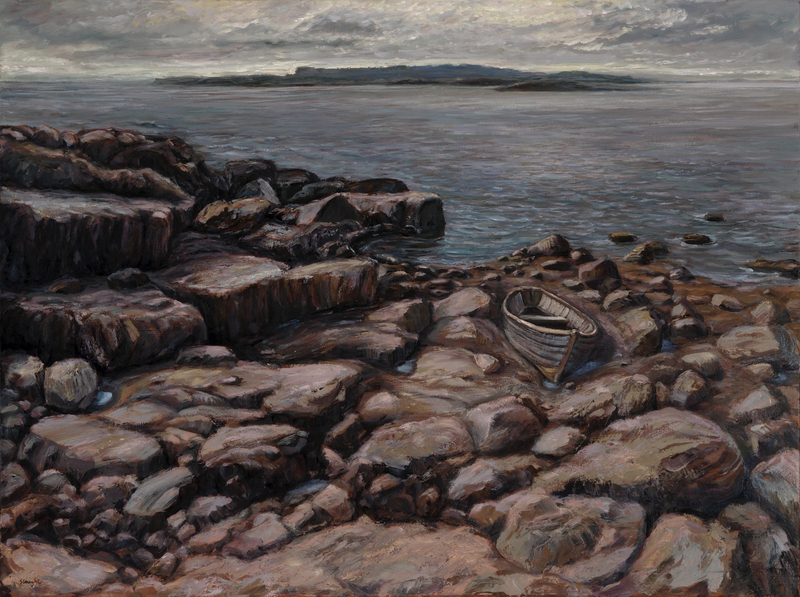 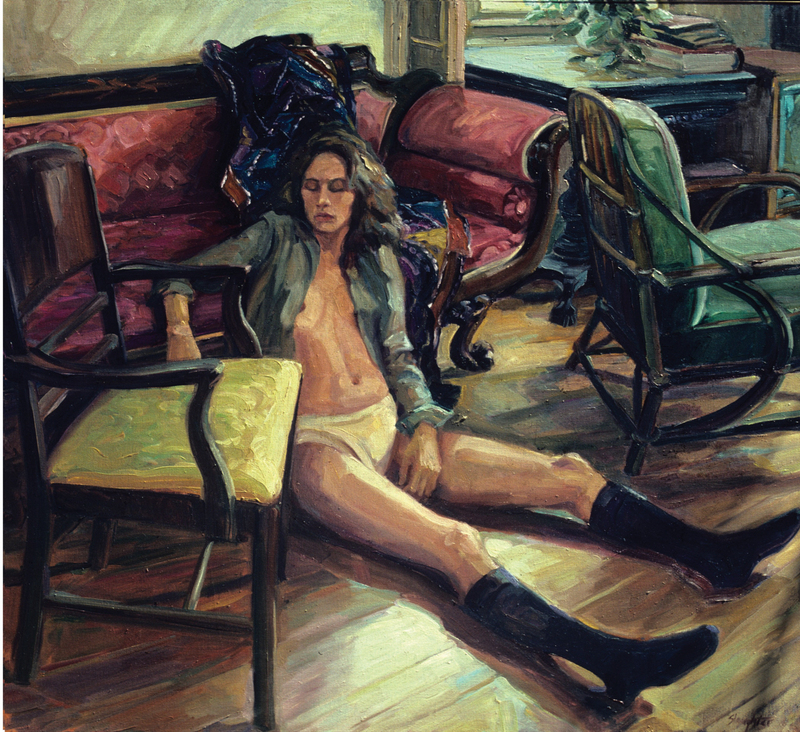 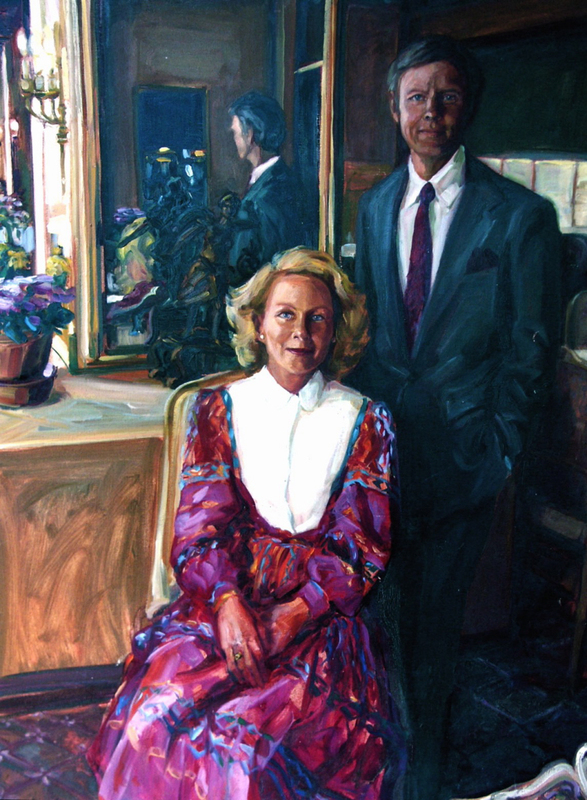 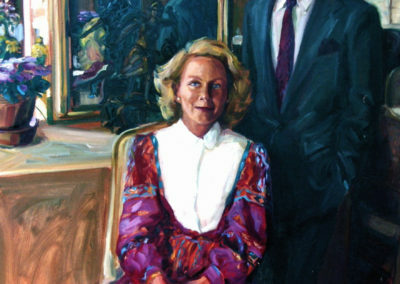 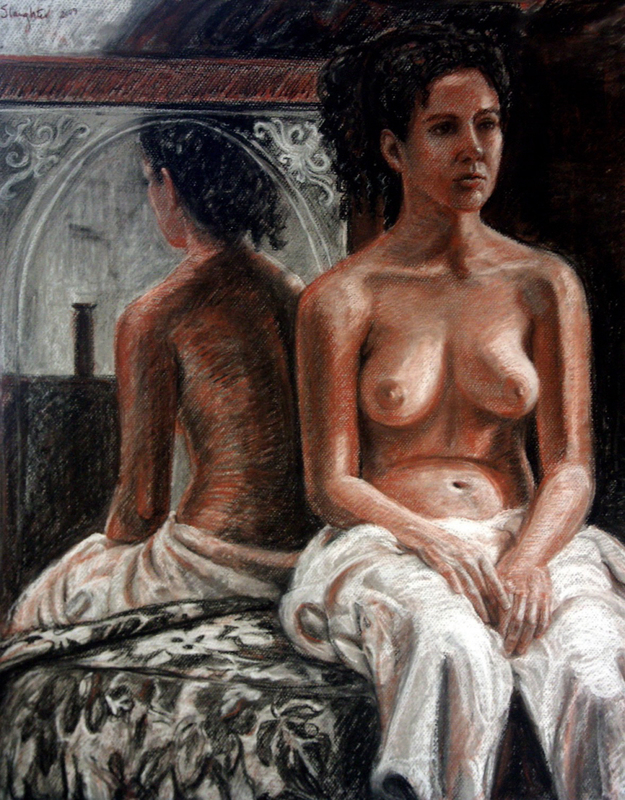 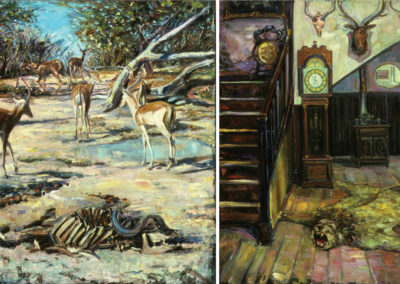 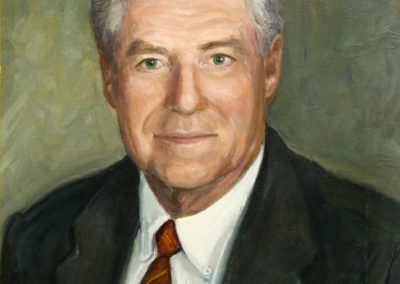 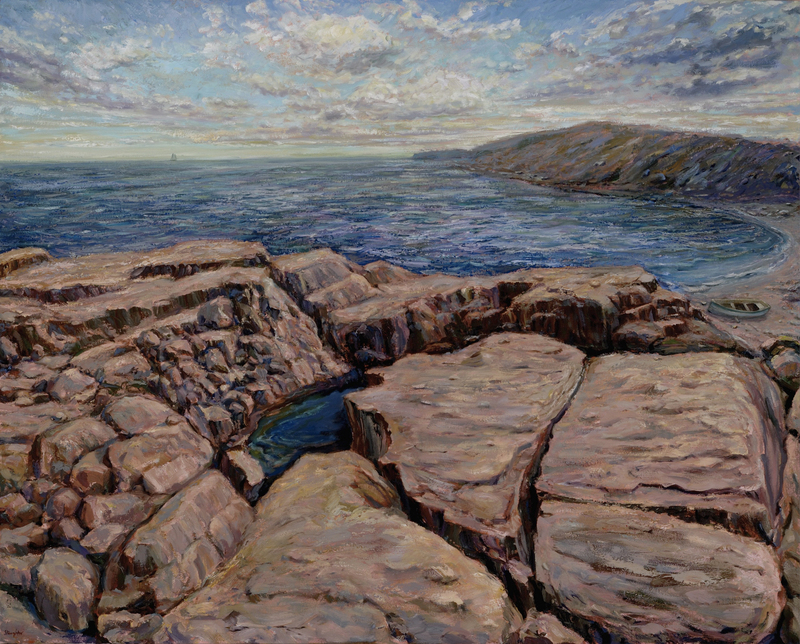 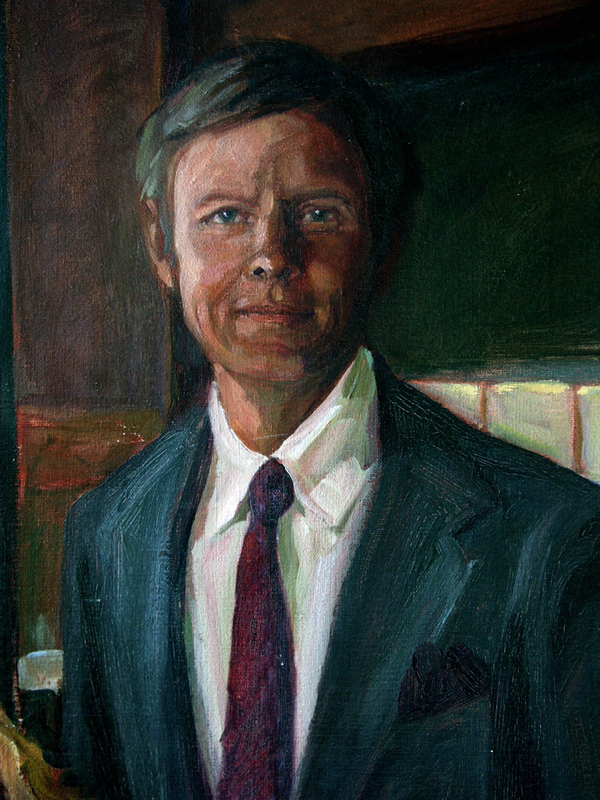 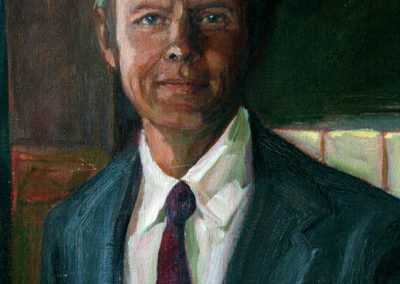 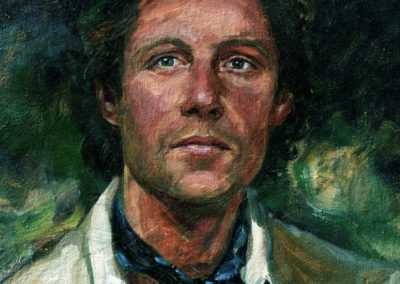 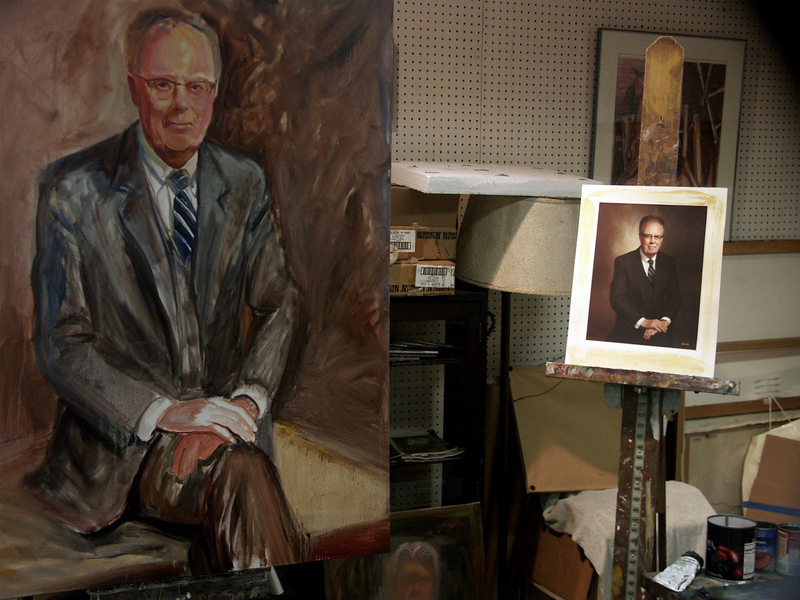 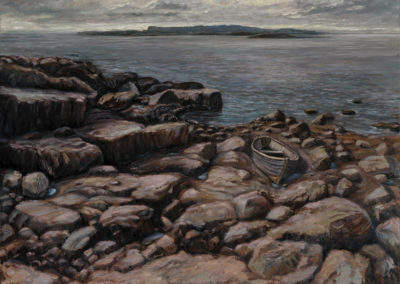 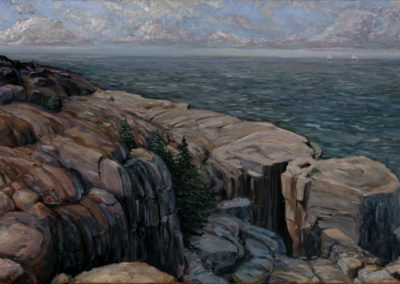 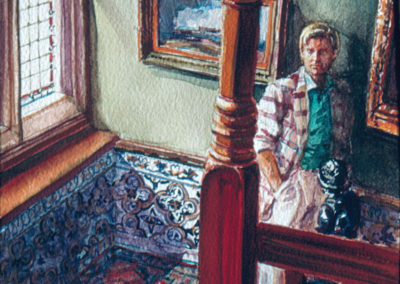 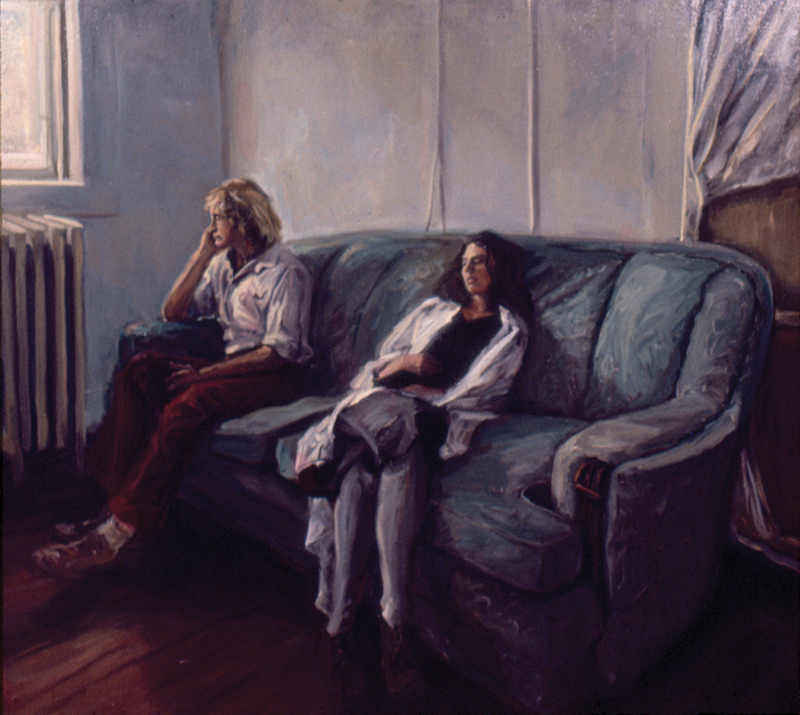 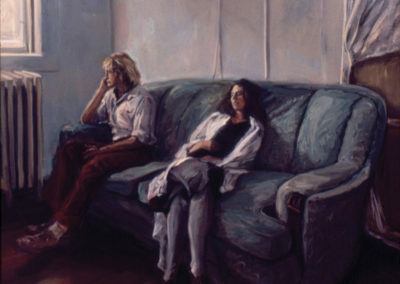 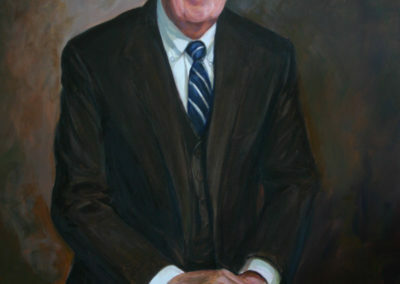 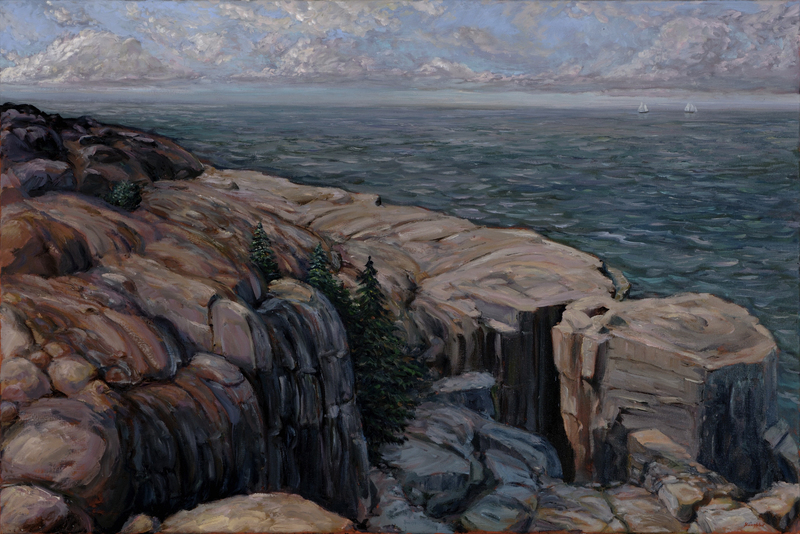 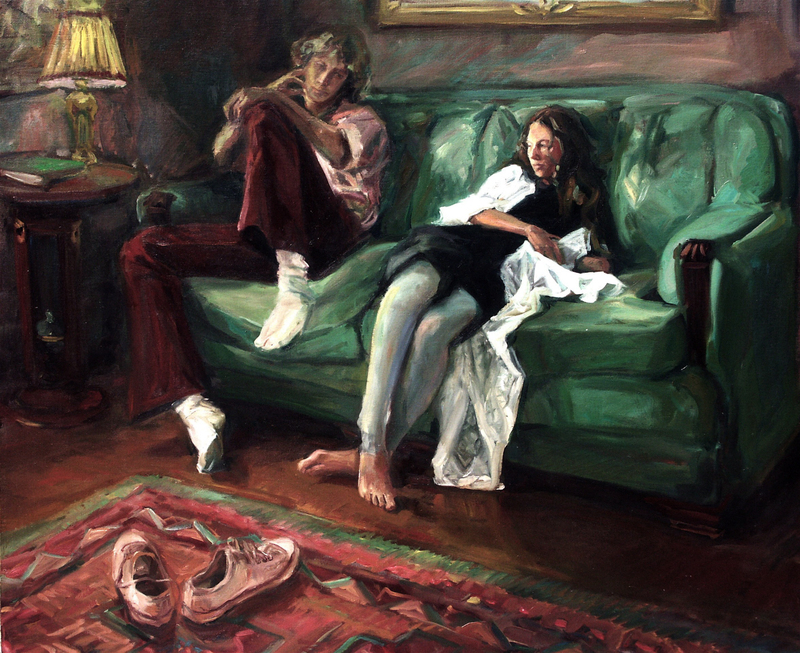 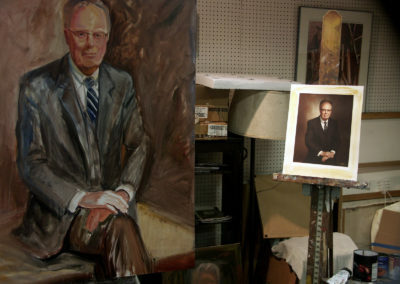 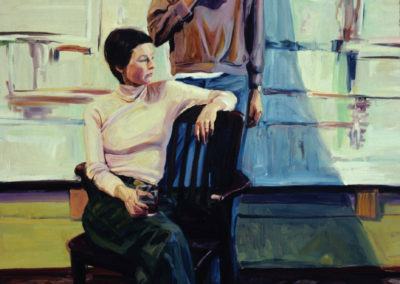 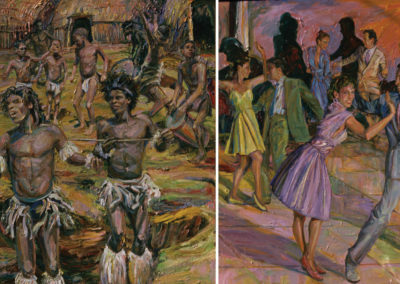 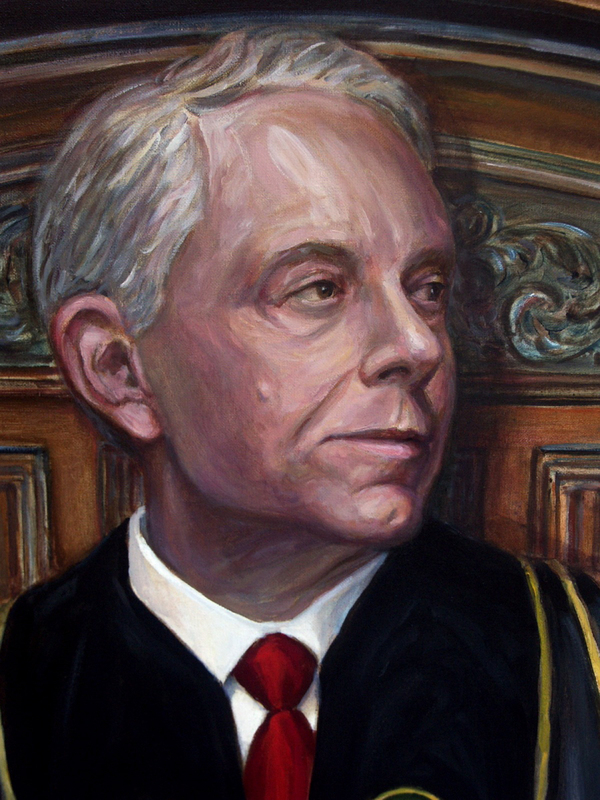 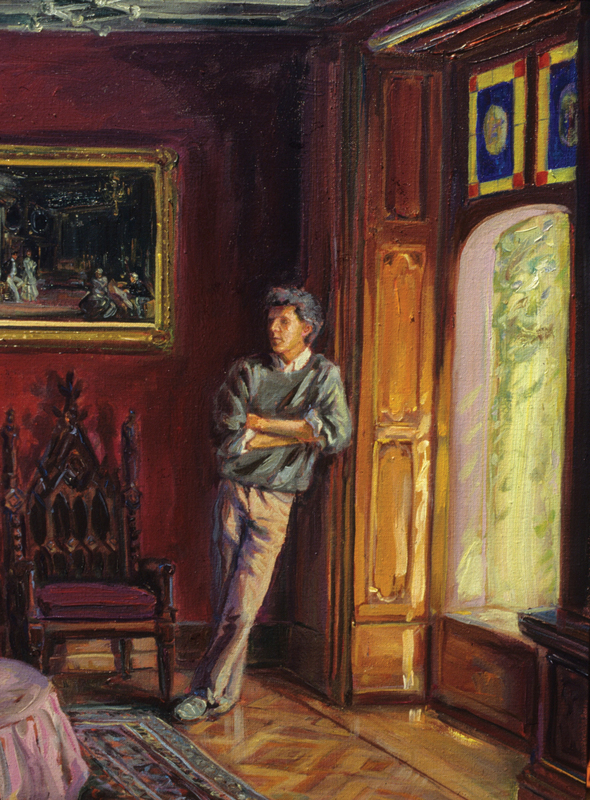 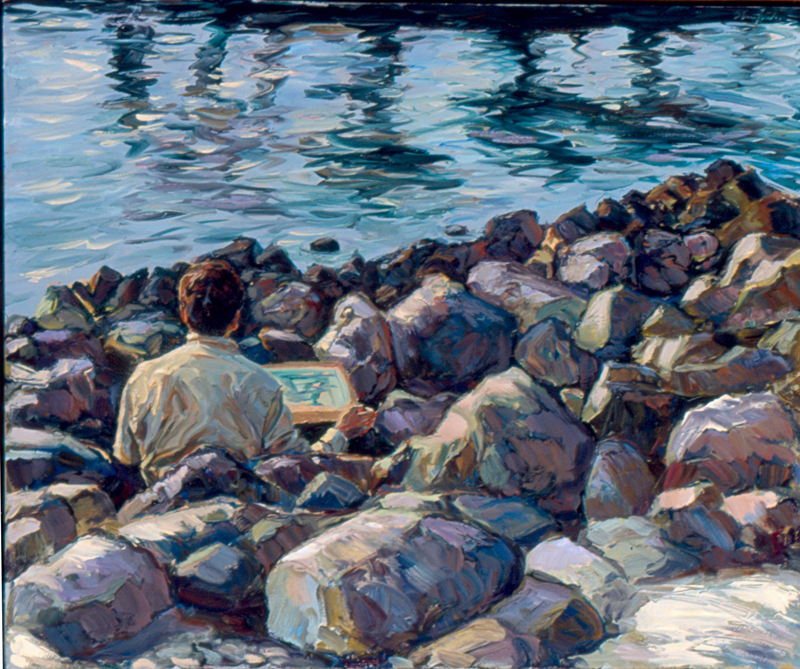 1987, 61″ x 110″, diptych, oil on canvas, collection of Mr. Andrew Duncan. 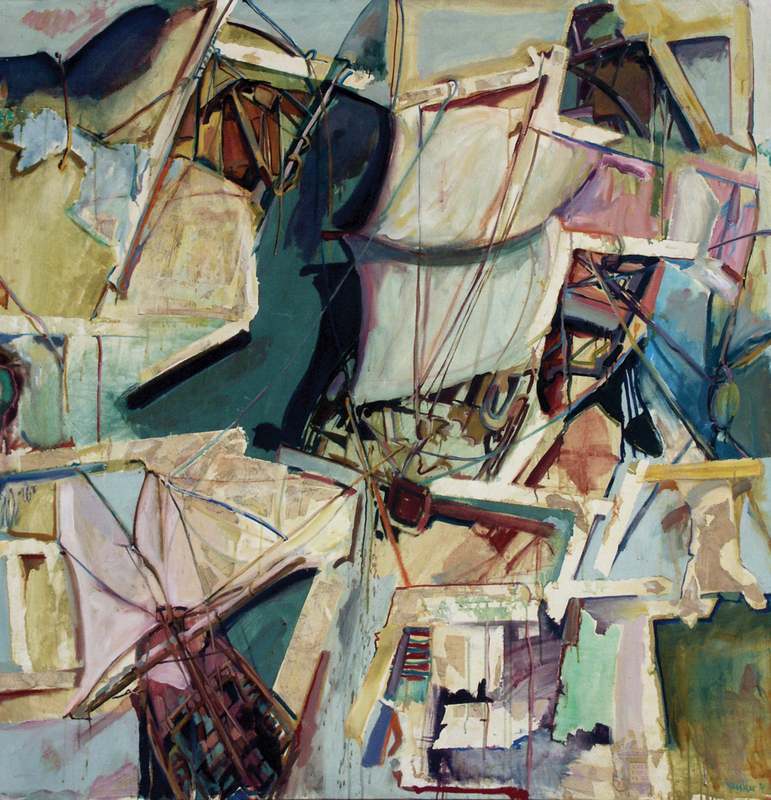 Approximately a year after the World Trade Center tragedy of September 11, 2001, I felt compelled to focus on a new body of work, at home rather than abroad, which was initially inspired by New York City. 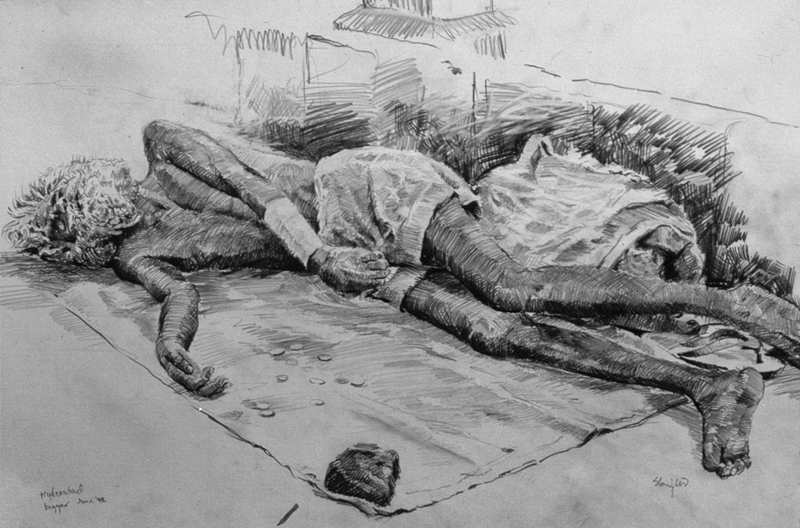 Instead of dwelling on the death and destruction of 9-11, I concentrated on celebrating an organic life force. 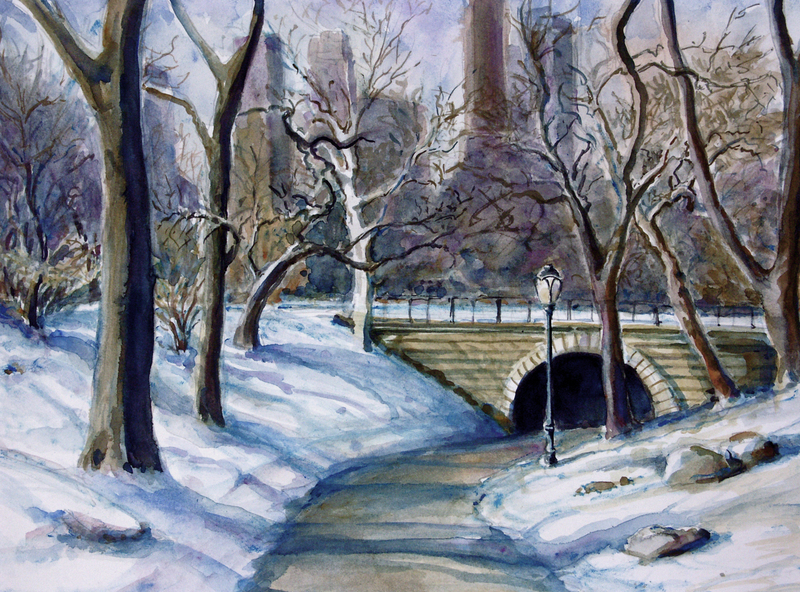 While walking past monuments and under bridges in Central Park, I again contemplated “passages” both figuratively and literally. 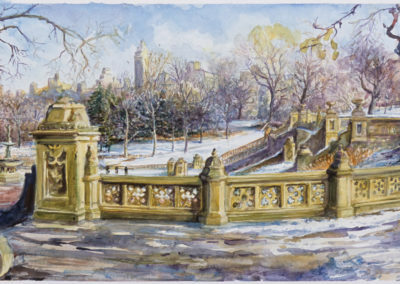 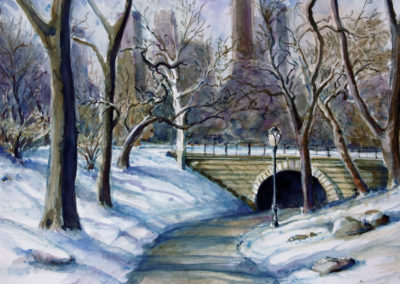 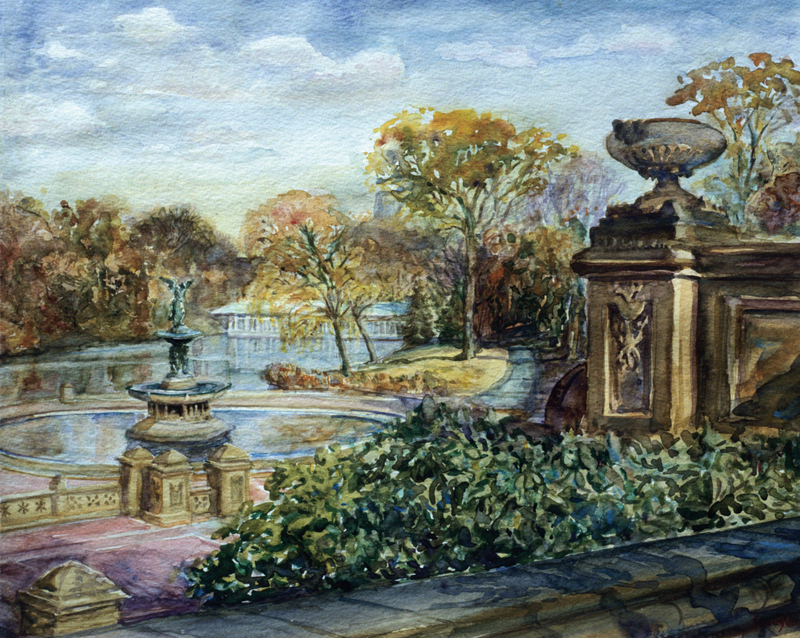 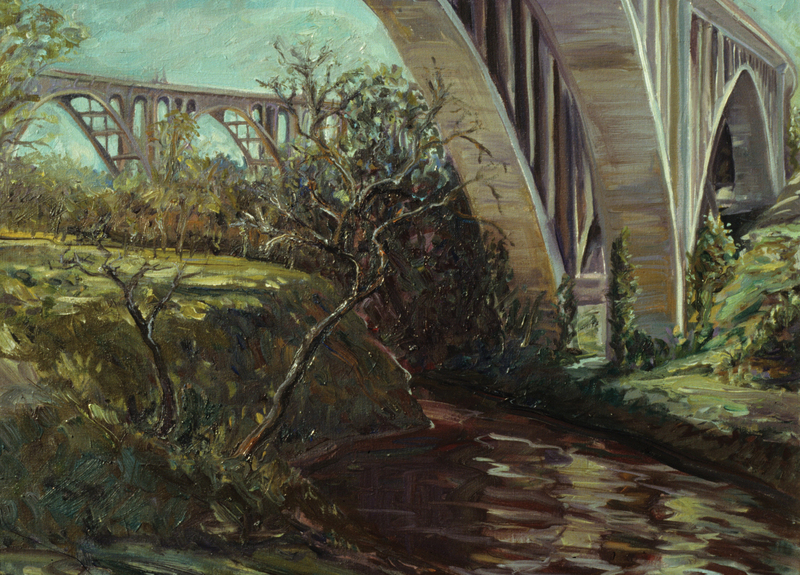 As much as I had admired Central Park, I had never painted there as artists had done for over a century. 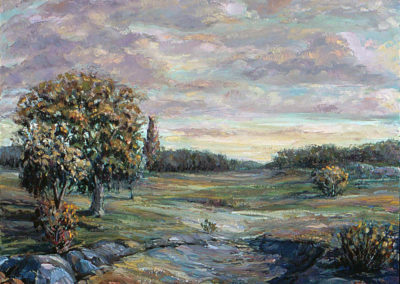 What appears to be a beautiful “patch” of nature, in some ways, is not natural at all. 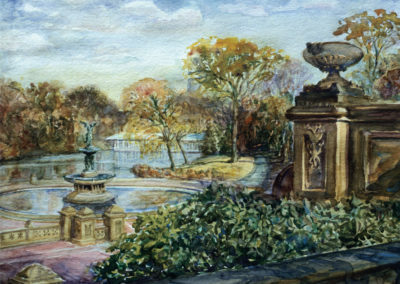 The park that Olmsted designed is a highly organized concoction of rocks, trees and flowering fields orchestrated around a labyrinth of pedestrian paths for the public to escape the concrete jungle of Manhattan. 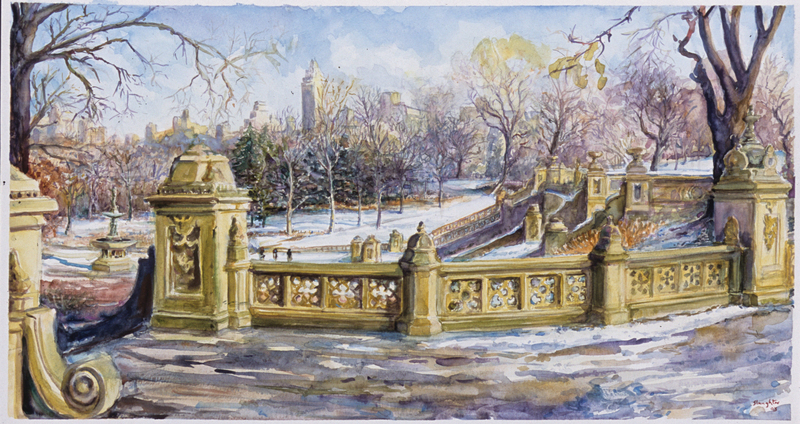 The juxtaposition between cityscape and parkland intrigued me. 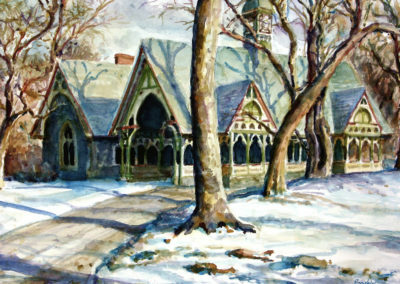 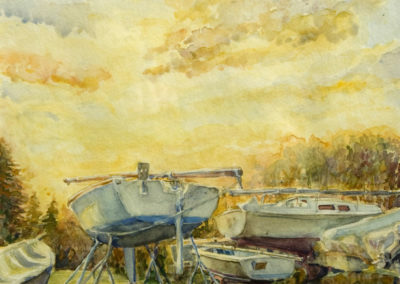 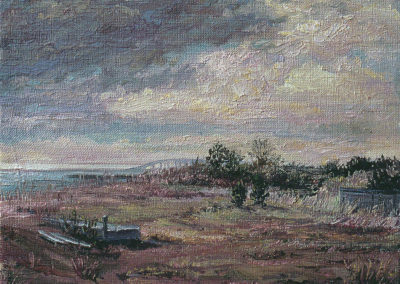 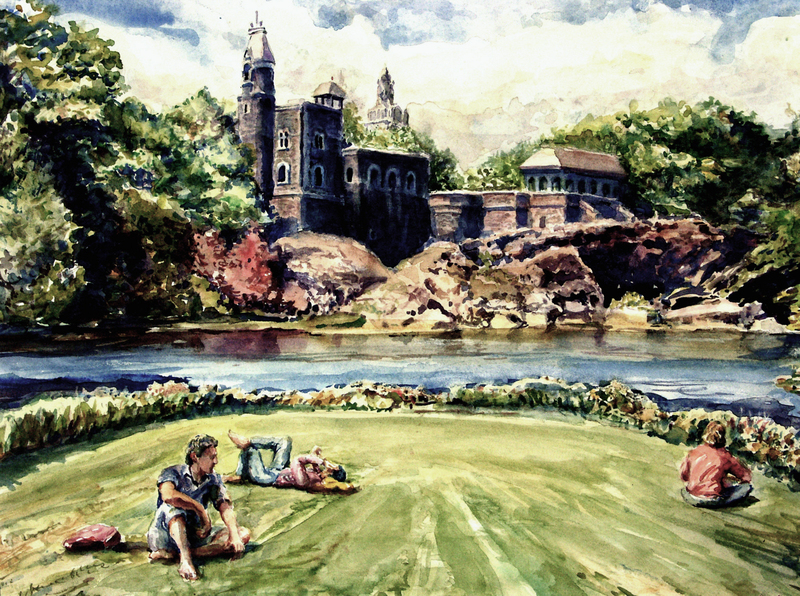 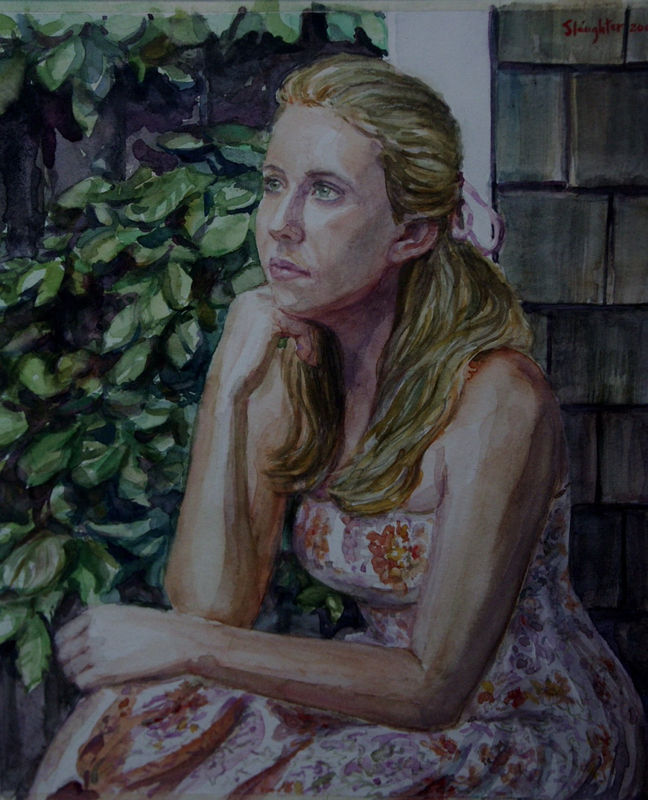 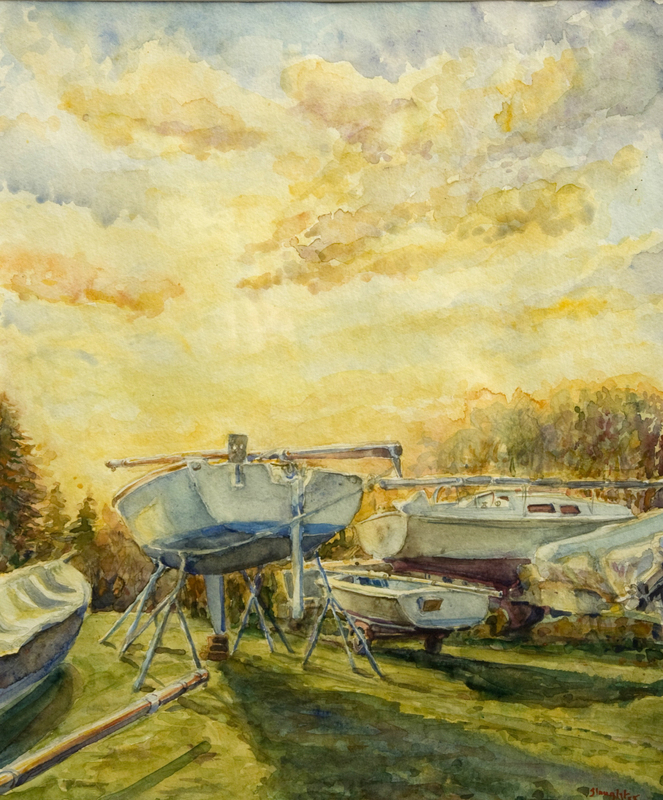 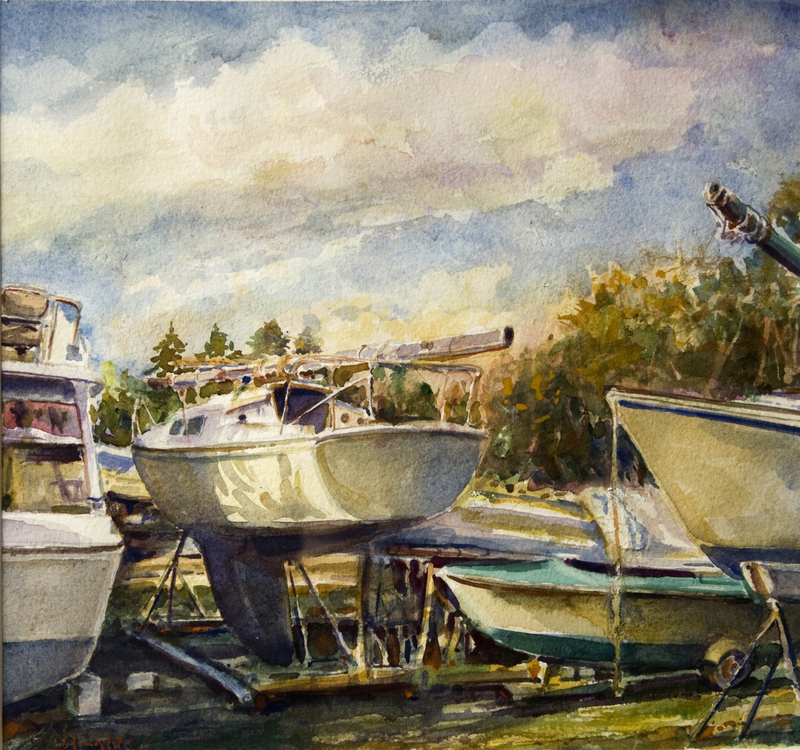 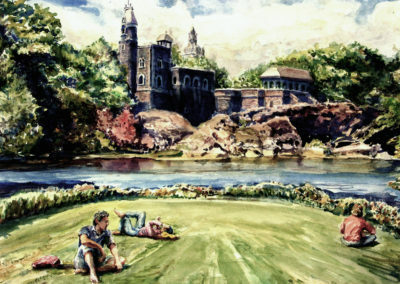 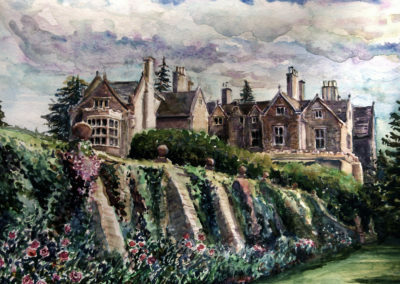 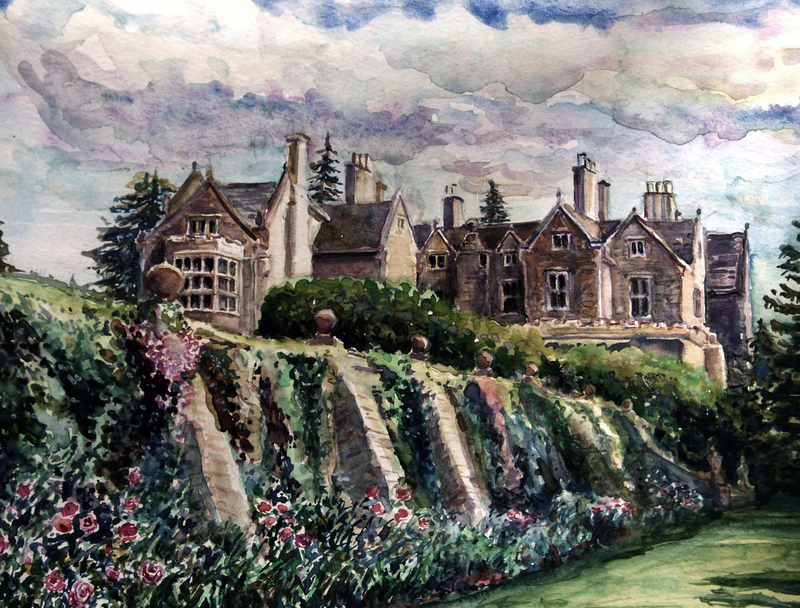 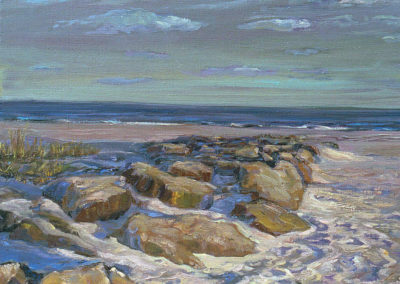 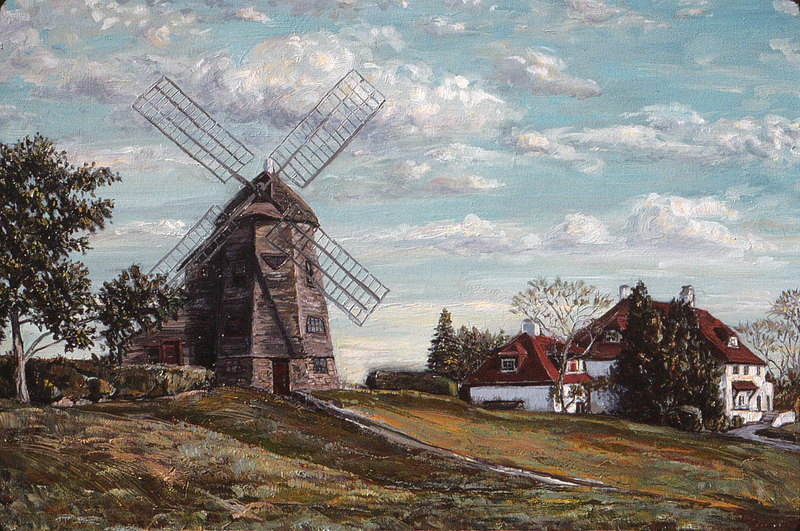 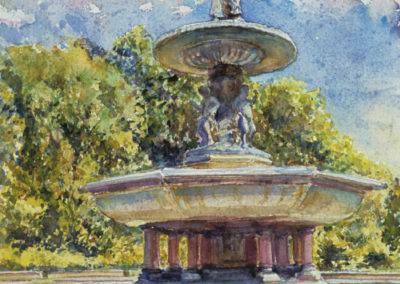 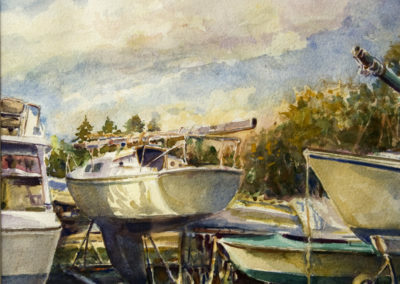 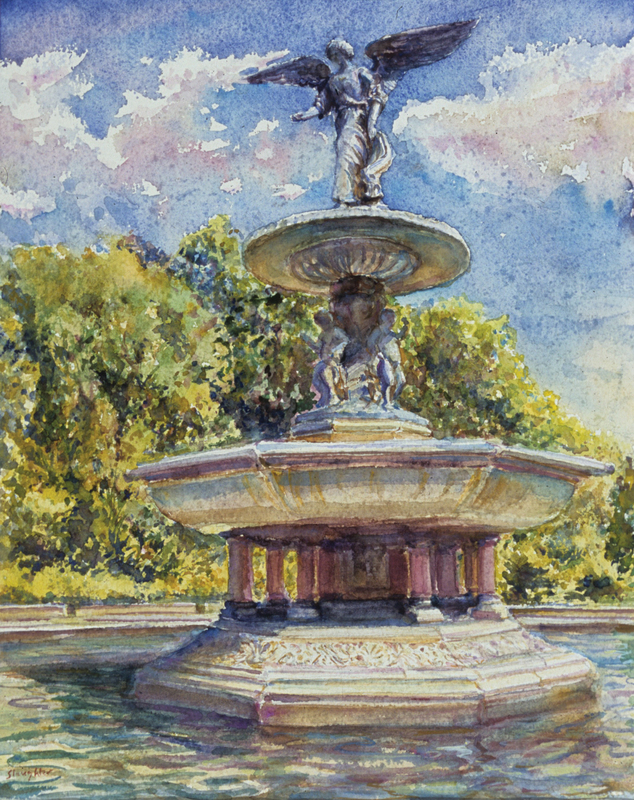 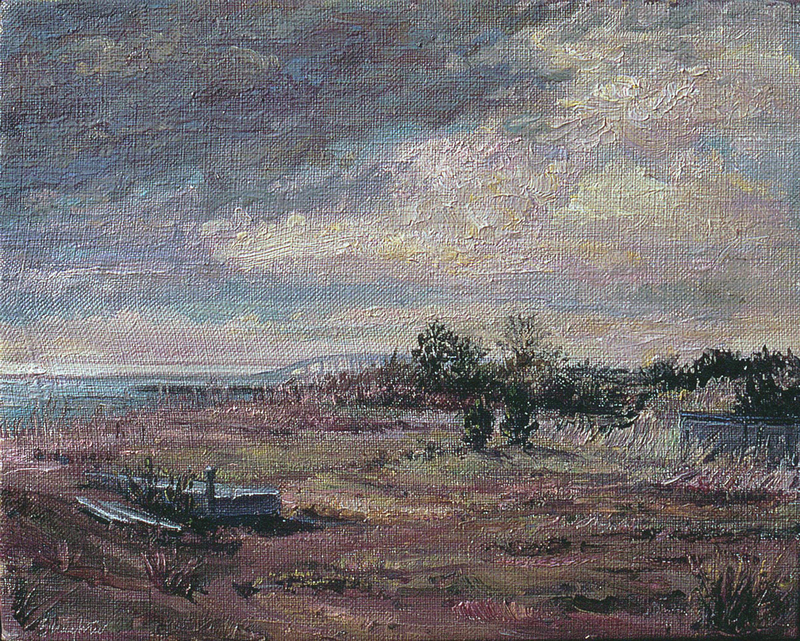 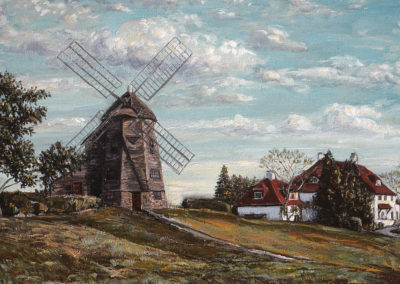 After painting a number of “plein-air” watercolors in Central Park, eventually I branched out, painting in watercolor and oil the East End of Long Island as well as Connecticut and New England. 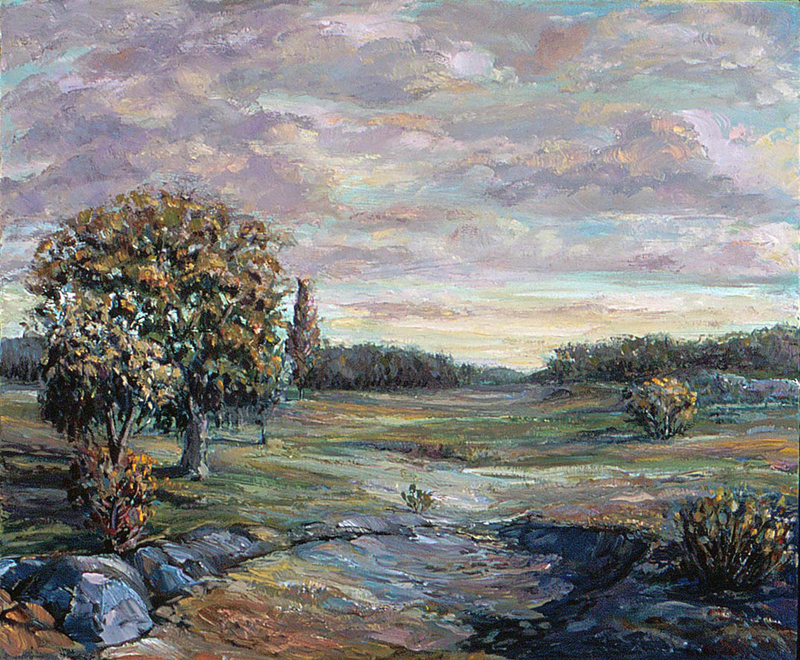 With this series of landscape paintings, I want to make something substantial out of the camouflaged chaos of nature that is both contemplative and therapeutically soothing to the soul. 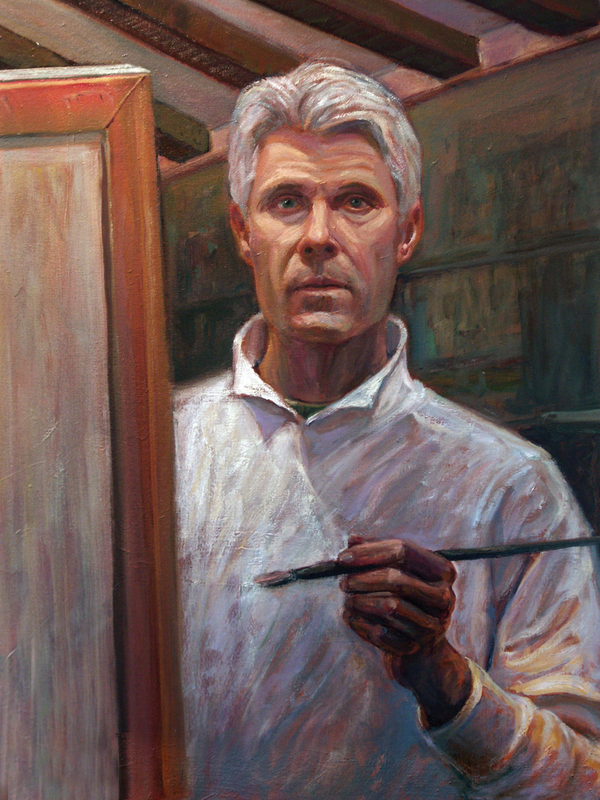 At the same time, I do not want to lose any of the spontaneous brushwork or the dramatic expressive color, which culminates into an artistic “life force” that is part of the process of painting. 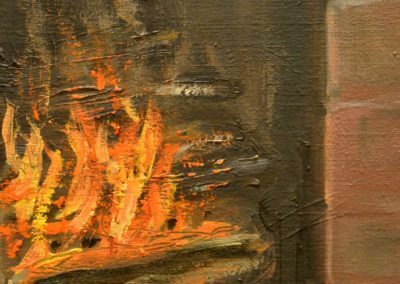 Striking a balance between the inspiration and representation of nature with the intrinsic quality of paint on canvas continues to motivate me. 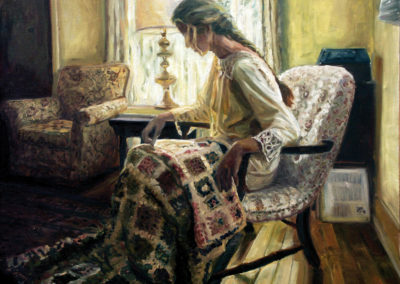 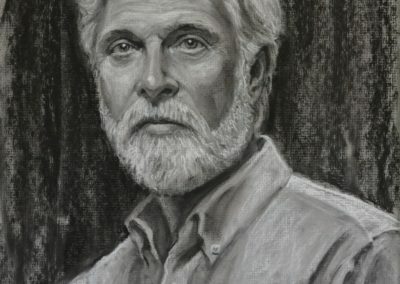 As an art student, I was exposed to a plethora of styles and subject matter, but it was the figure that I found to be most interesting and intriguing. 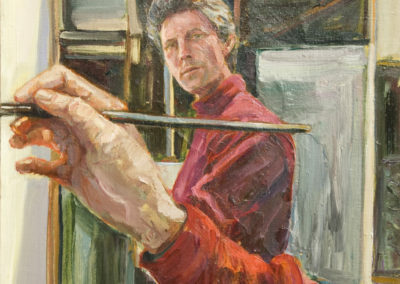 Drawing or painting a figure, more than any other motif, teaches an artist discipline as well as eye-hand coordination, because a human body has a canon of proportions that everyone recognizes regardless of whether the perspective or proportion have been altered. 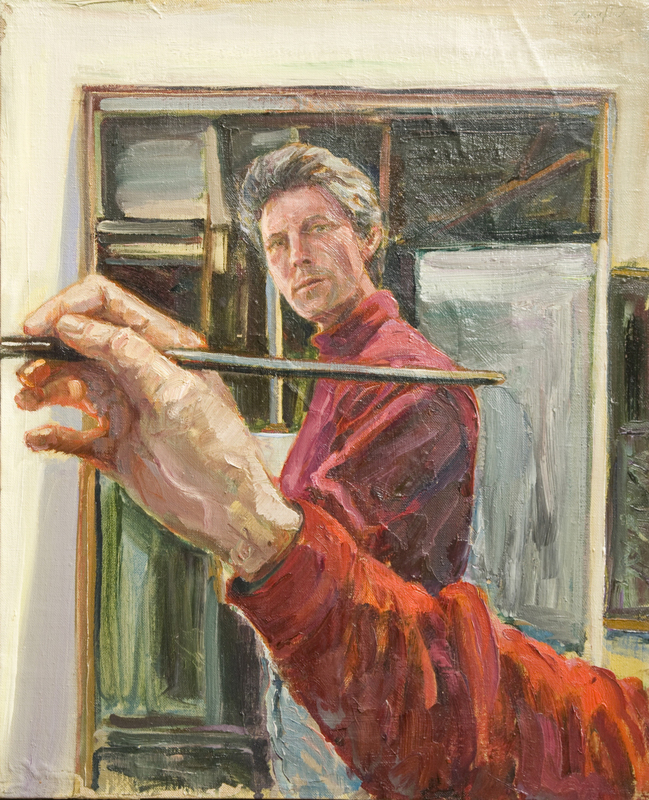 Additionally, the narrative and psychological qualities associated with the human being have motivated artists throughout history. 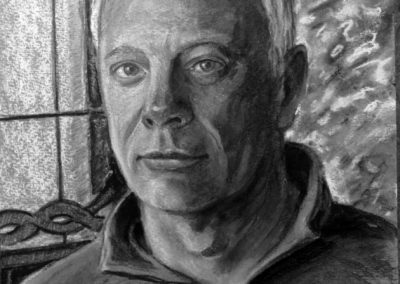 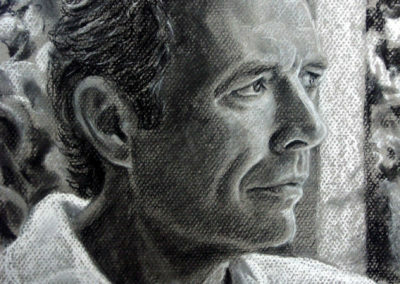 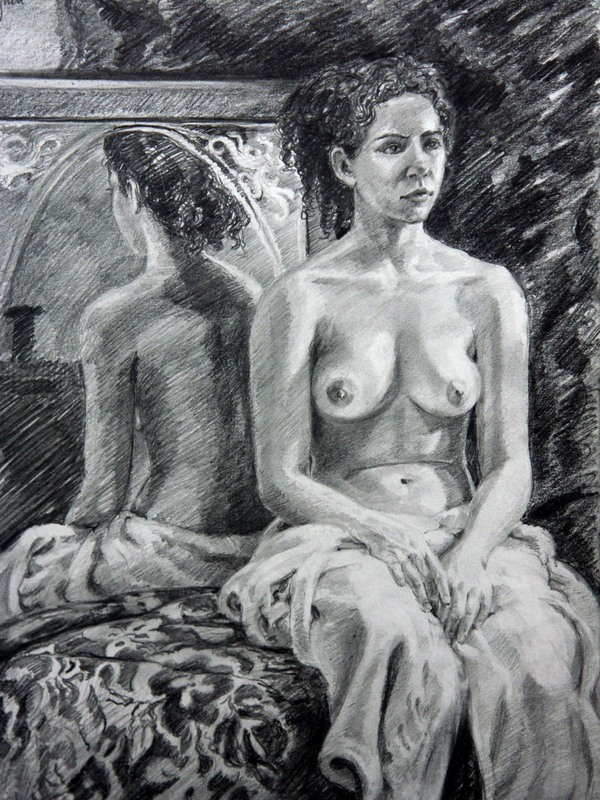 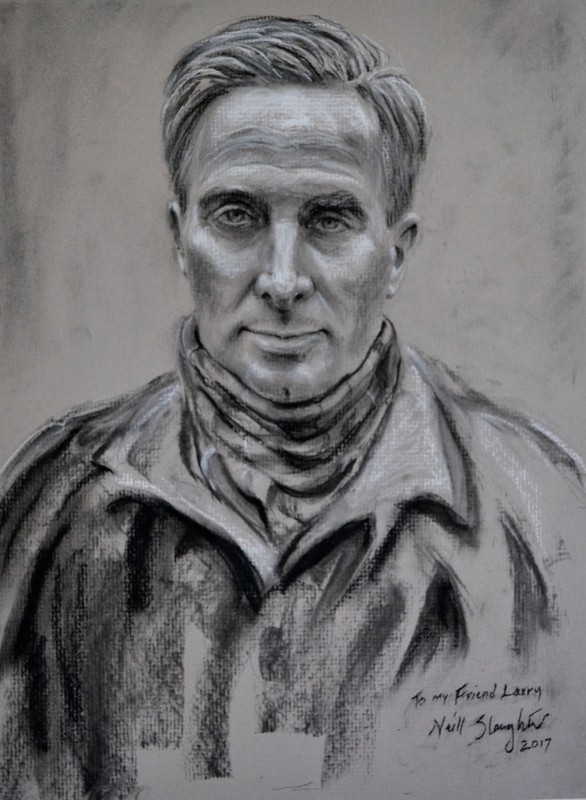 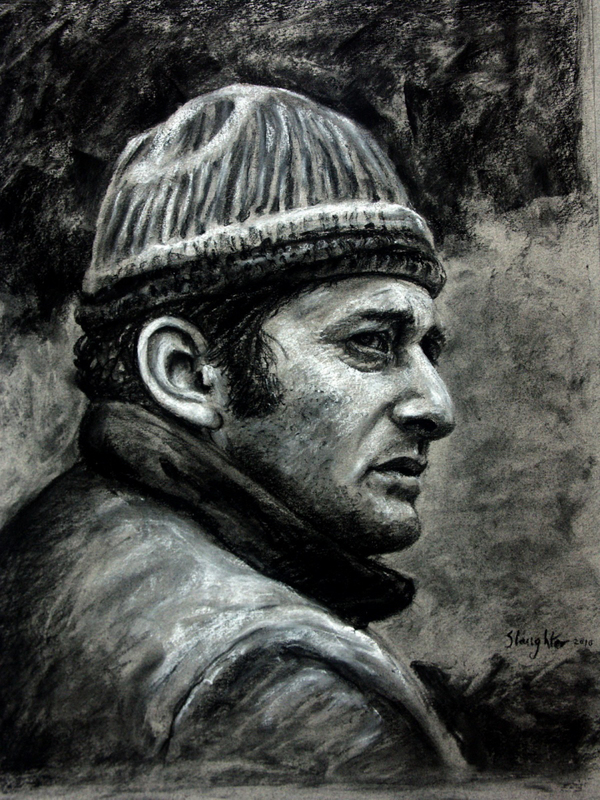 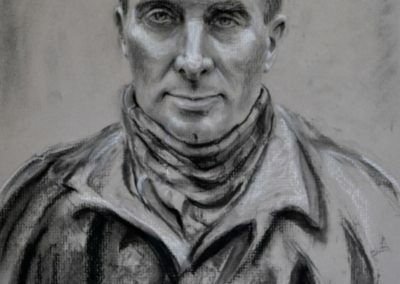 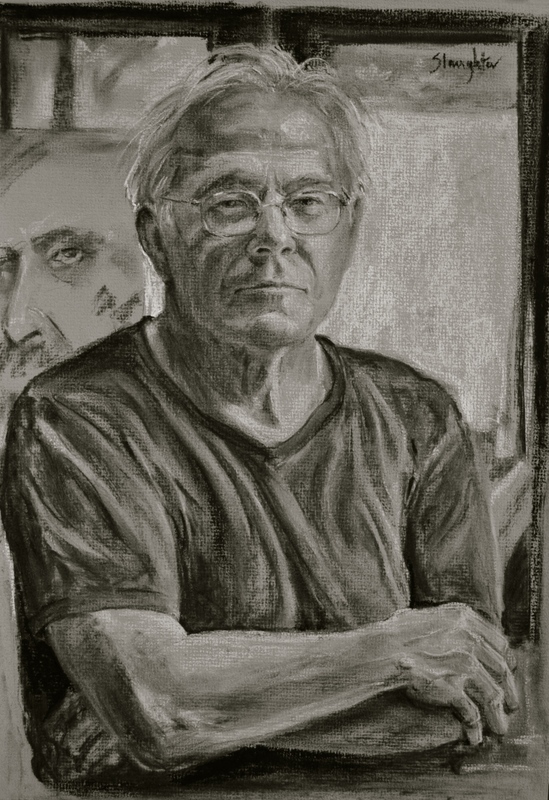 Although I have explored many other aspects of drawing and painting, the figure – with its inextricable relationship to the human condition – continually fascinates me, because it is so emotionally charged and evocative. 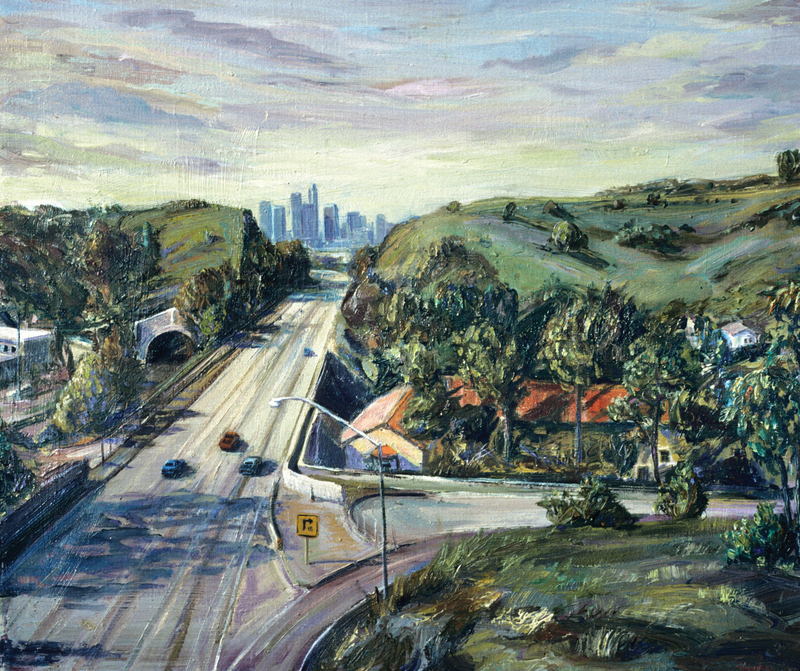 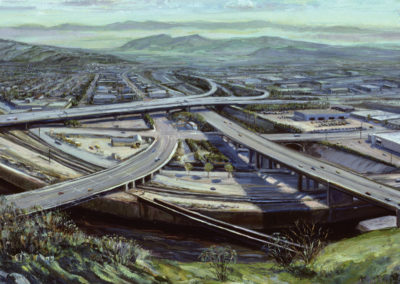 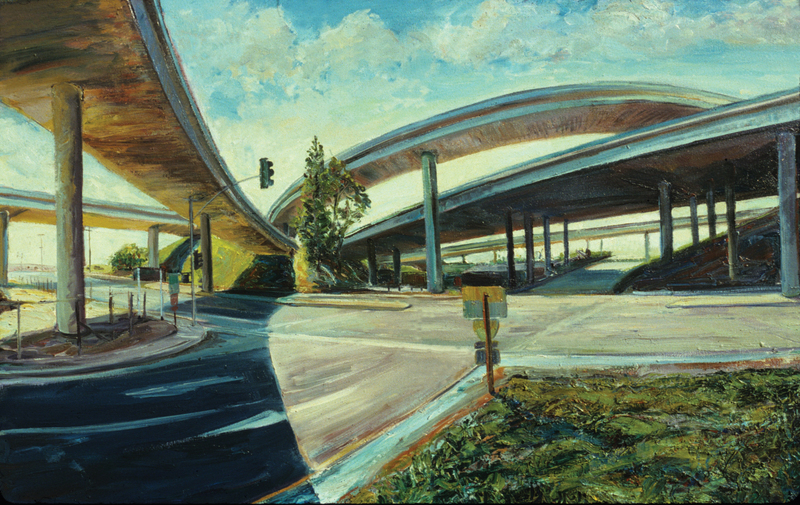 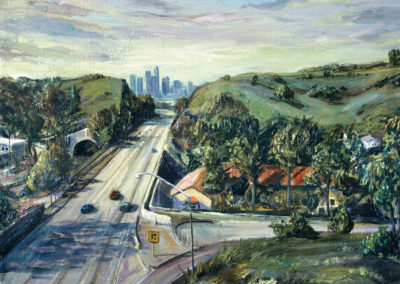 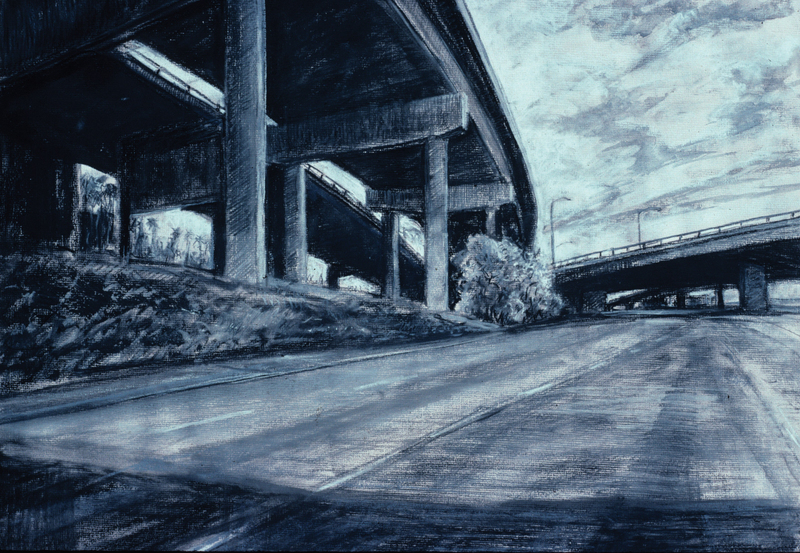 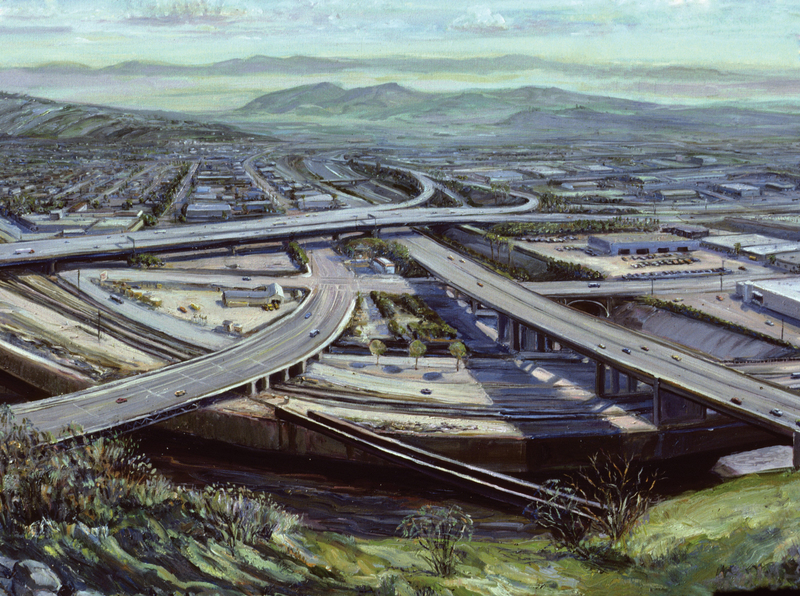 While living in Los Angeles, I developed a series of drawings and paintings in the early 1990’s that arose from having to spend an inordinate amount of time on the freeways of southern California. 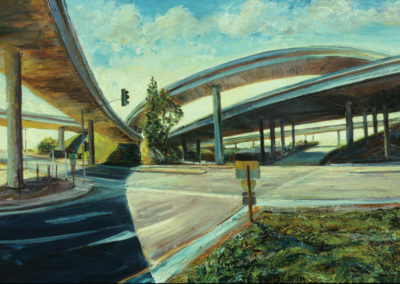 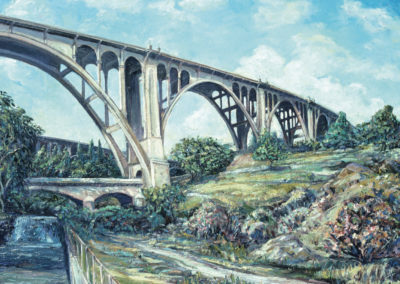 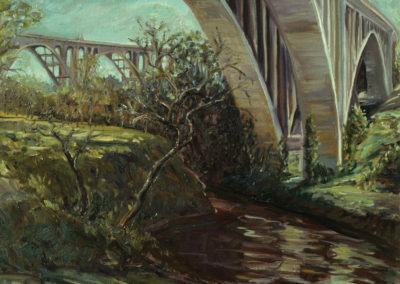 Although I find the labyrinth of overpasses, entrance and exit ramps aesthetically intriguing, I also find it ironic that modern man sees these concrete arteries, which shuttle the masses from the suburbs to the city centers, as a progressive or efficient manner in which to move a modern society. 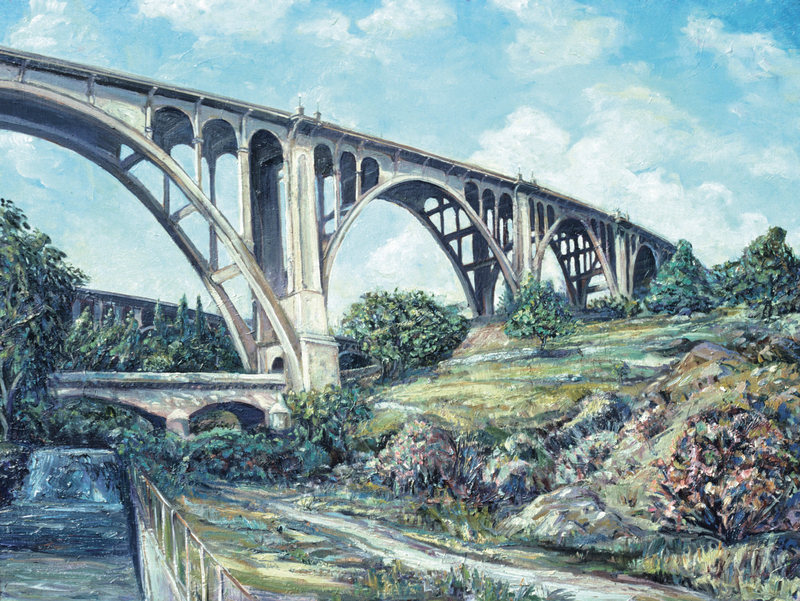 These bridges and freeways are in effect modern society’s icons, standing as symbols of where civilization has come from…but ultimately where are we bound? 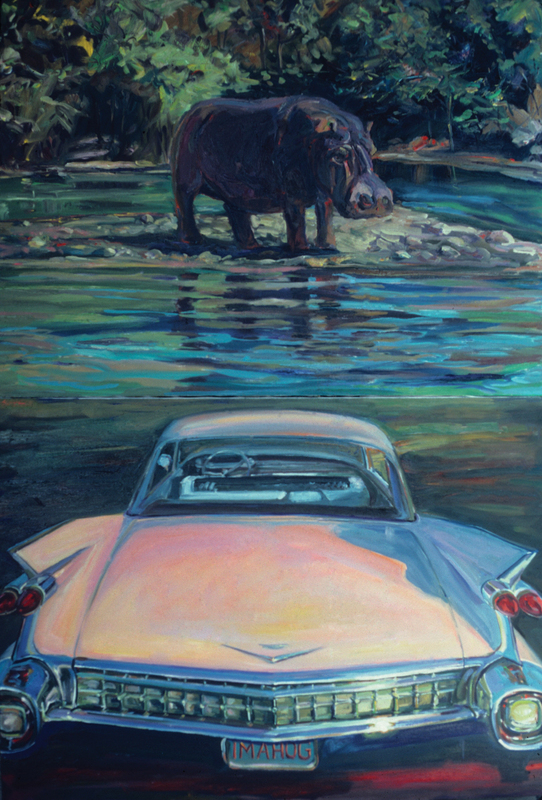 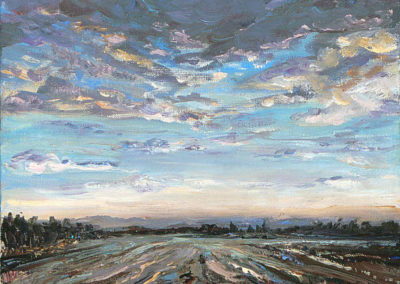 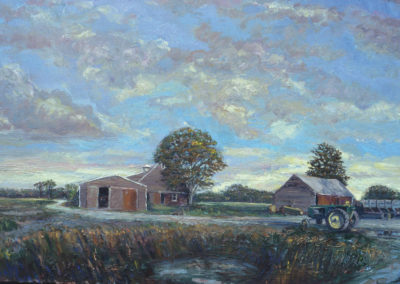 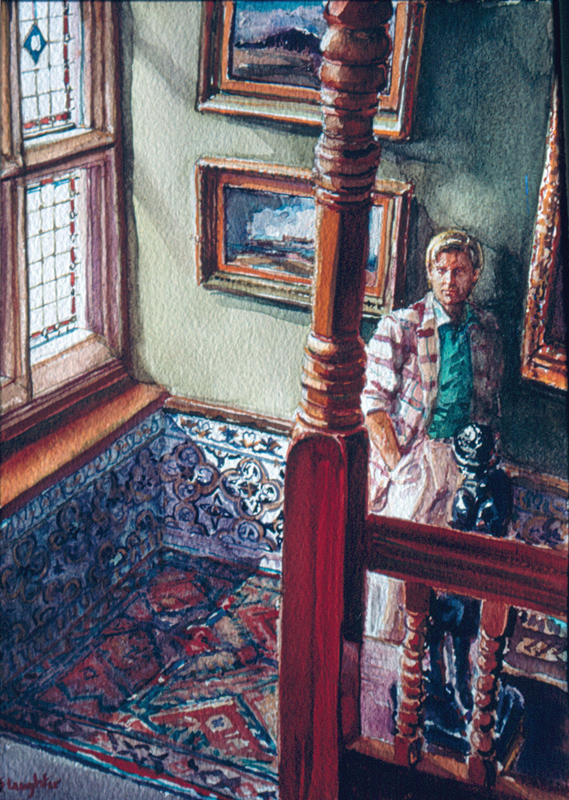 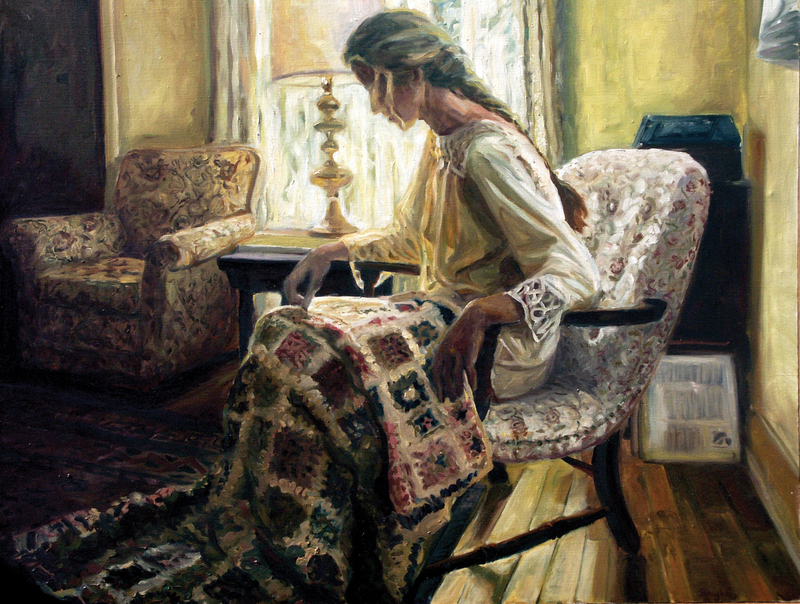 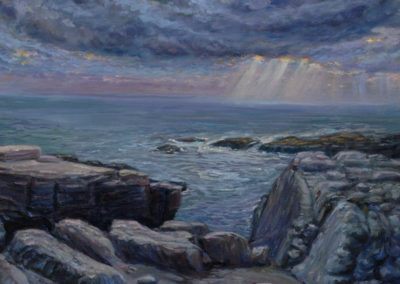 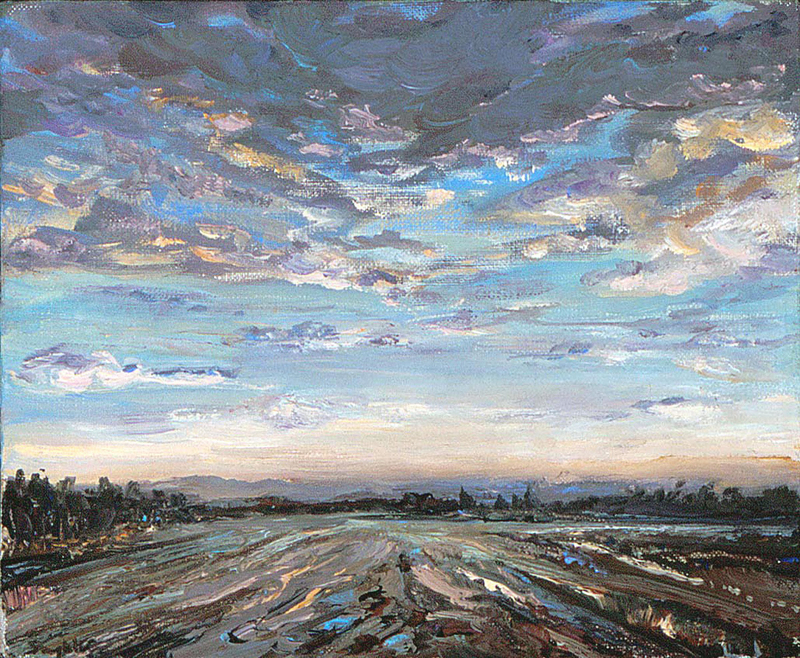 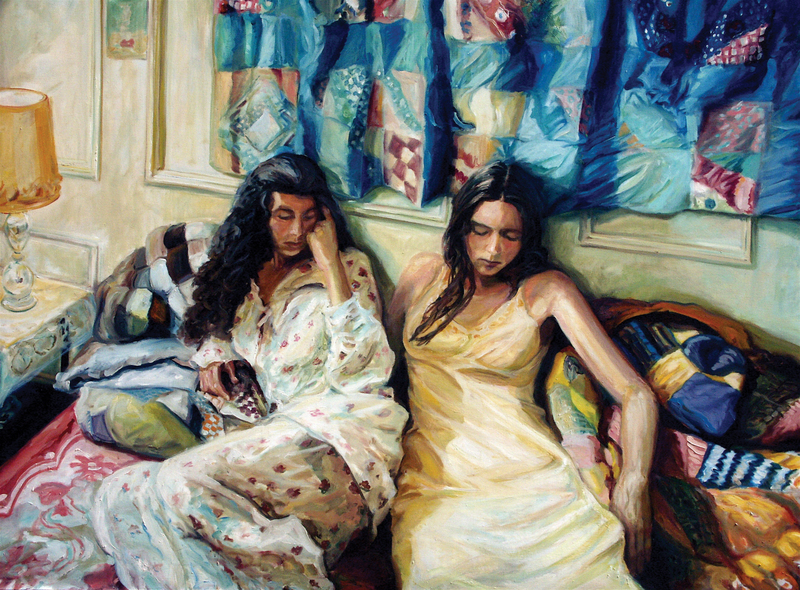 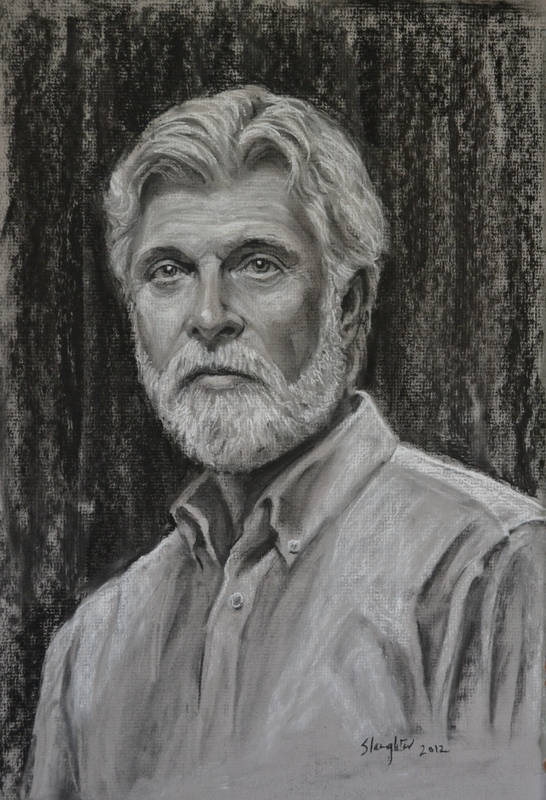 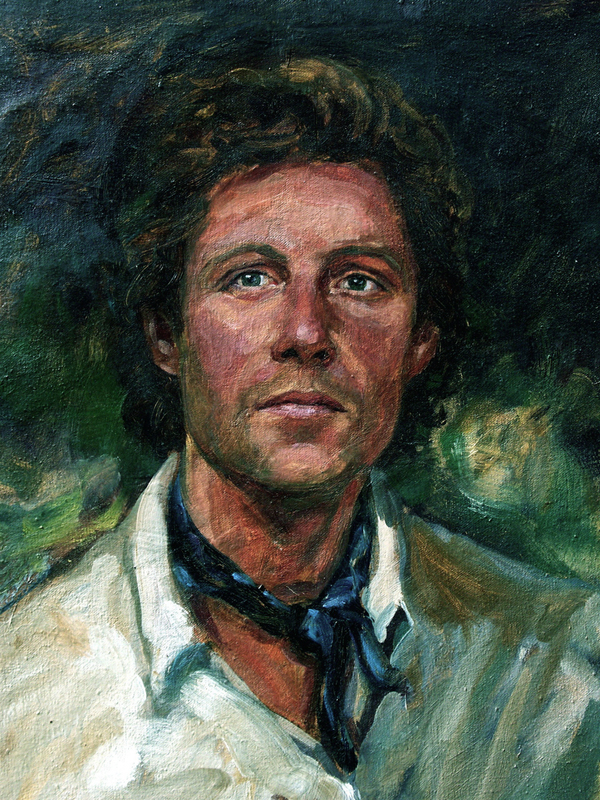 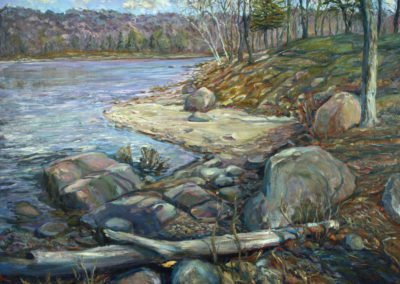 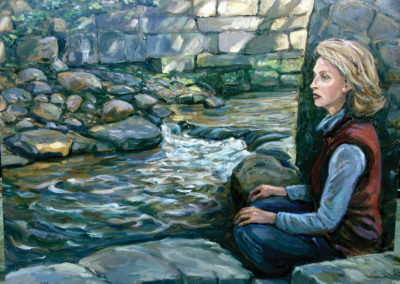 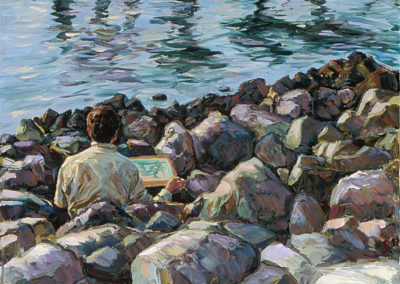 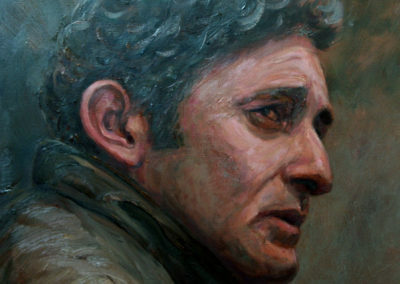 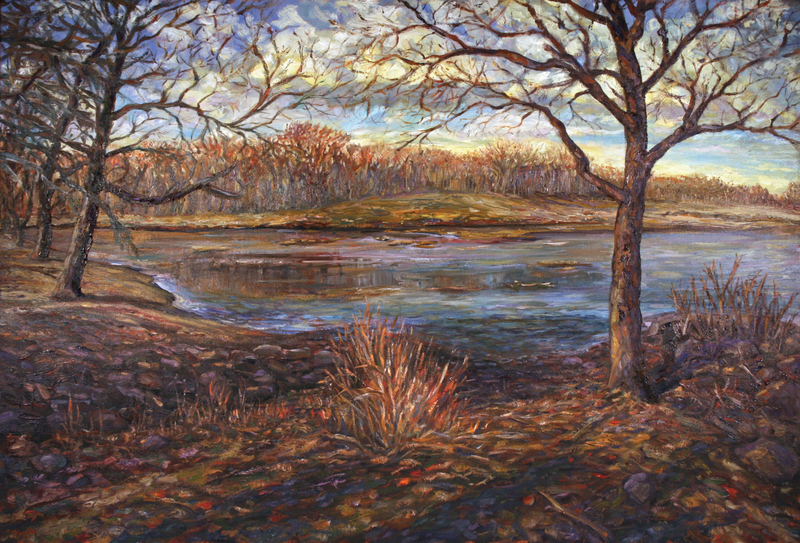 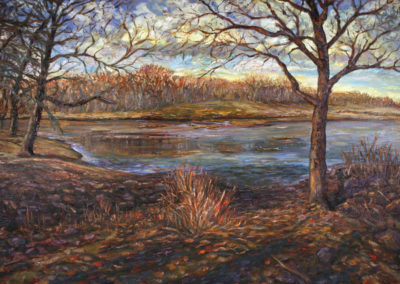 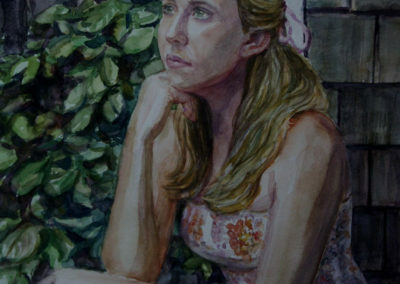 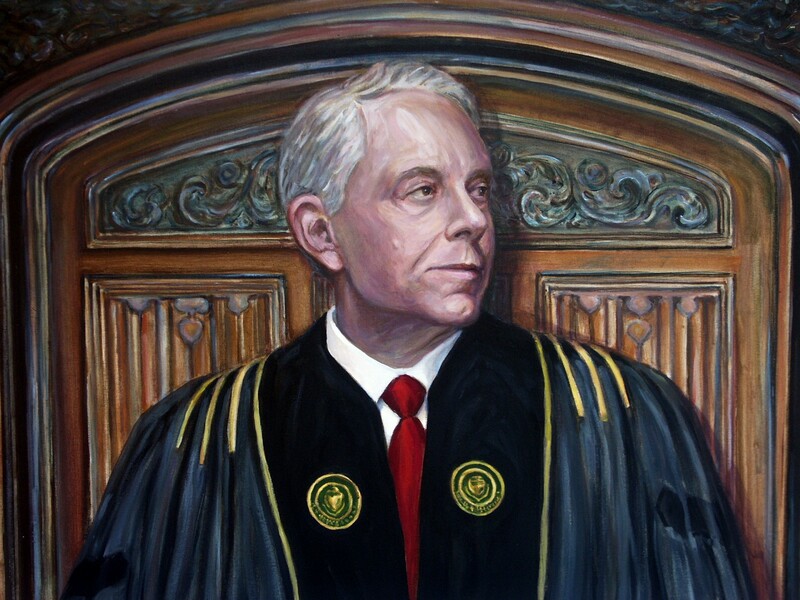 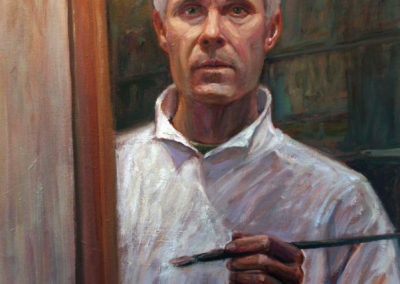 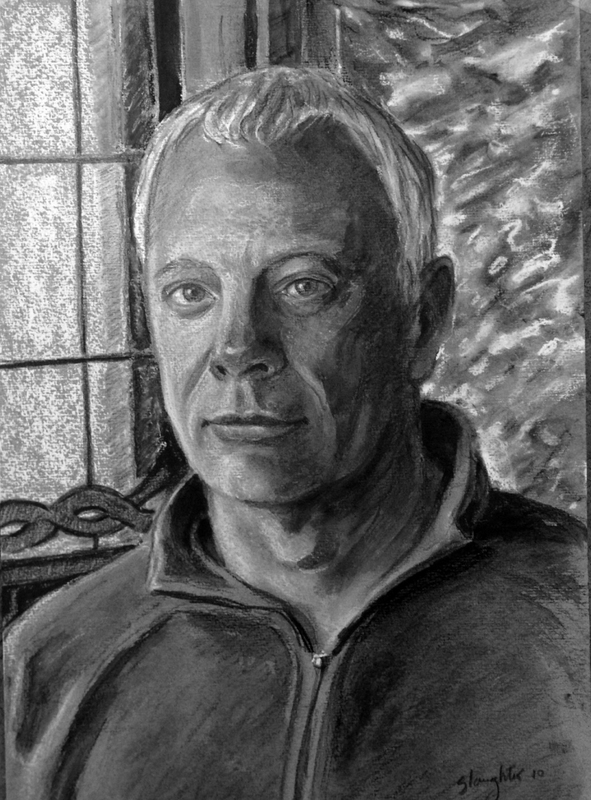 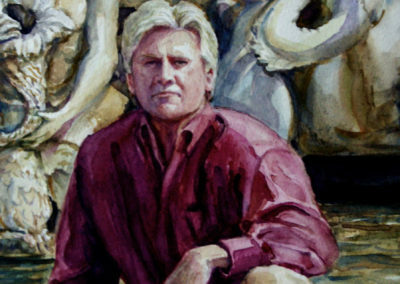 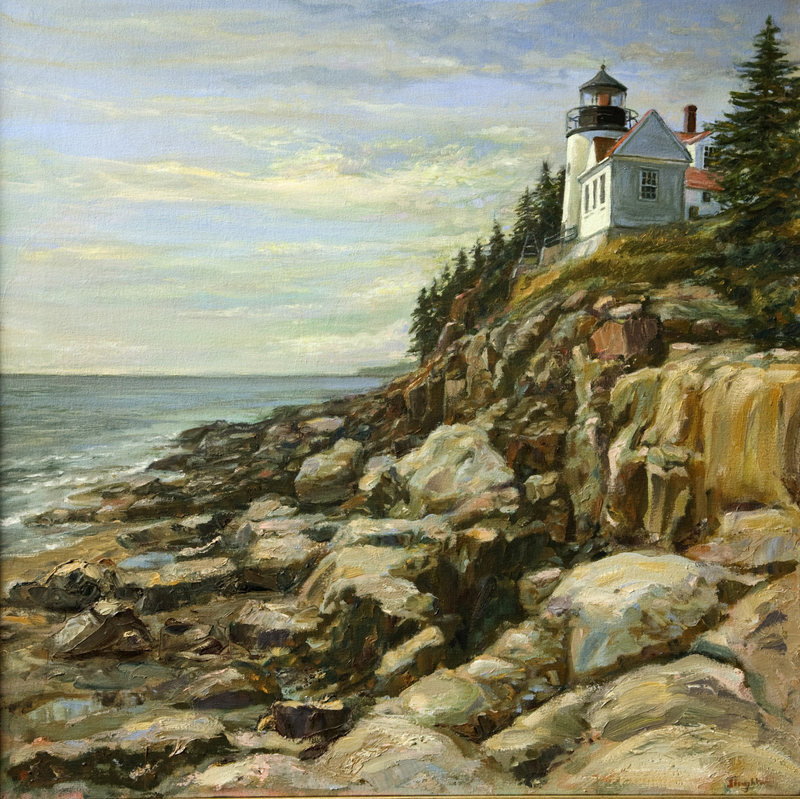 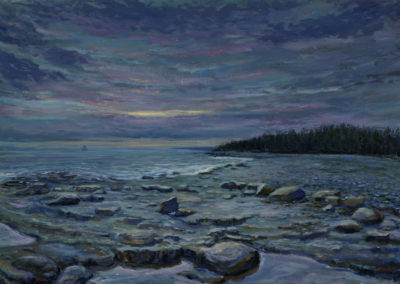 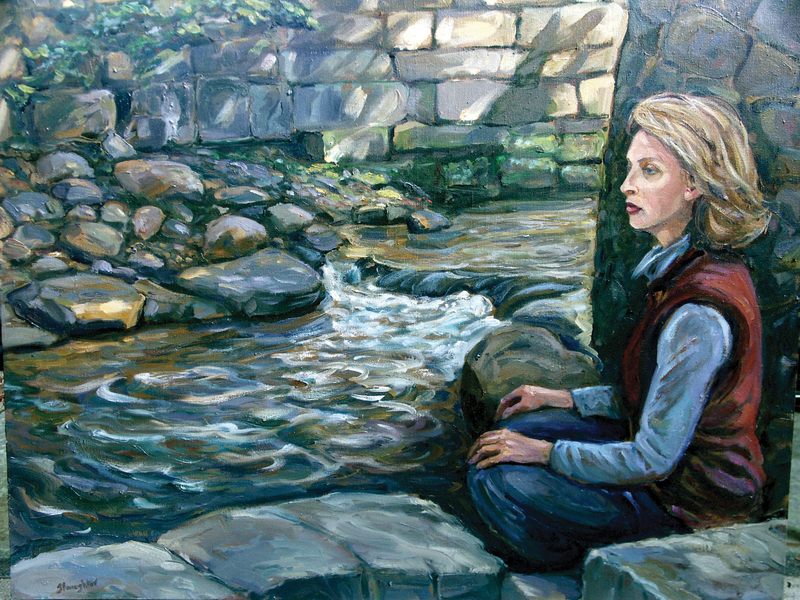 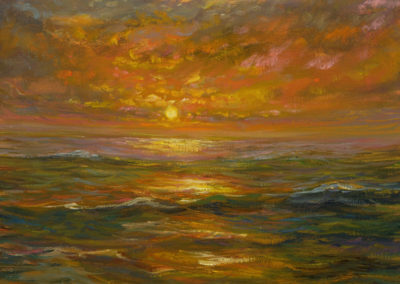 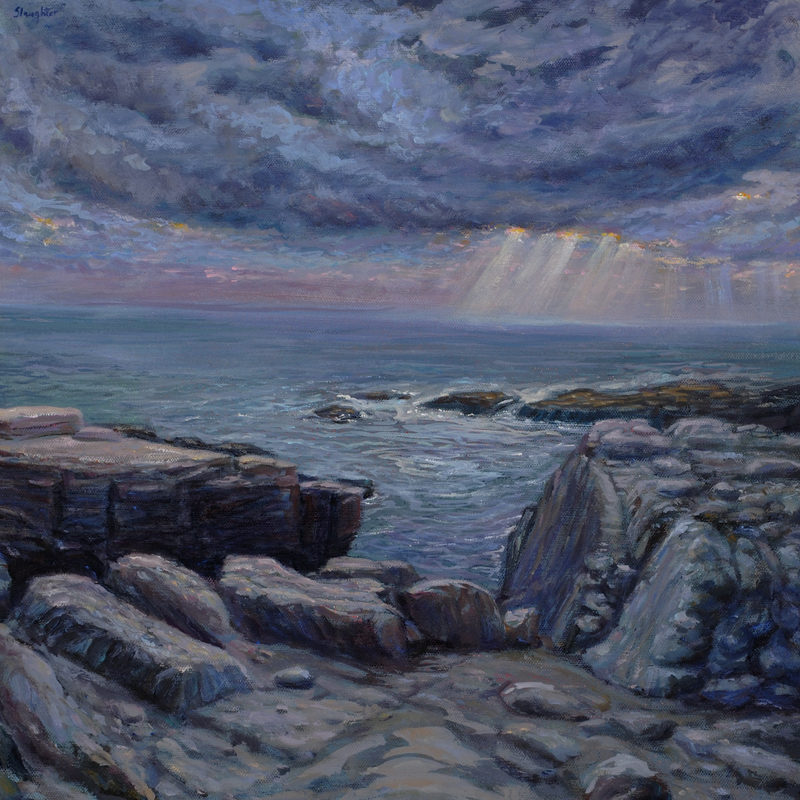 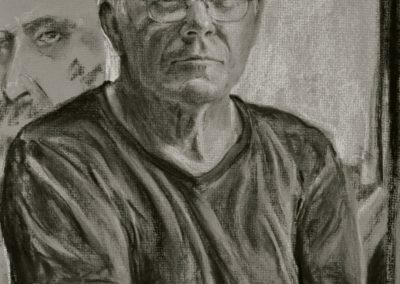 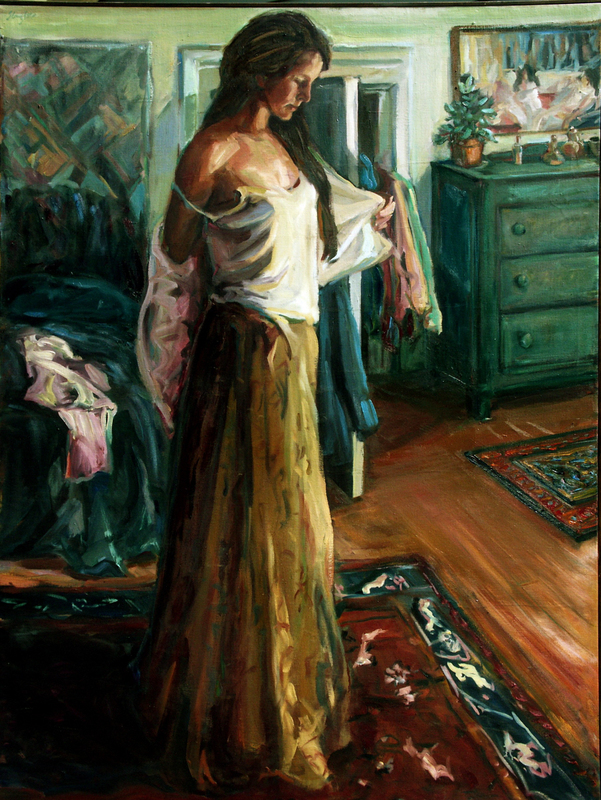 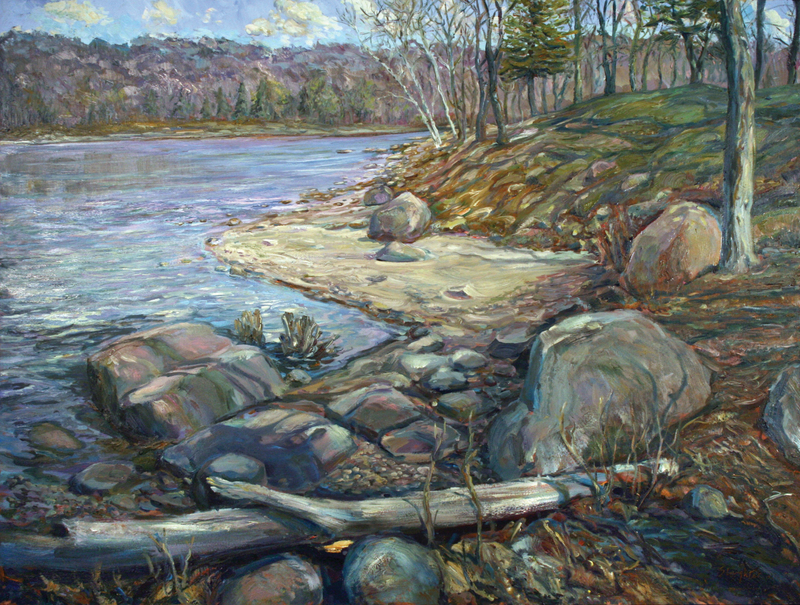 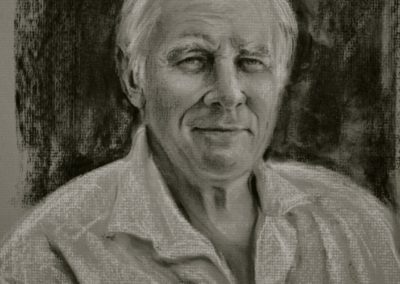 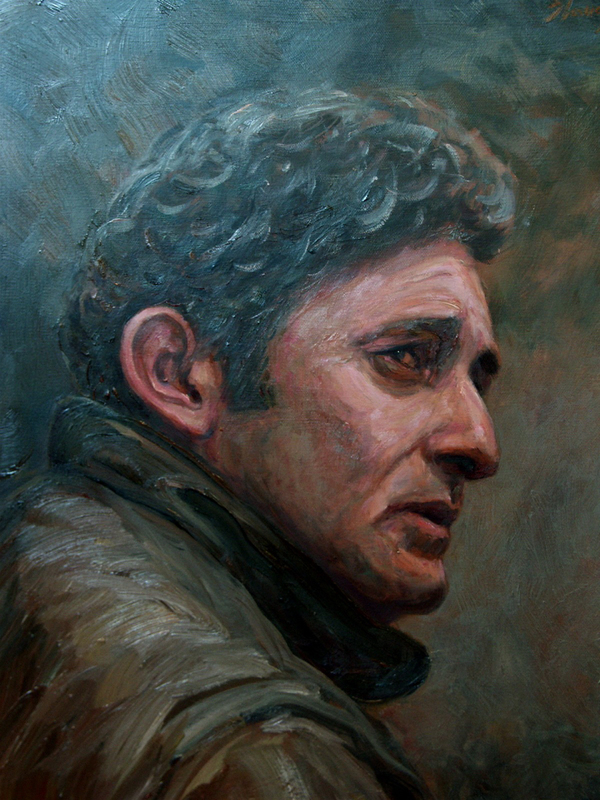 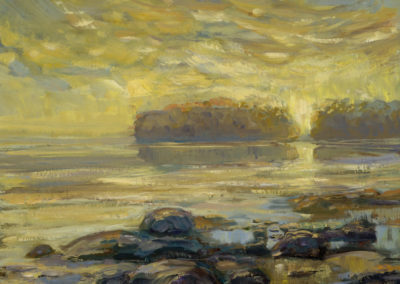 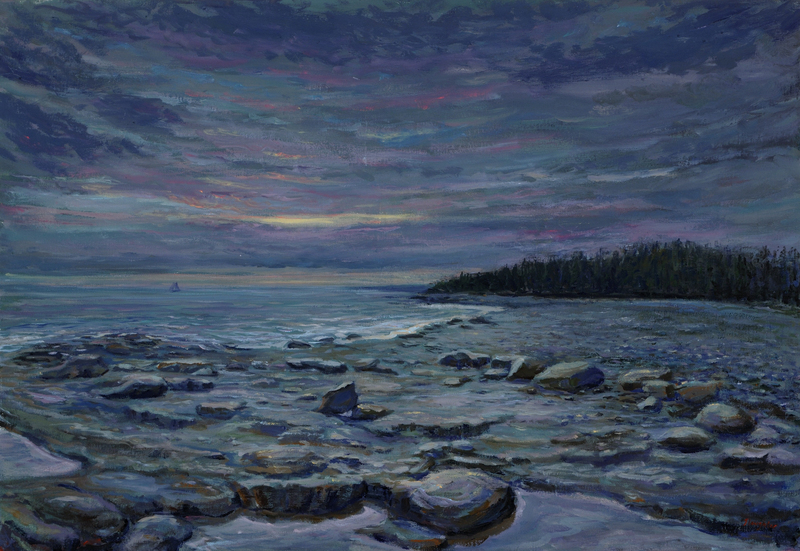 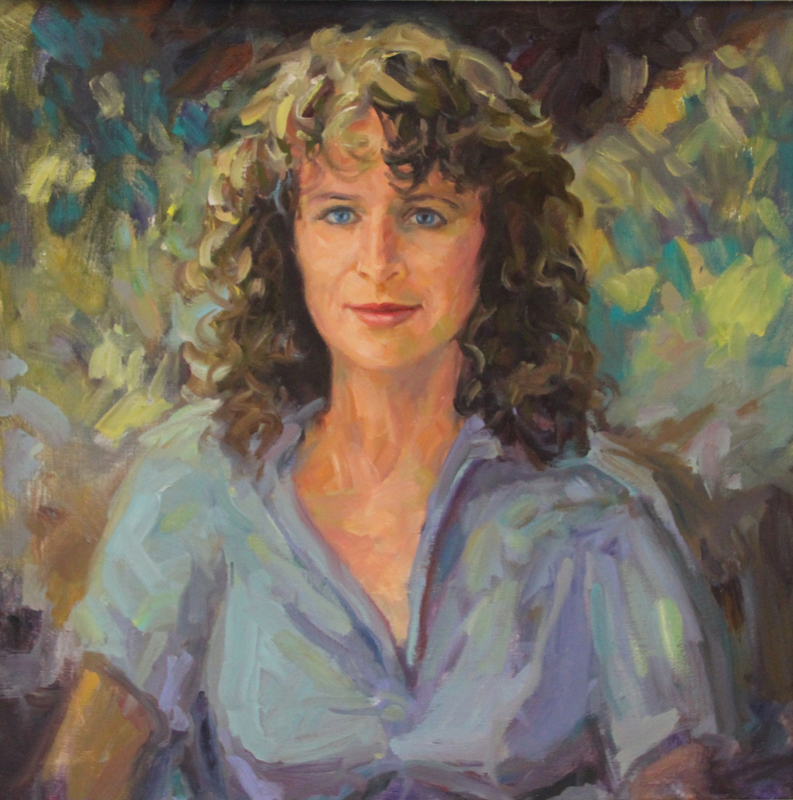 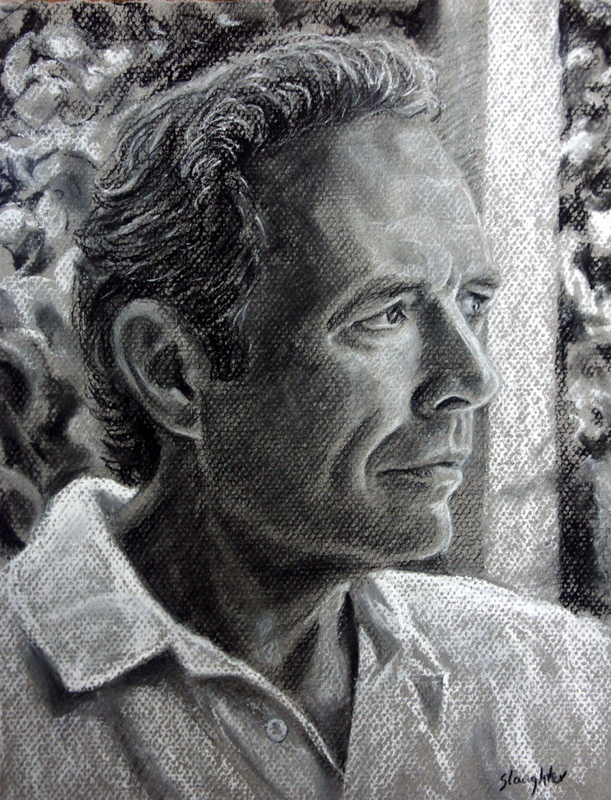 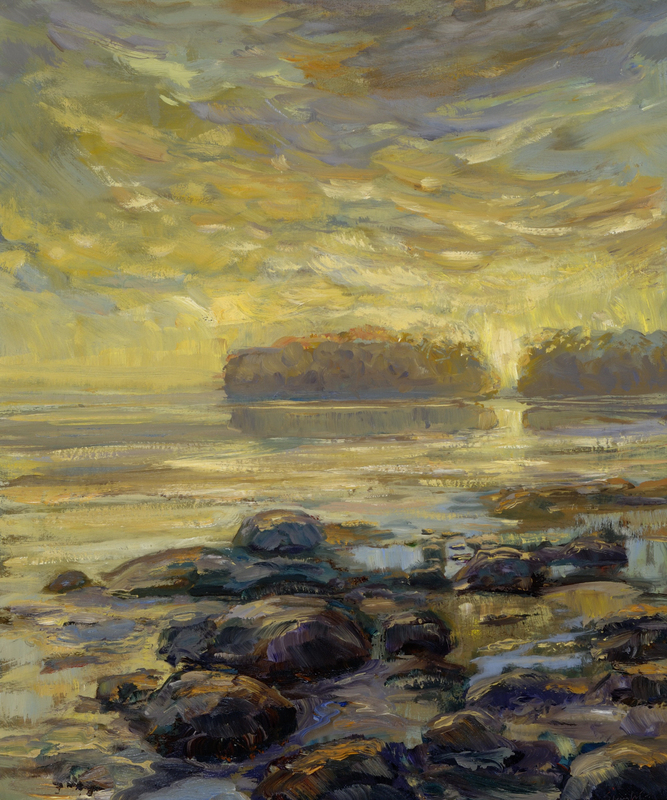 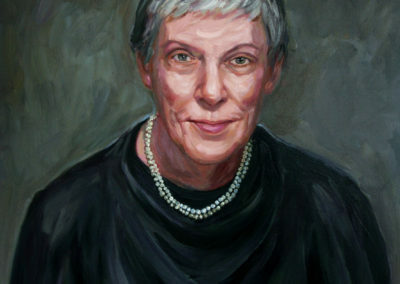 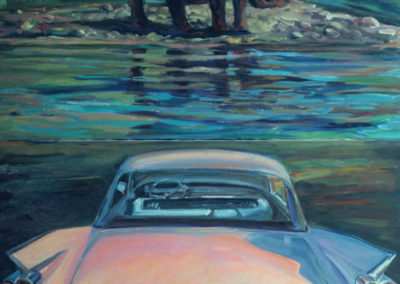 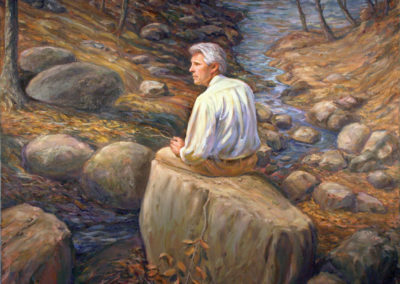 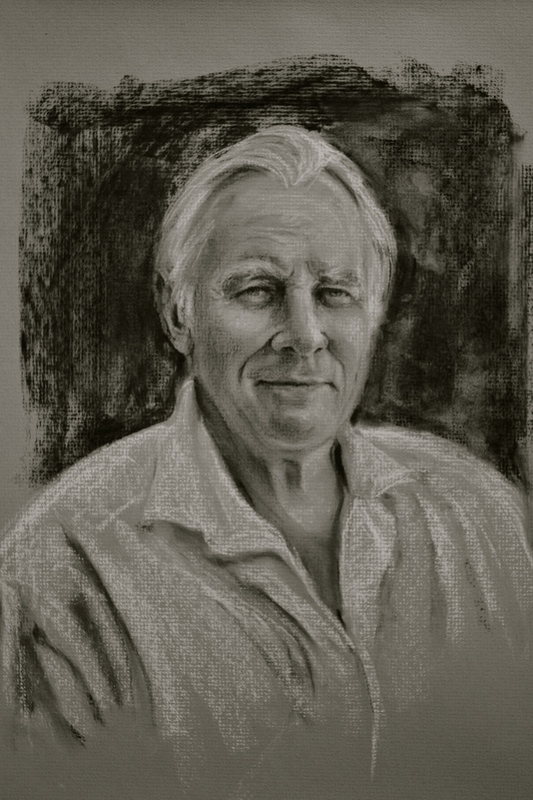 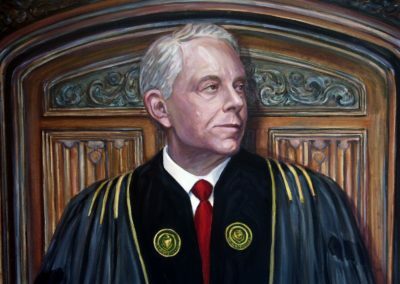 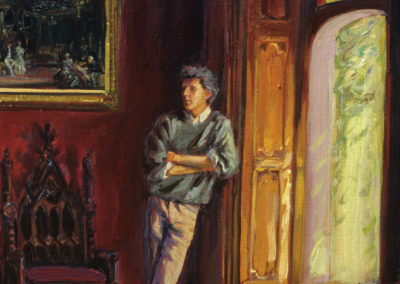 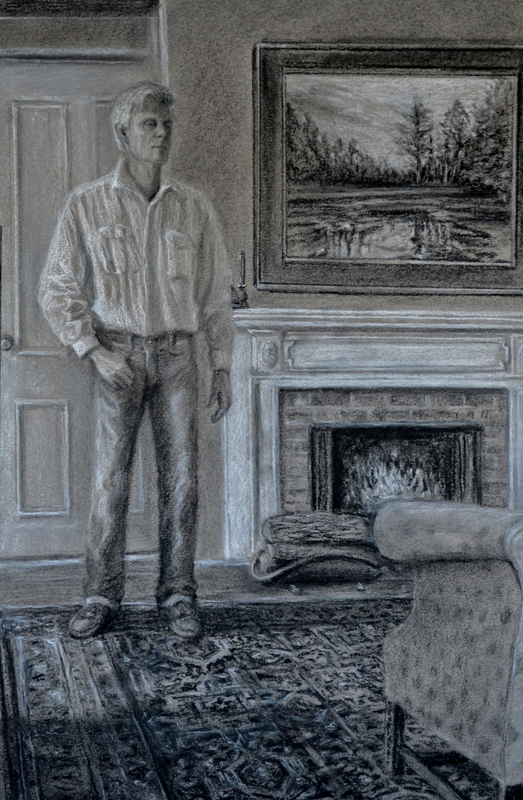 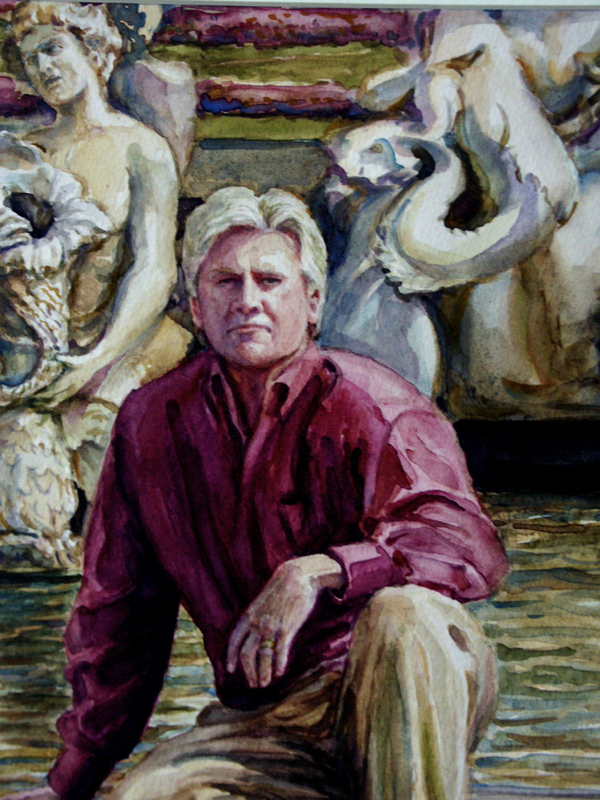 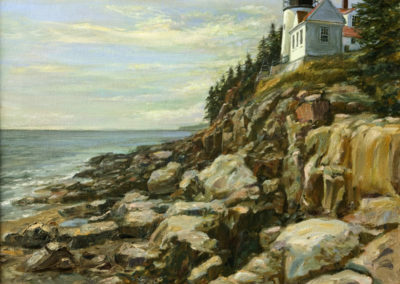 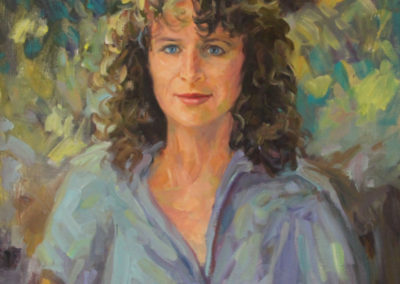 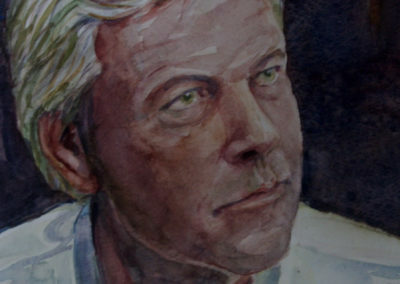 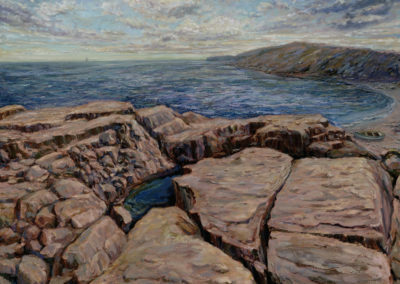 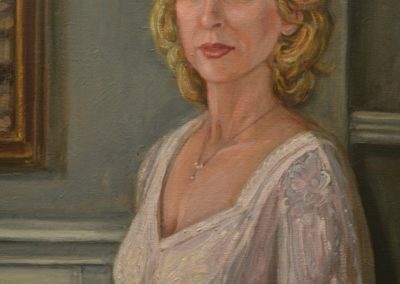 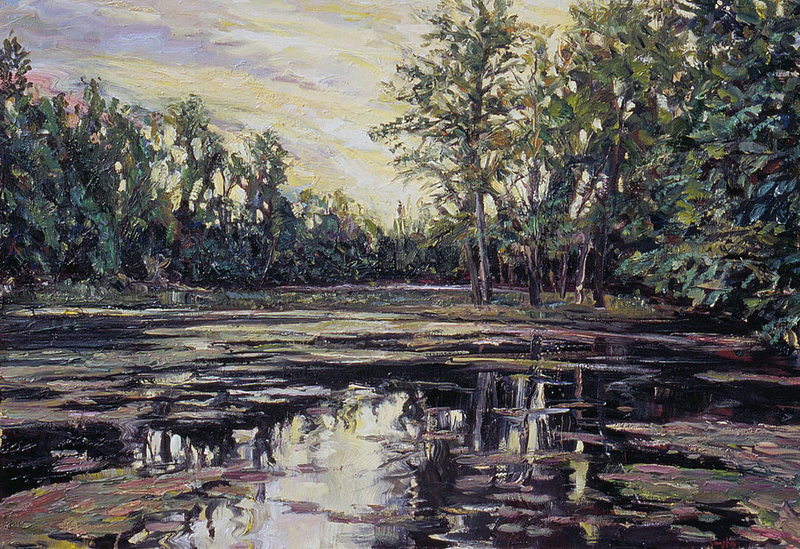 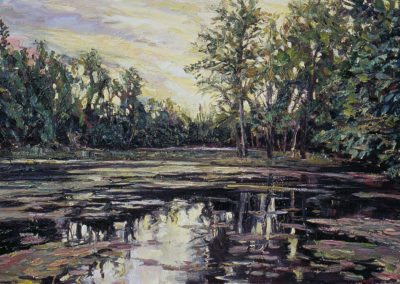 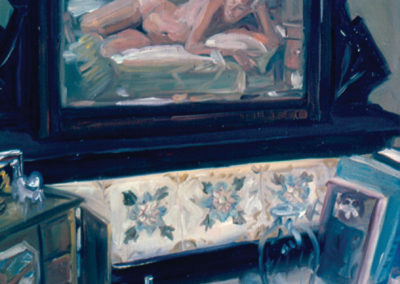 Working as a professional artist as well as a university professor for more than three decades now, I have, throughout the years, painted quite a range of diverse subject matter. 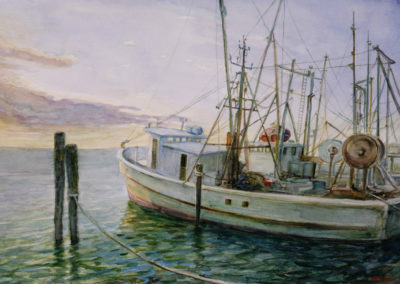 While preparing for this exhibit I reflected upon the fact that I have periodically returned to images related to ships and the sea. 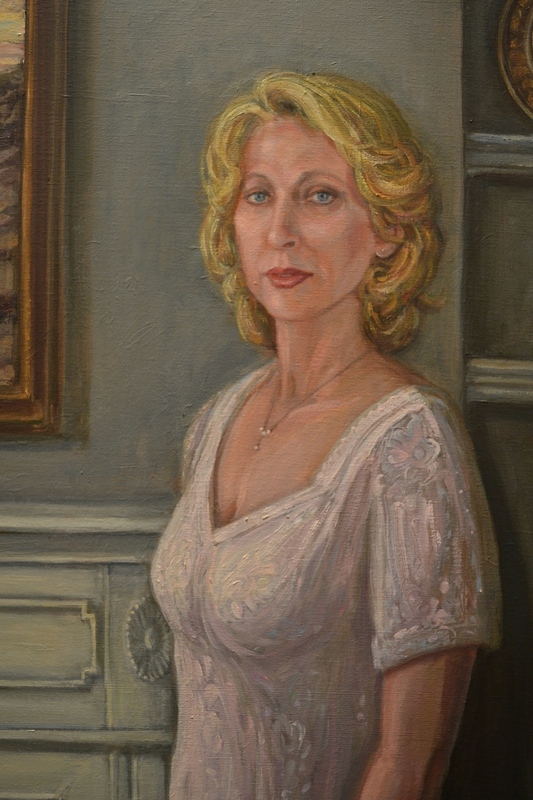 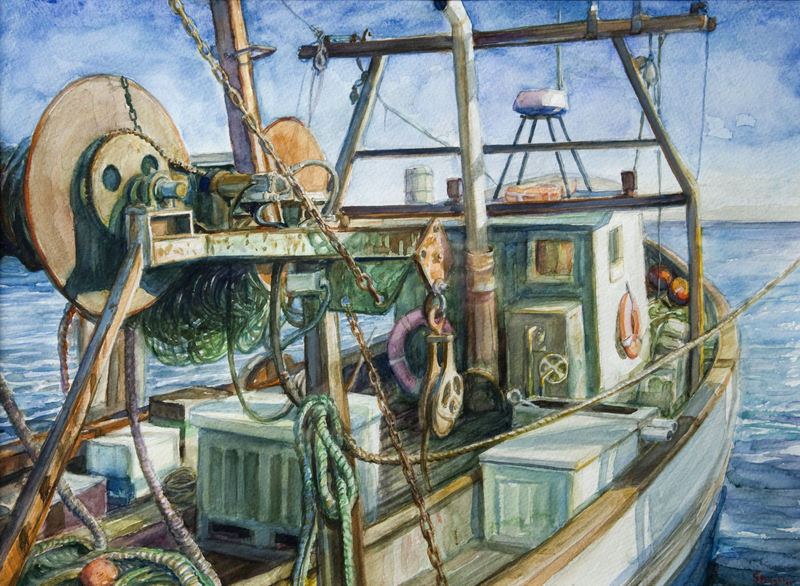 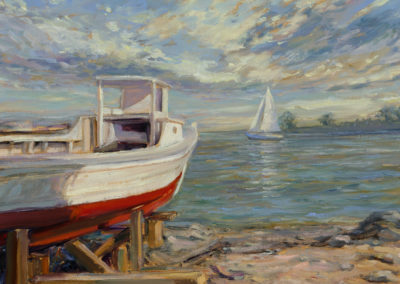 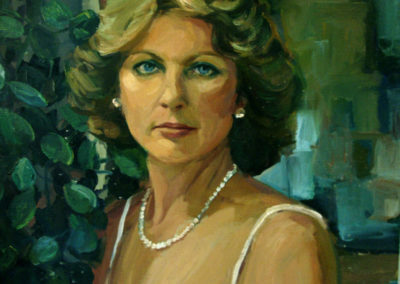 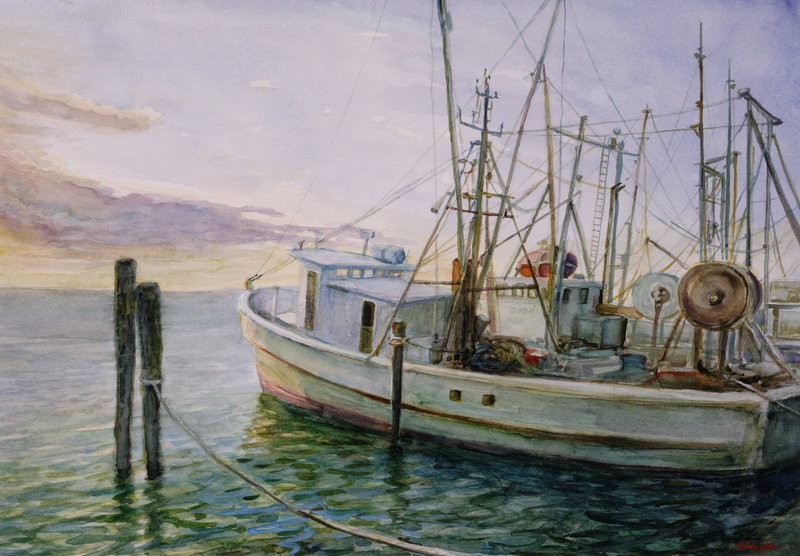 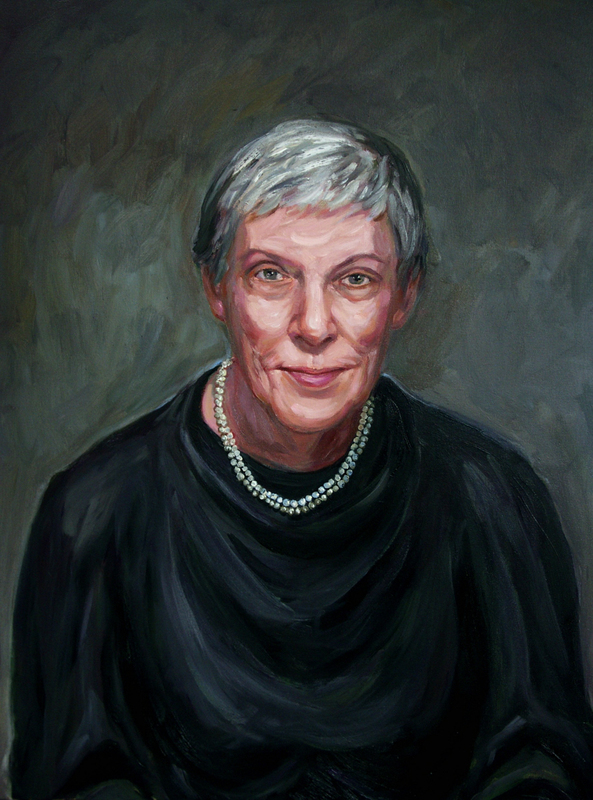 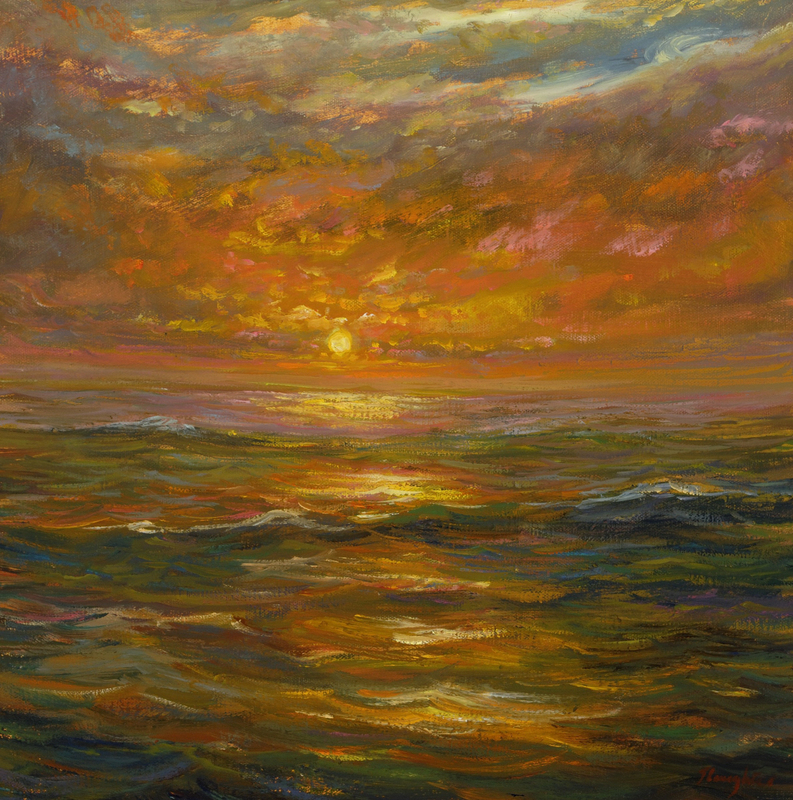 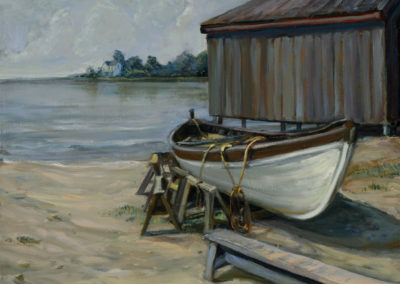 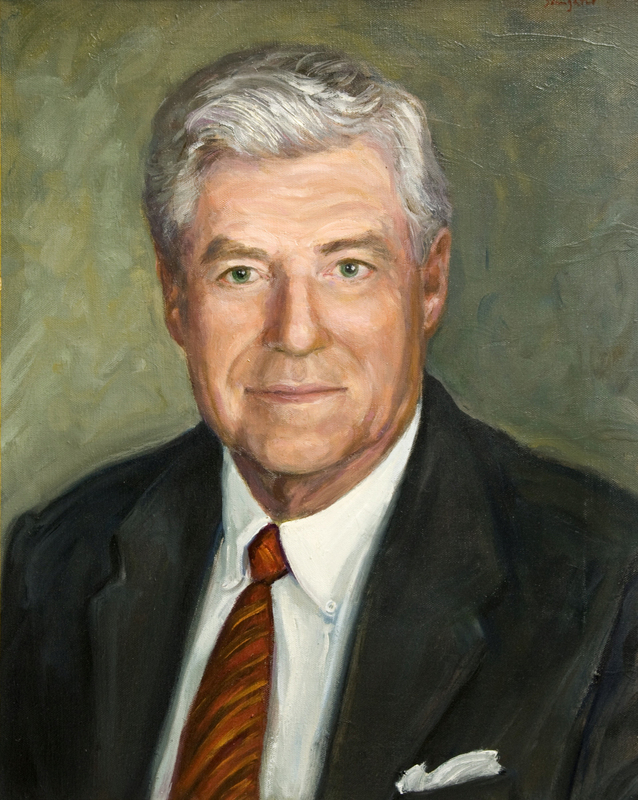 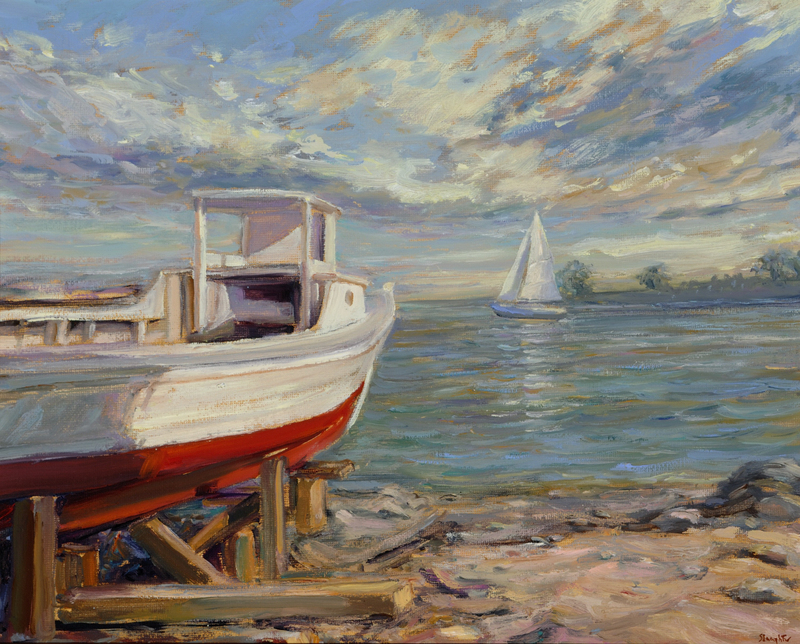 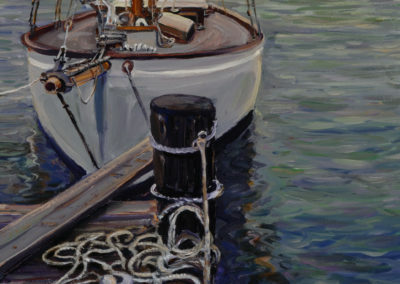 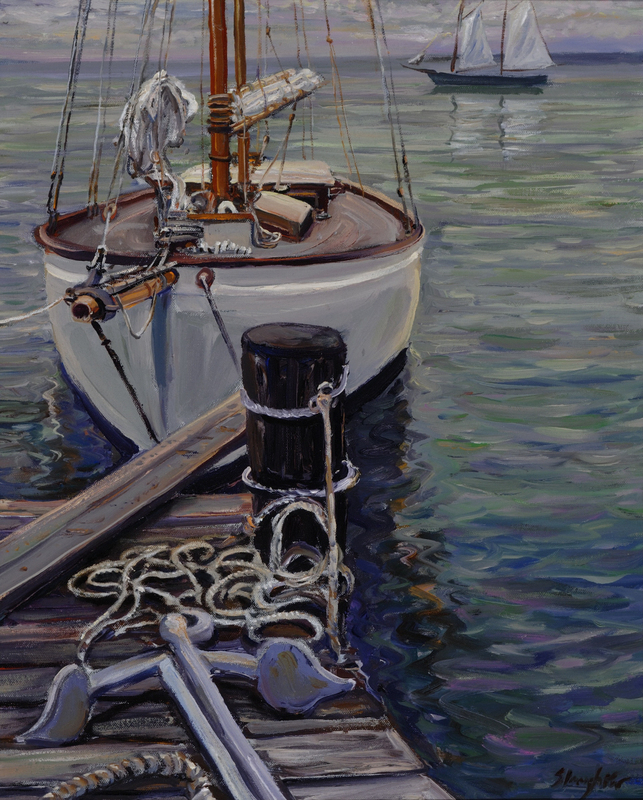 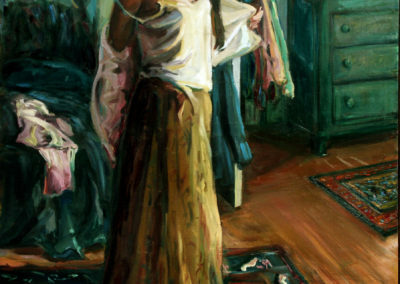 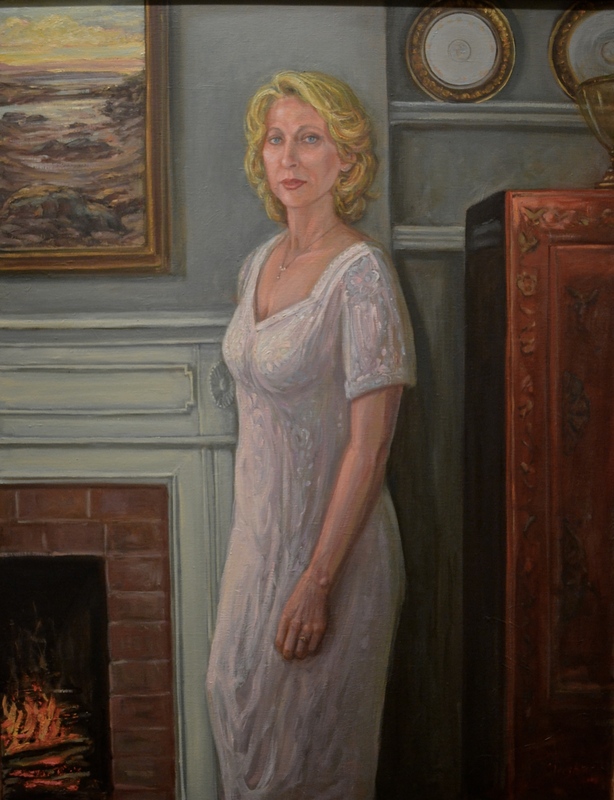 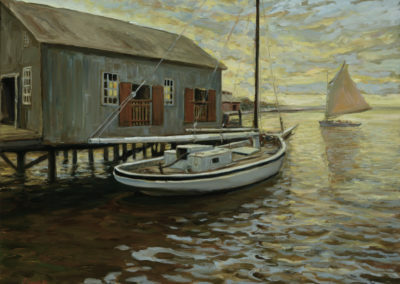 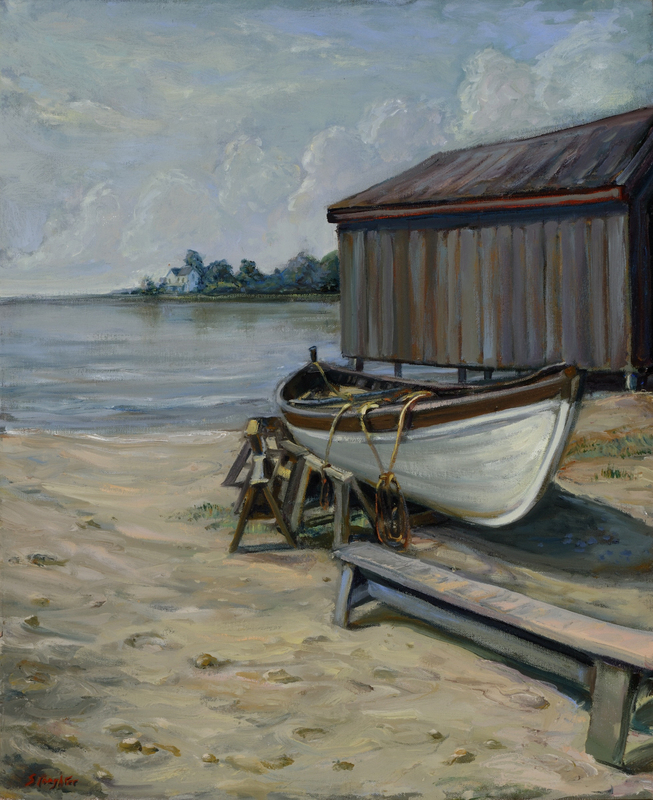 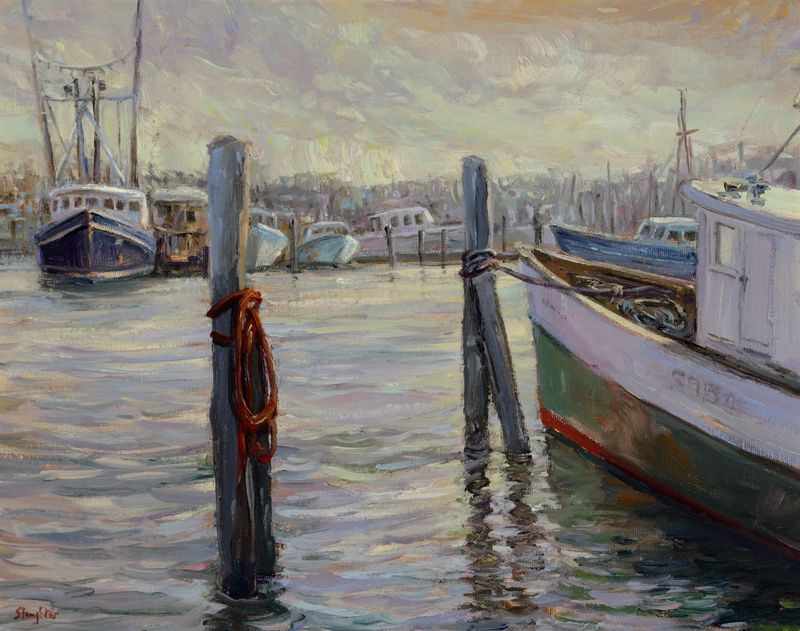 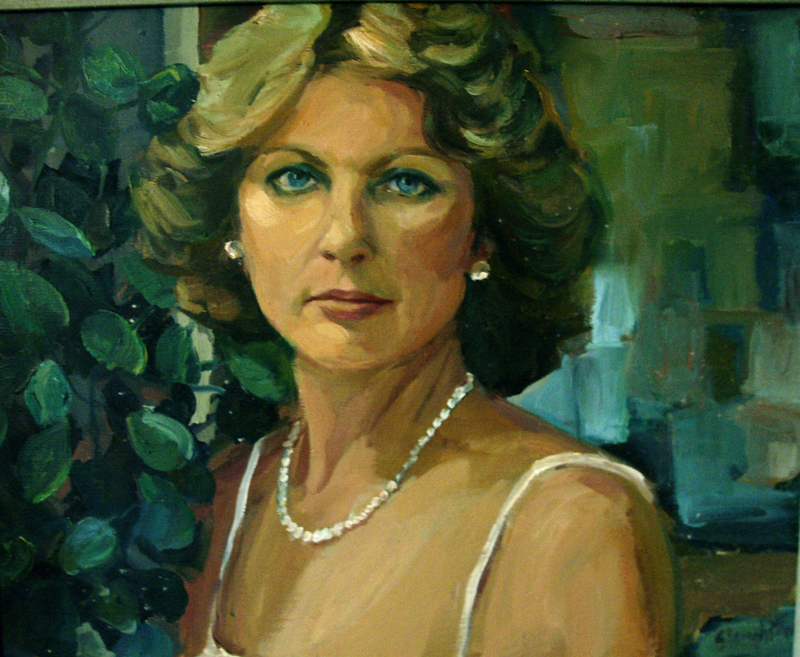 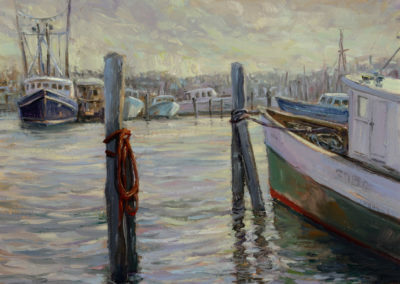 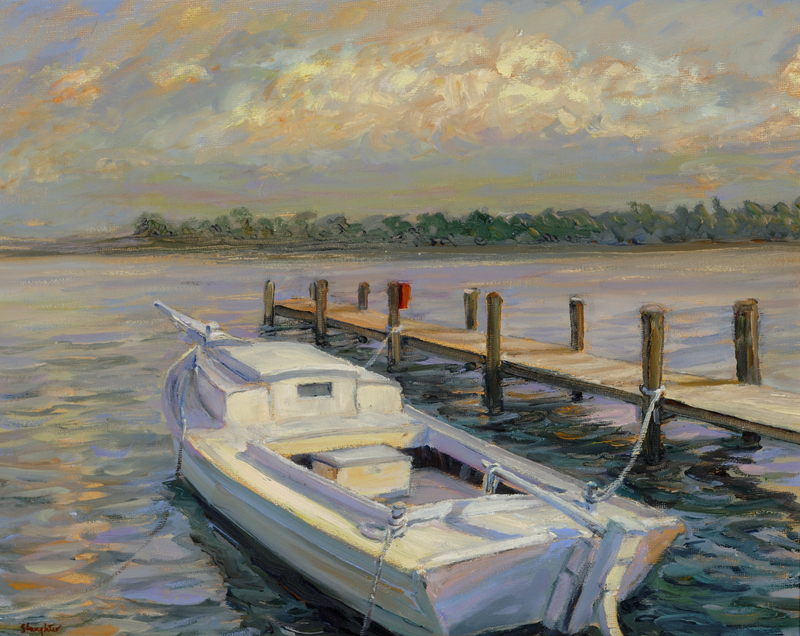 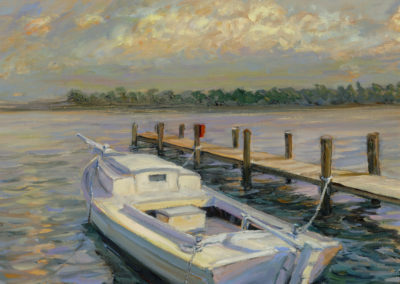 I had not set out in my early artistic career to purposely plan any of the subject matter, which would serve as inspiration to create my art, but even as a young child my family and I lived in Annapolis while my father, a naval officer in WWII, taught at the Naval Academy. 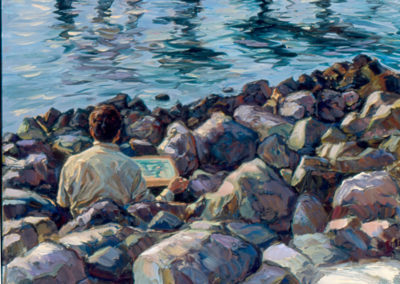 I suppose through osmosis I was always a little wet behind the ears and steeped in the romance of the sea. As a college student I remained fascinated with the sea, suspending my studies in art to spend a period of time as a crew aboard a 90-foot gaff-rigged schooner and was fortunate to meet Jacque Cousteau when his famous ship “Calypso” docked behind us in Galveston Texas. 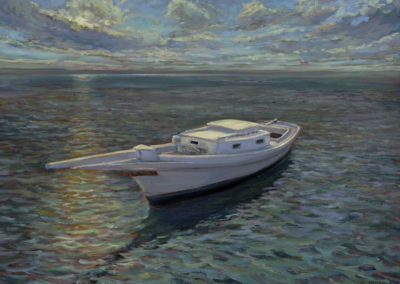 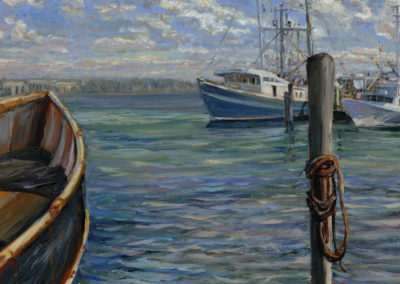 Later I found myself spending summers between college and graduate school working on Hilton Head Island and in the Virgin Islands where some of my subject matter was of a nautical nature. 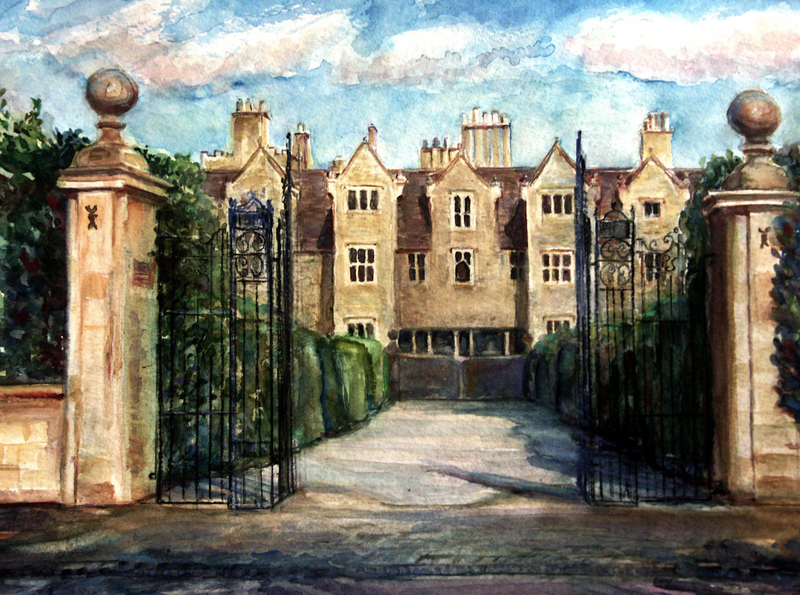 After receiving my MFA degree from Indiana University, I moved to Philadelphia, spending several years investigating a variety of subject matter, but in 1979 I spent the summer abroad in Bosham, England, drawing the ebb and flow of tidal life in that quaint harbor village. 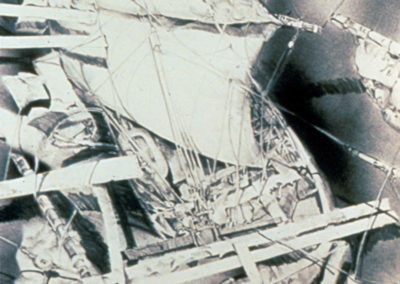 In 1980 I sailed around Great Britain aboard a replica of the famous “Beagle”, which Darwin had sailed upon more than a century earlier. 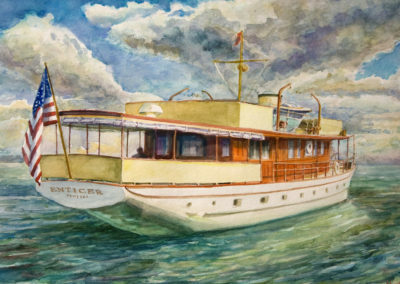 I sailed with a number of artists and art historians whom Richard Demarco, my art gallery dealer in Edinburgh, Scotland had invited on this adventure. 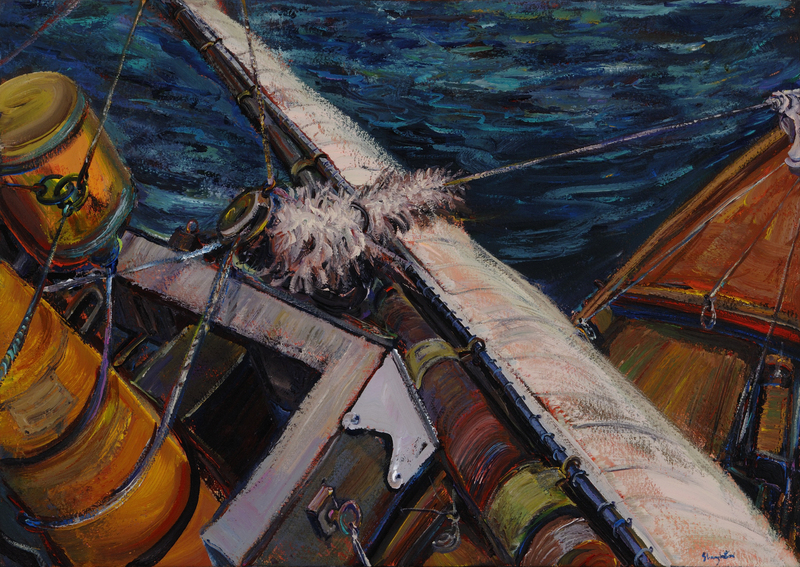 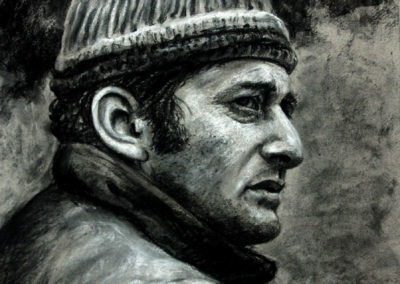 Because of my former sailing experience, I became the liaison between the crew and the artists. 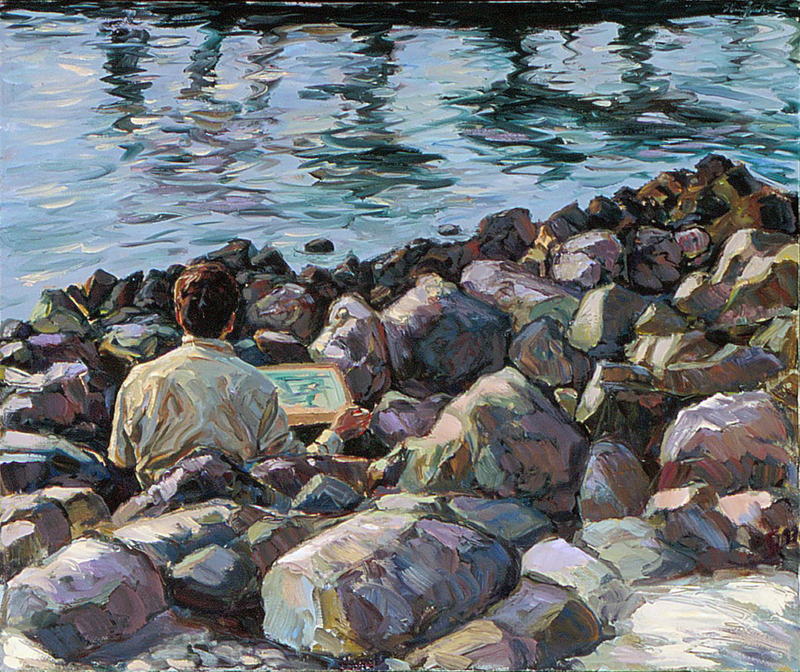 A large body of drawings and paintings resulted from that adventure. 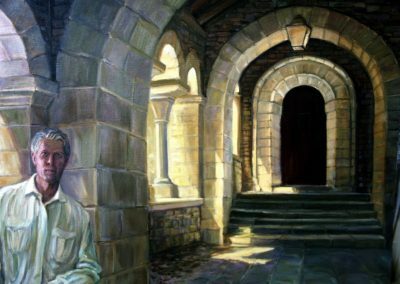 The following year I lived and taught in the Duke of Northumberland’s castle in Alnwick England, only 15 miles from the North Sea. 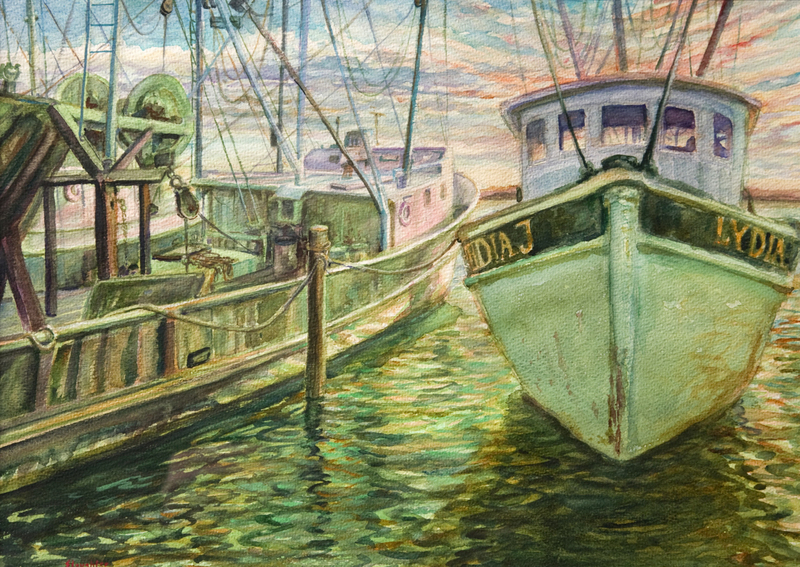 Consequently, I spent time recording my surrounding environment, some of which was the sea and local harbor life. 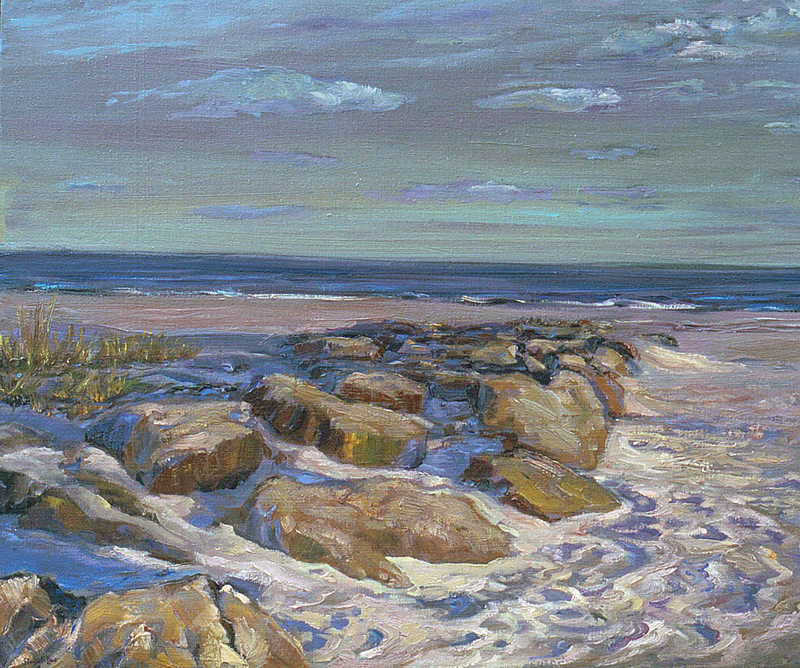 In 1983 I moved to southern California, spending the next decade living within a couple of miles of the ocean. 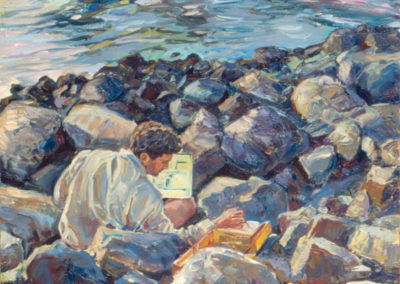 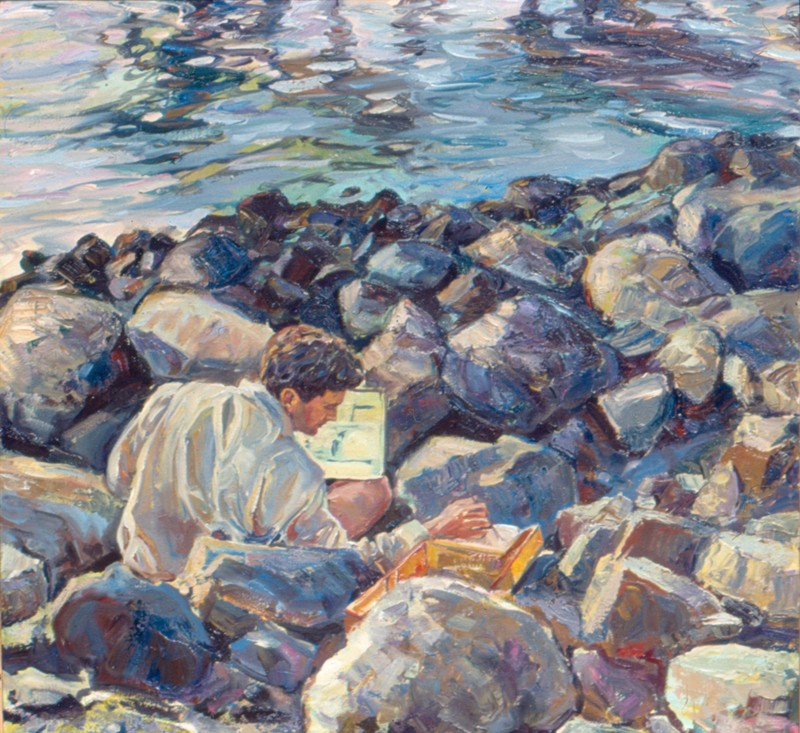 Although I explored alternative subject matter, which resulted in my receiving a research grant to Africa and later a Fulbright Fellowship to India, I was rarely far from the sea. 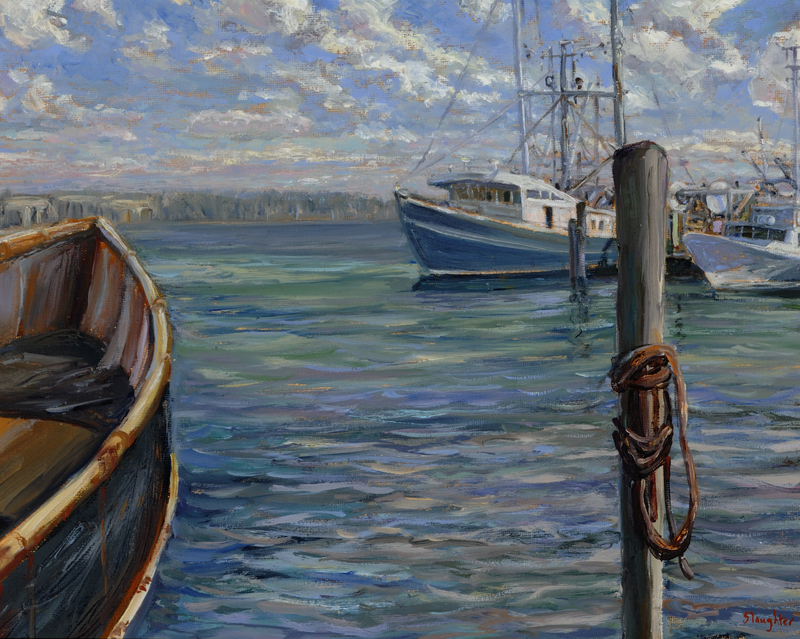 For more than two decades I have lived just a mile from the ocean in Southampton NY and often walk the beaches studying the ever-present nautical life. 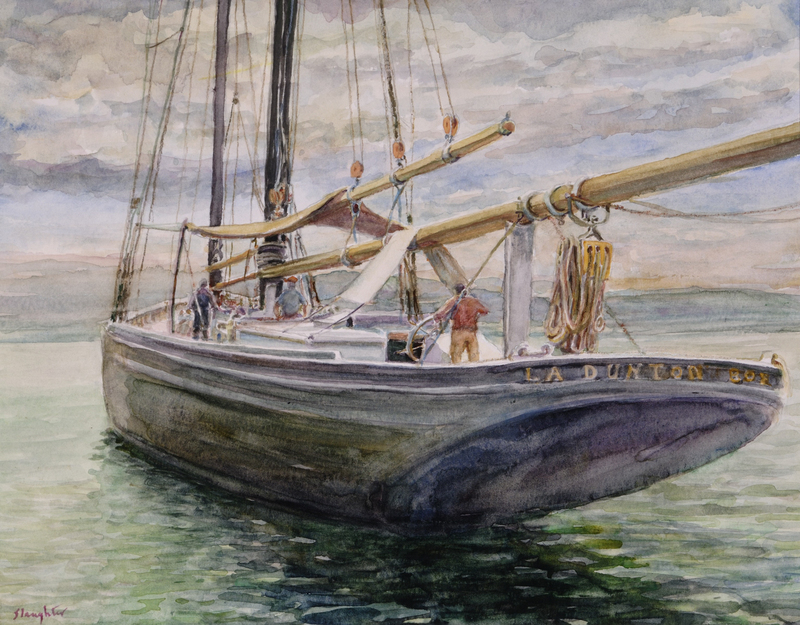 “A ship under sail is a perfect example of form and function. 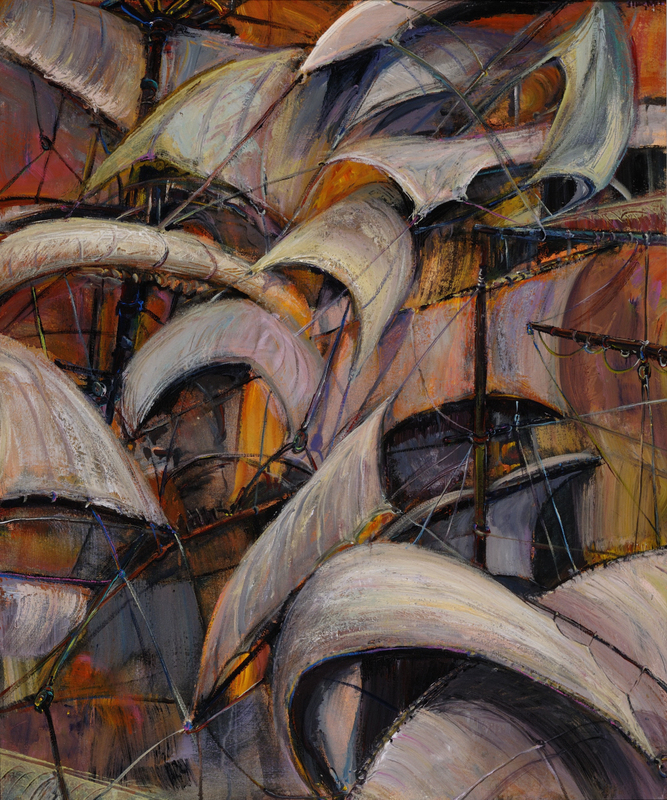 The intricate geometry of masts, spars and rigging reaching from sea to sky, forms an engaging mosaic of patterns. 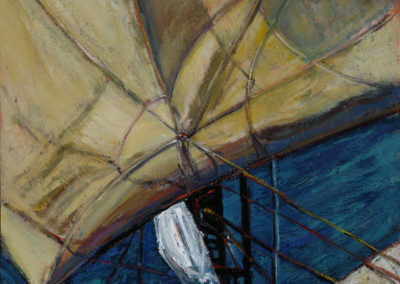 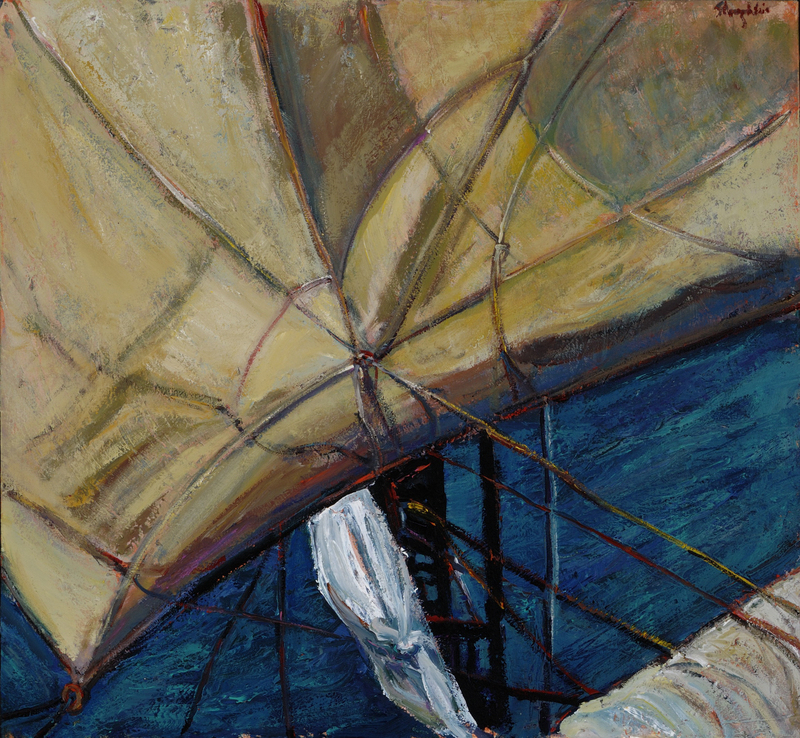 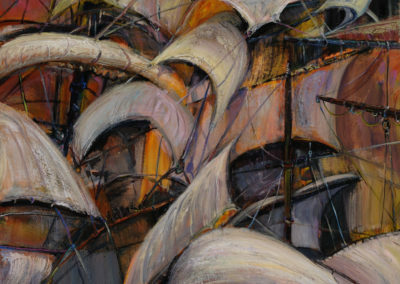 Sails, molded by wind, sun and shadow, suggest a sculptural abstraction”. These words, which I wrote more than 30 years ago in my artist statement for another exhibit, are just as pertinent today as I present this body of art also concerned with a maritime theme.